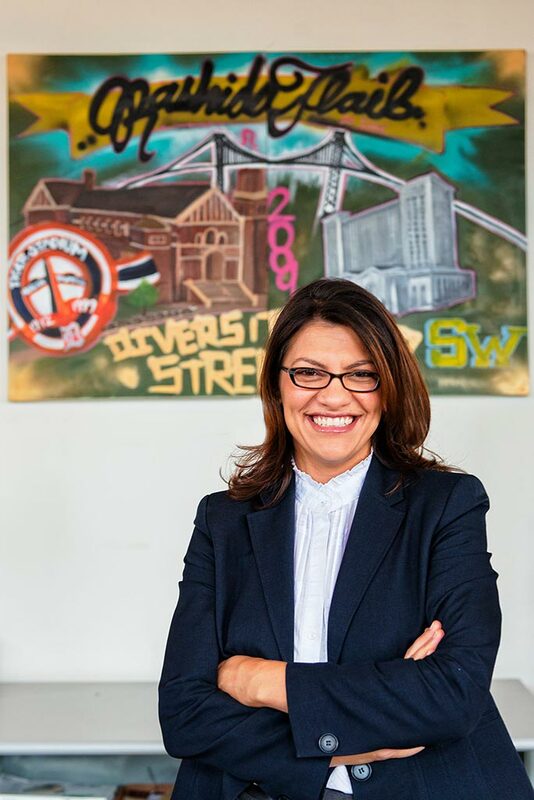 Alumna Rashida Tlaib becomes the first Muslim-American woman to serve in the Michigan legislature, and the second Muslim woman in the nation to be elected to a state legislature. 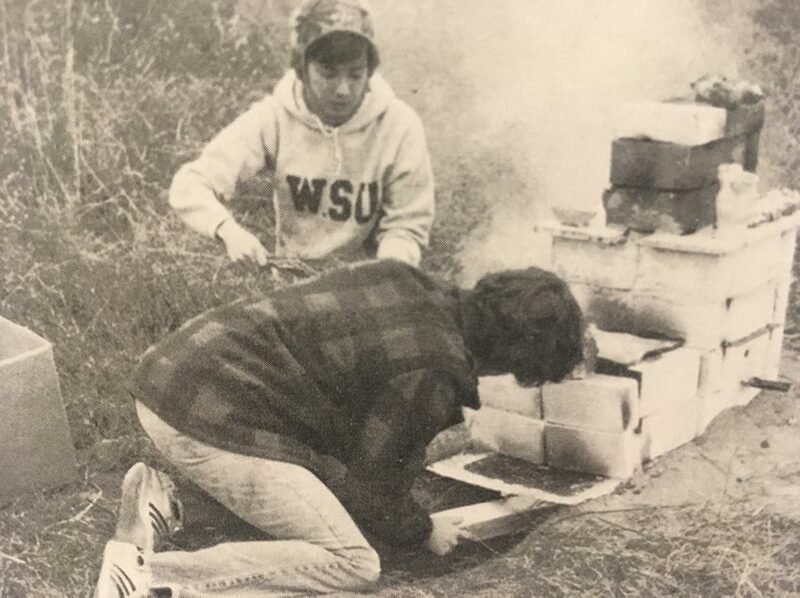 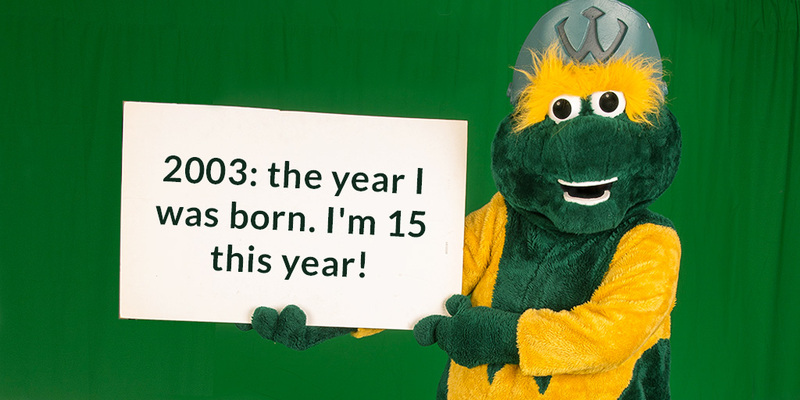 #wsu150. 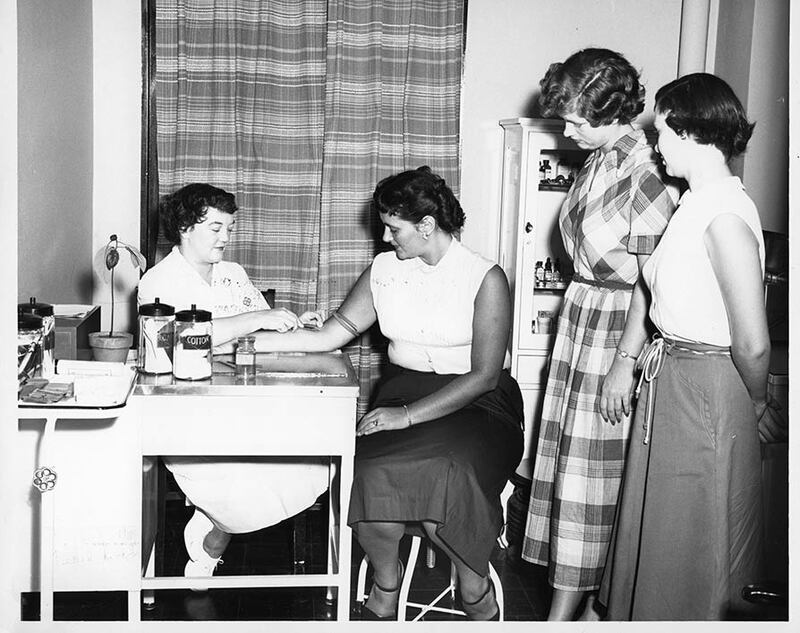 The College of Nursing charters the Center for Health Research, which is now the Office of Health Research. 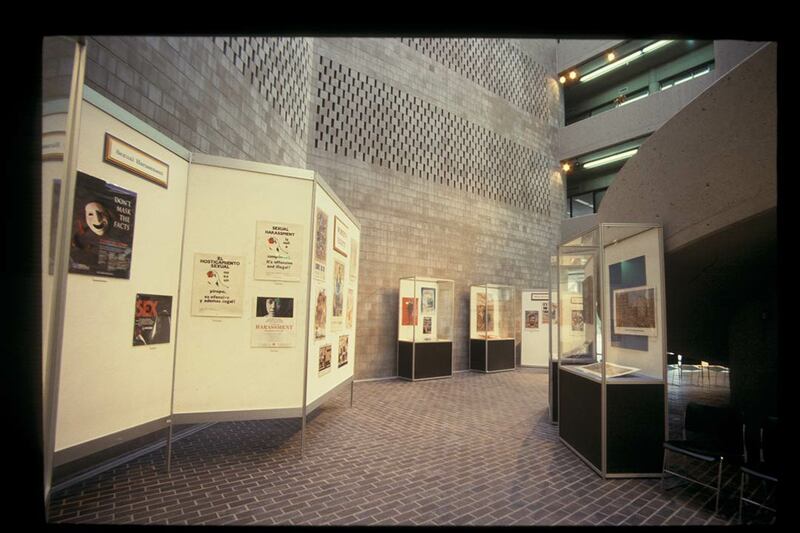 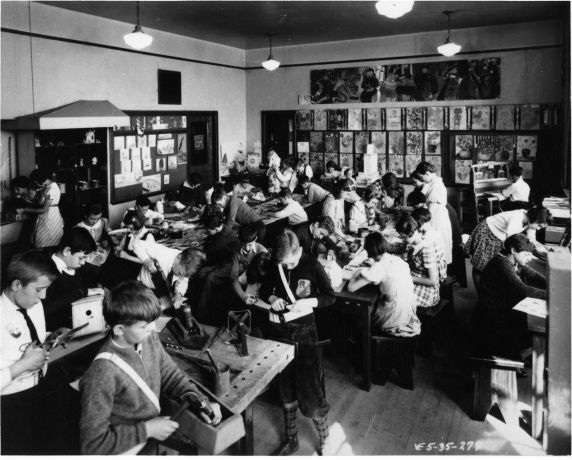 The center was the first of its kind to be affiliated with an educational institution. 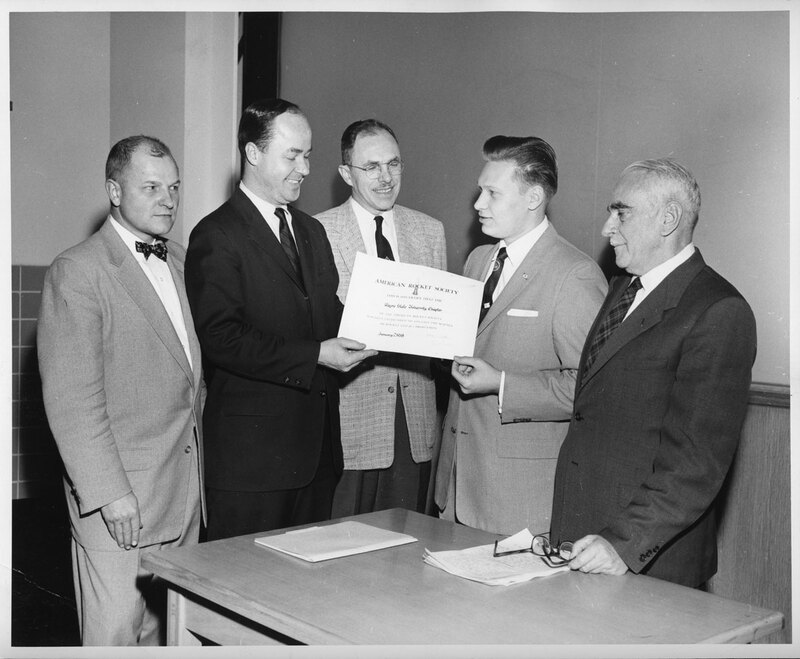 Wayne State’s student section of the American Rocket Society receives its charter. 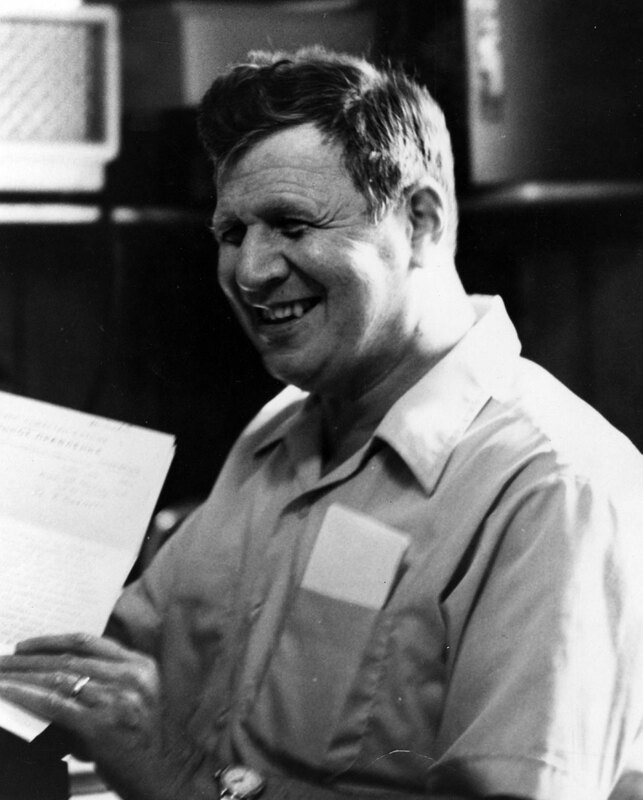 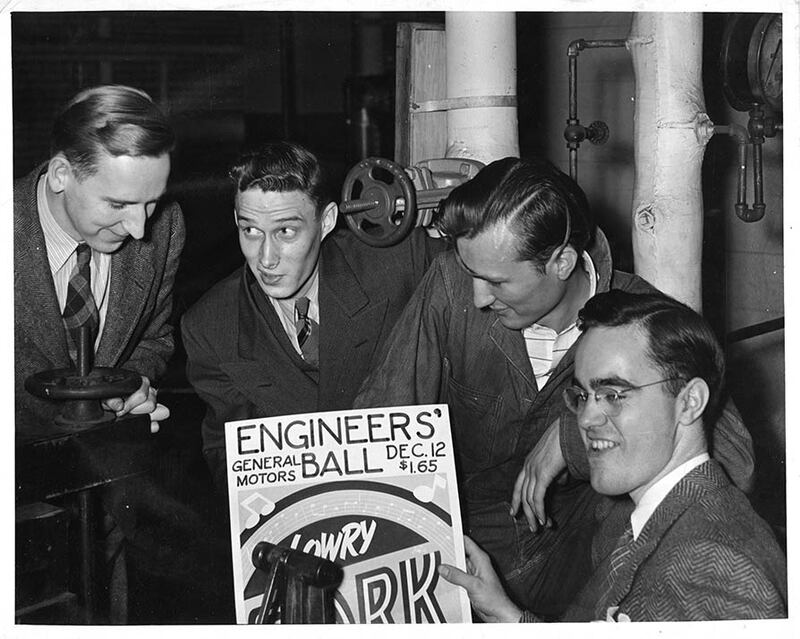 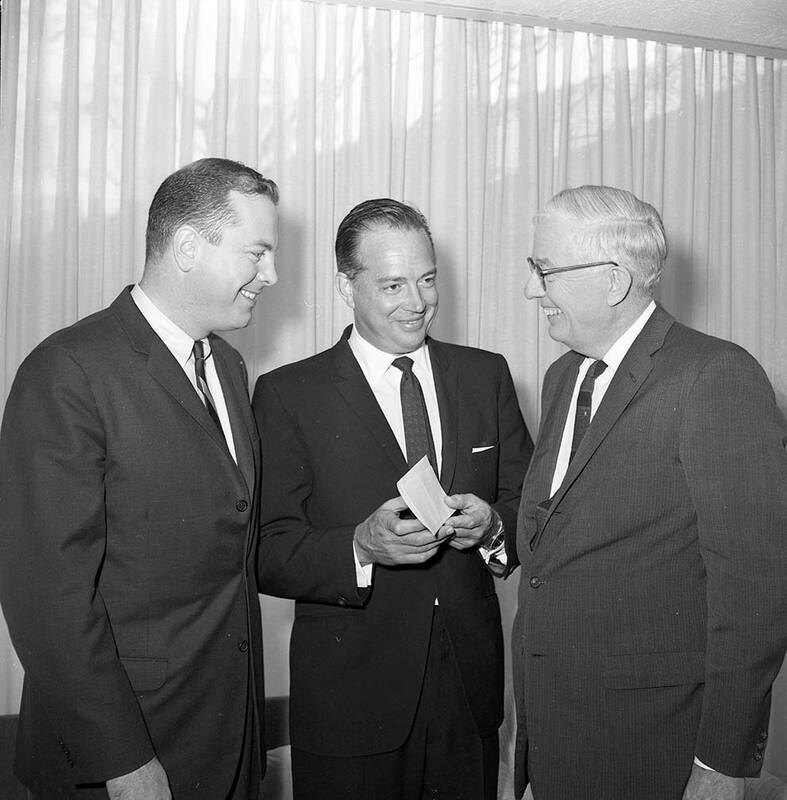 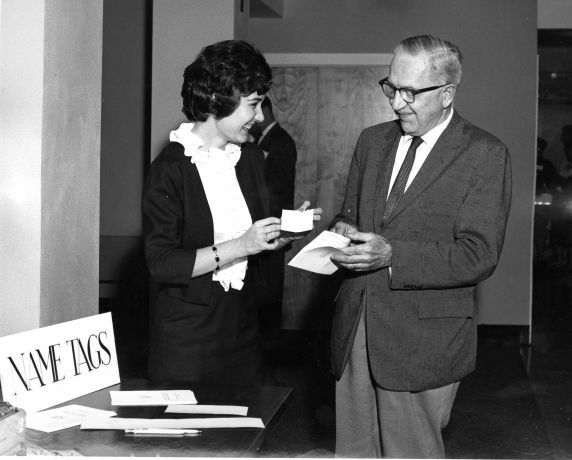 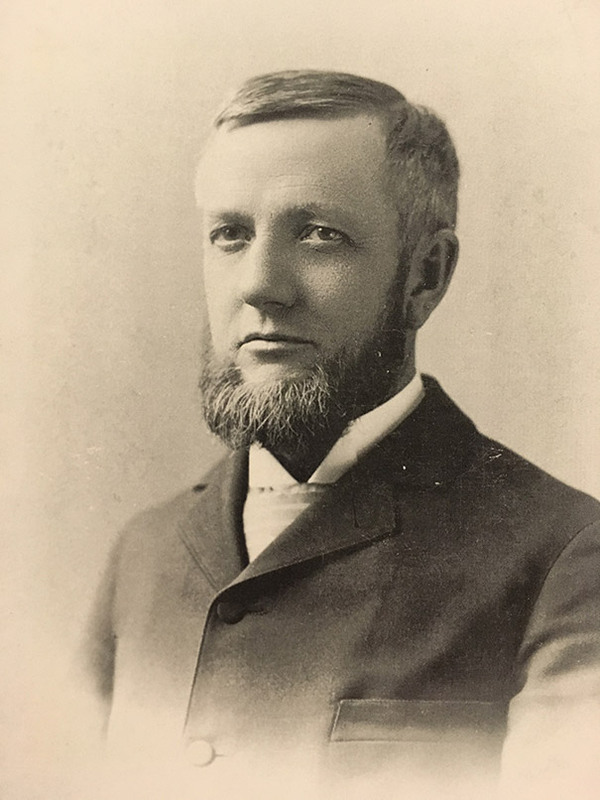 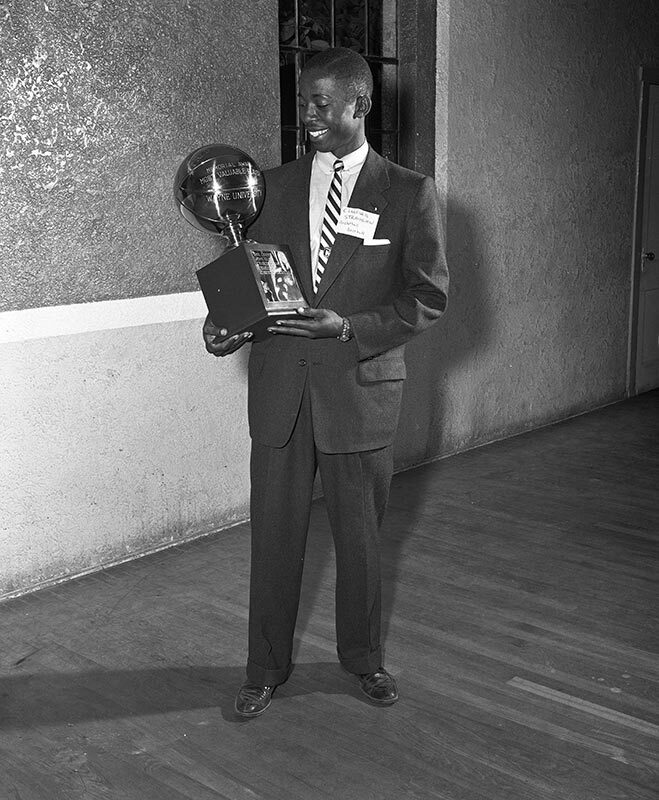 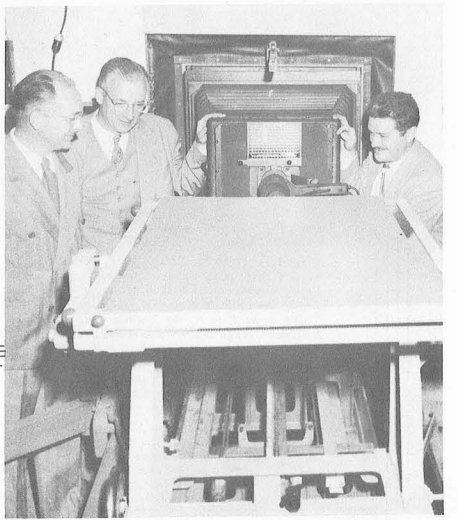 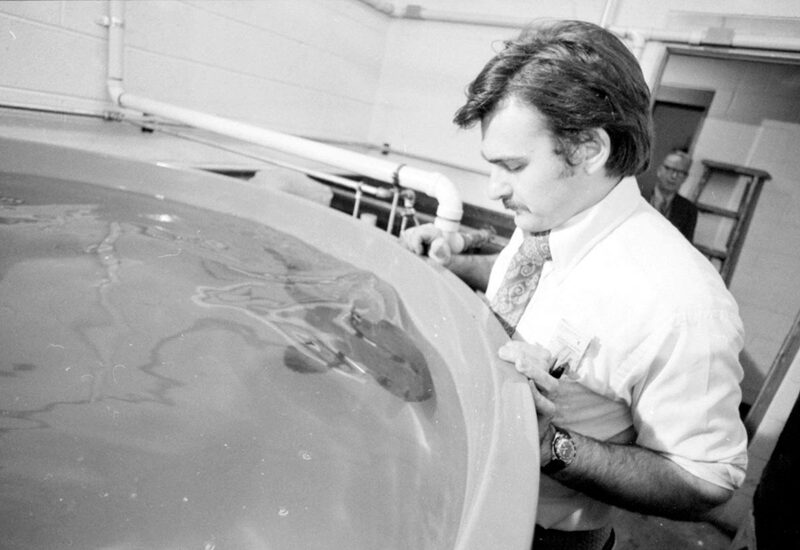 Professor Arthur Locke, chair of the university’s aeronautical engineering department, served as the group’s advisor. 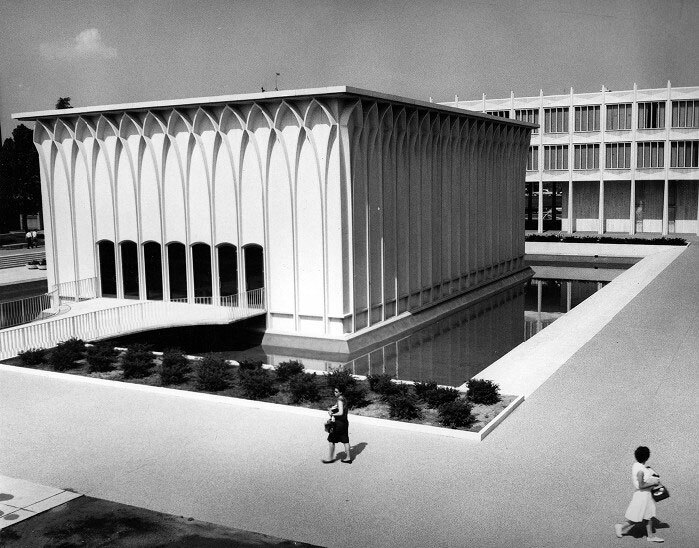 Minoru Yamasaki and Associates design Wayne State’s College of Education Building. 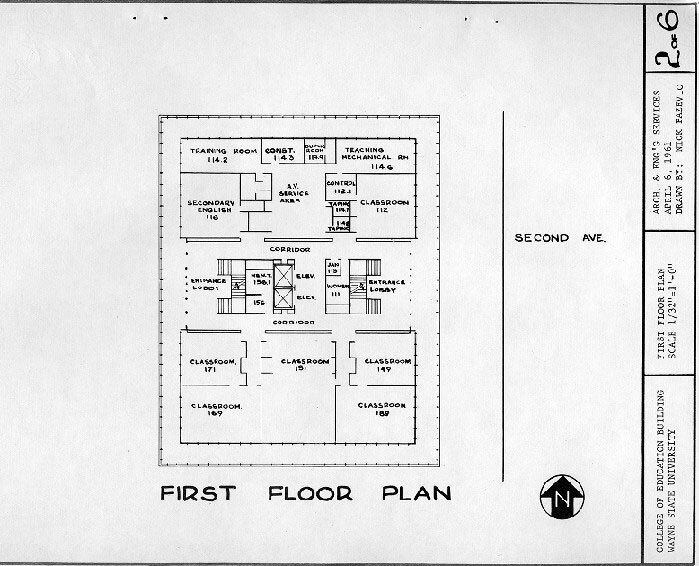 The architectural concept relied on Yamasaki’s signature geometric patterning, as shown in this floorplan. 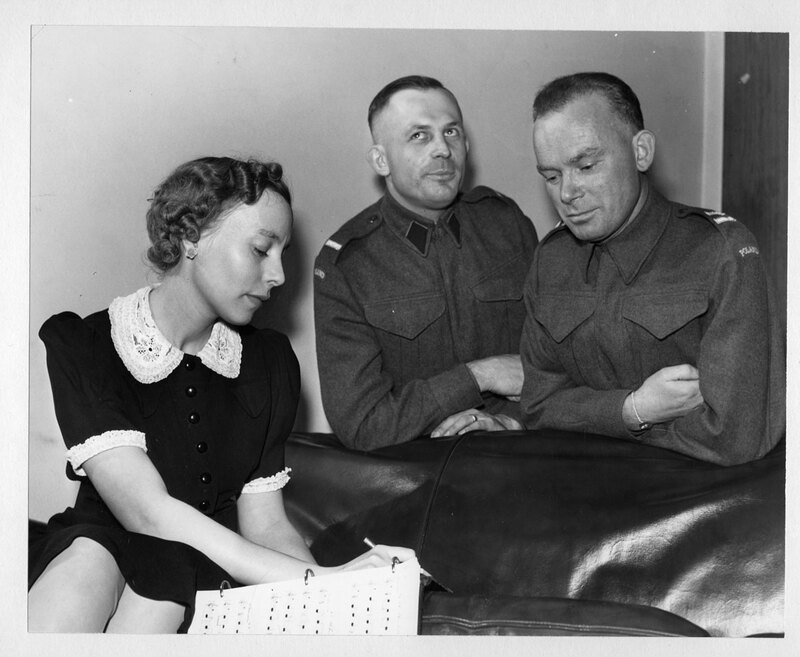 Polish refugee soldiers hum old folk tunes while a student dictates the music for a Polish folklore project. 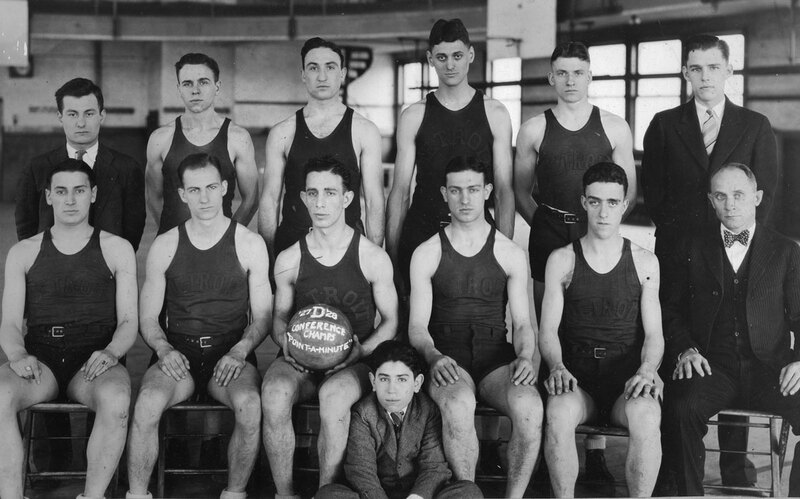 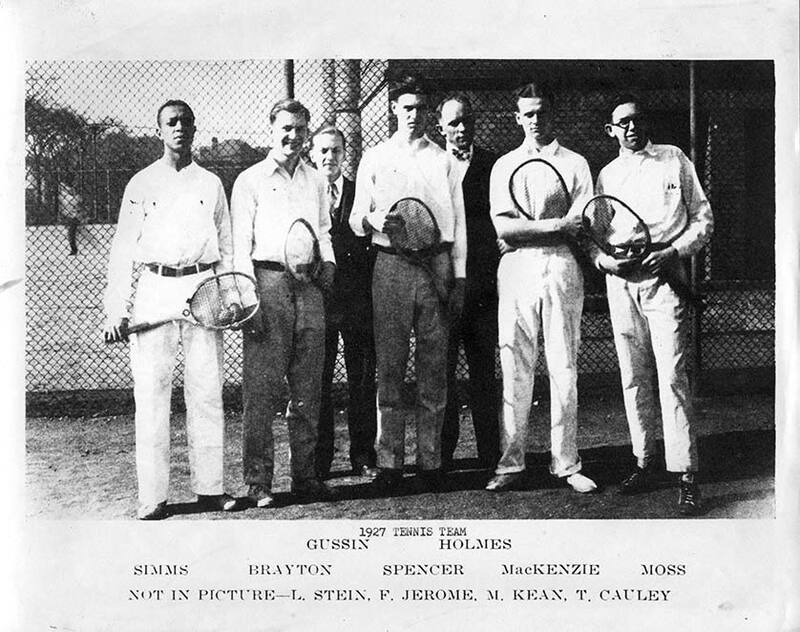 Alumni athletes from 1917-1923 gather for a reunion. 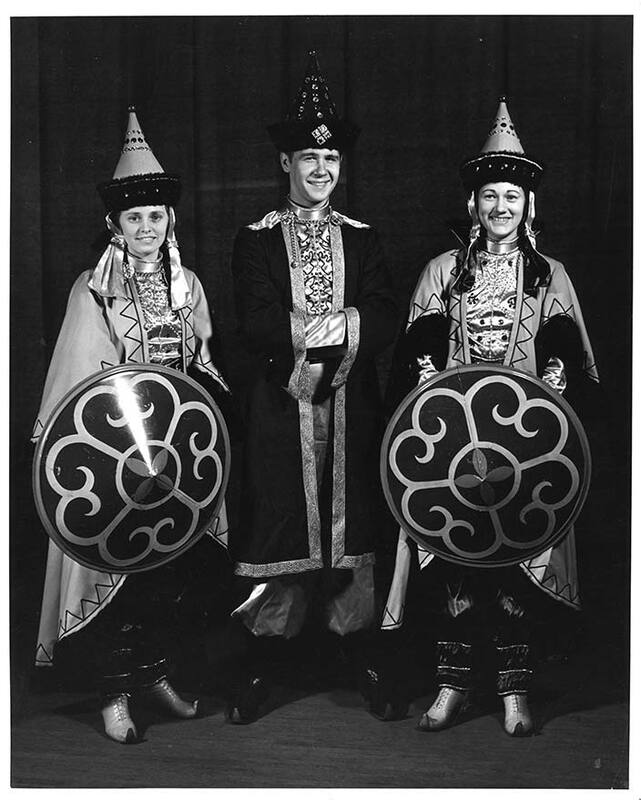 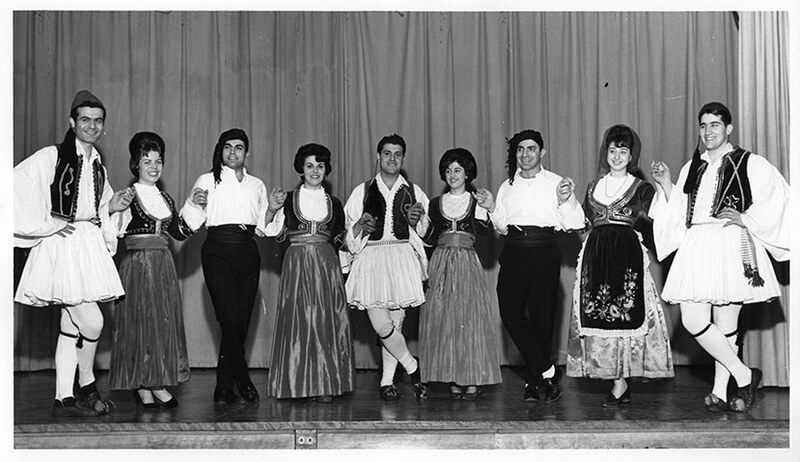 A group of Tartars enjoys a university dance. 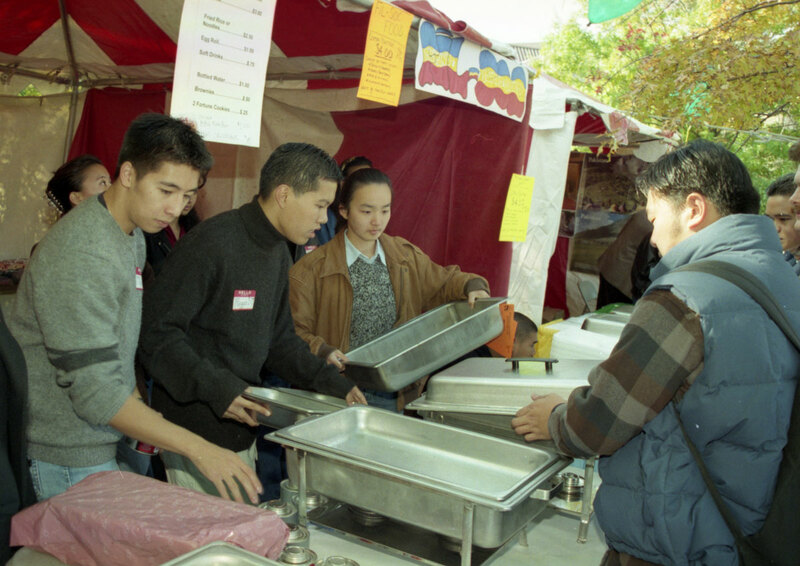 The Filipino Student Society sets up its food booth during Wayne State’s 29th annual International Student Fair. 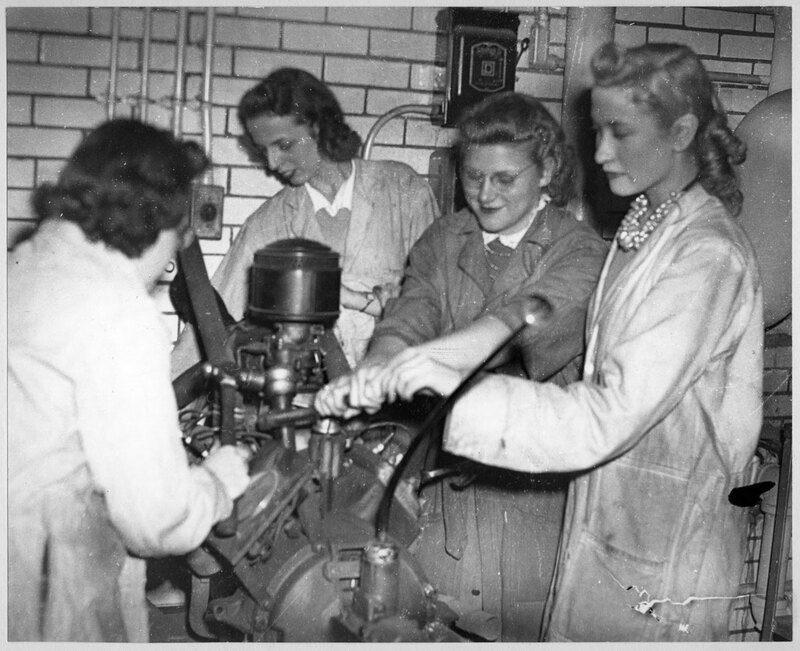 Students work on an engine in the engineering lab. 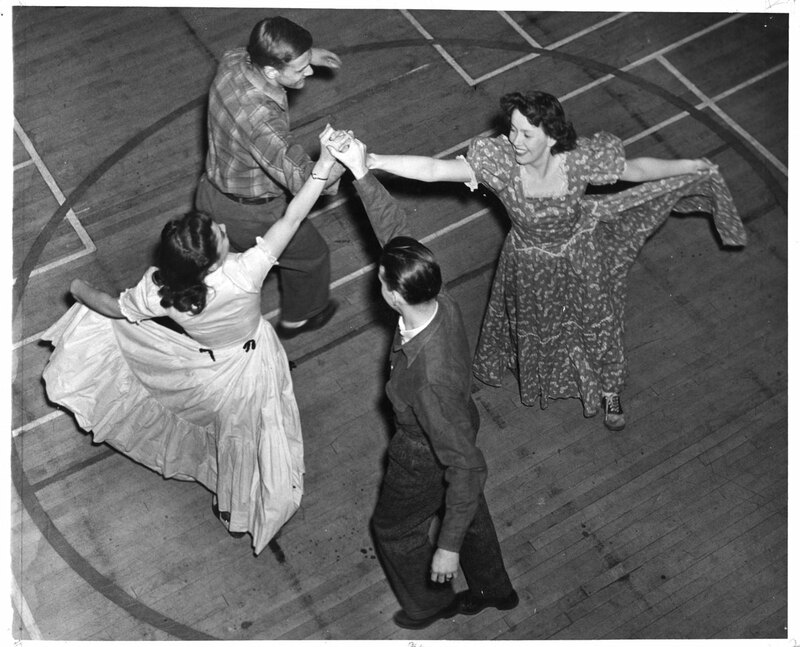 Wayne University students participate in a dance class. 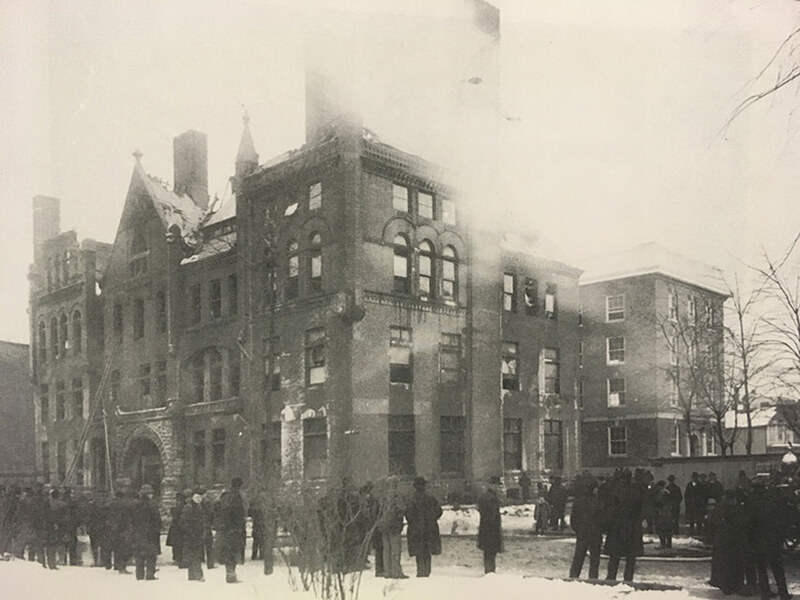 The Detroit College of Medicine and Surgery is presented with the Red Cross flag for its role in staffing 36th General Hospital during World War I. 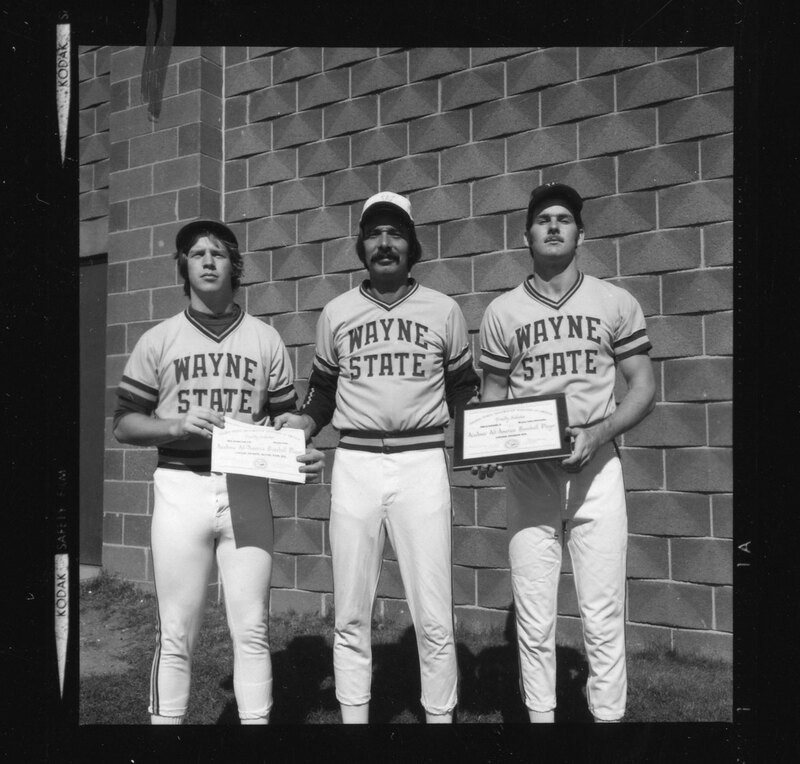 Baseball players Rex Ledbetter and Tim Flannery receive Academic All-American plaques. 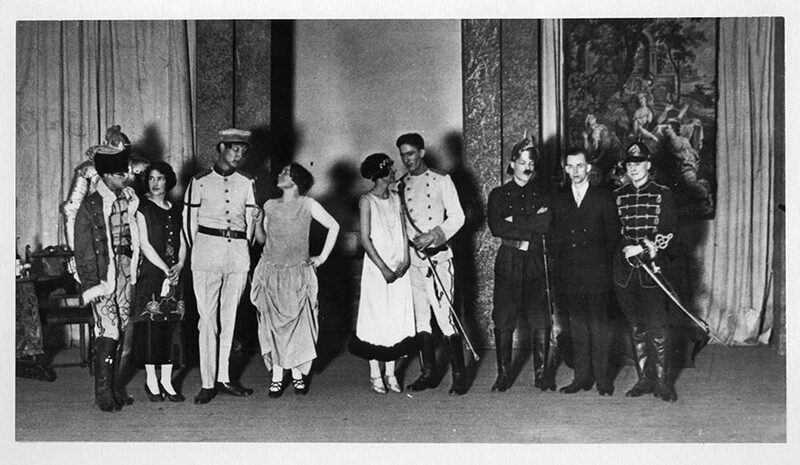 The debate squad poses for a photo. 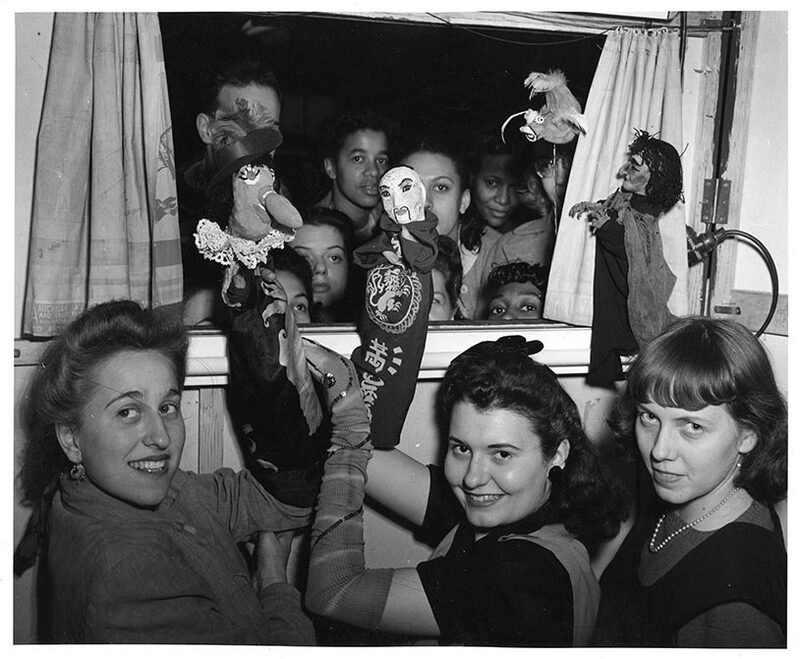 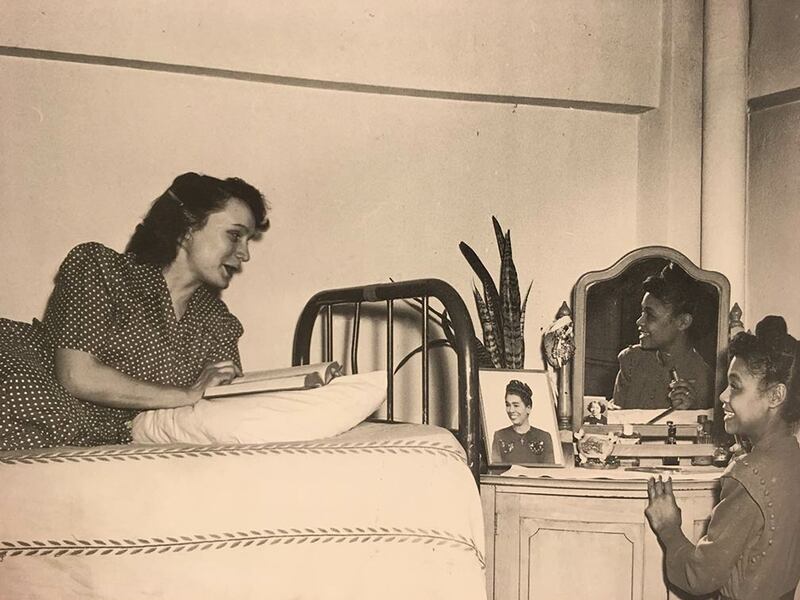 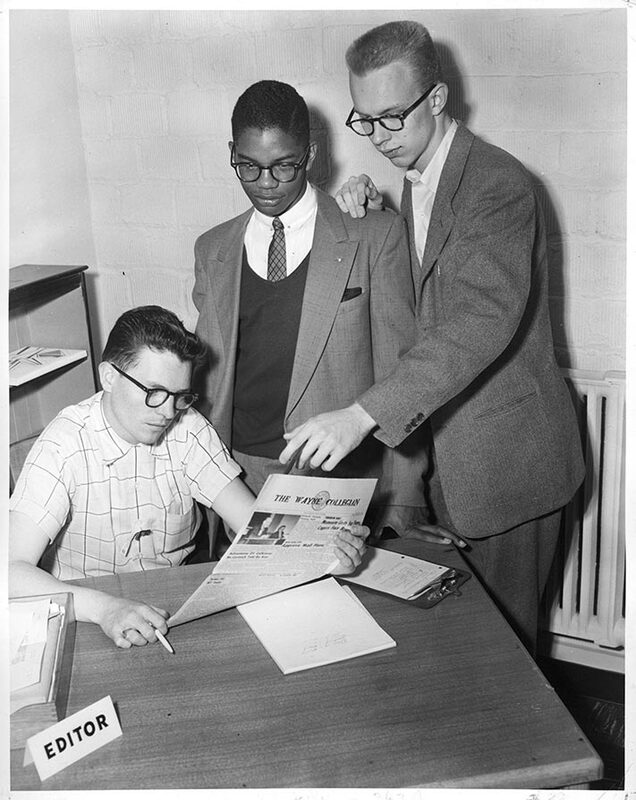 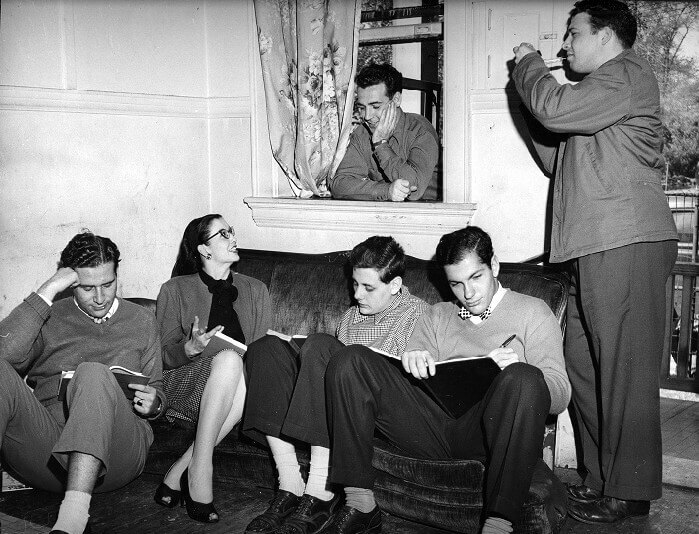 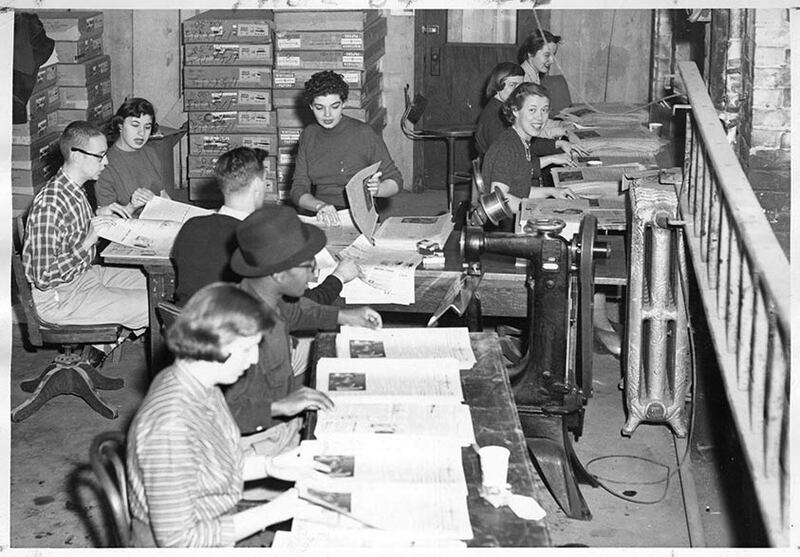 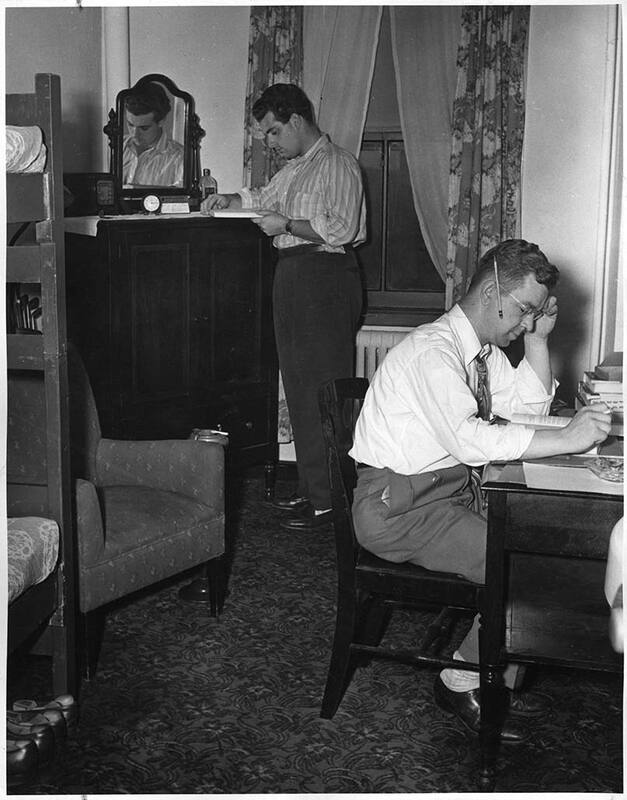 Wayne State students study in their dorm room. 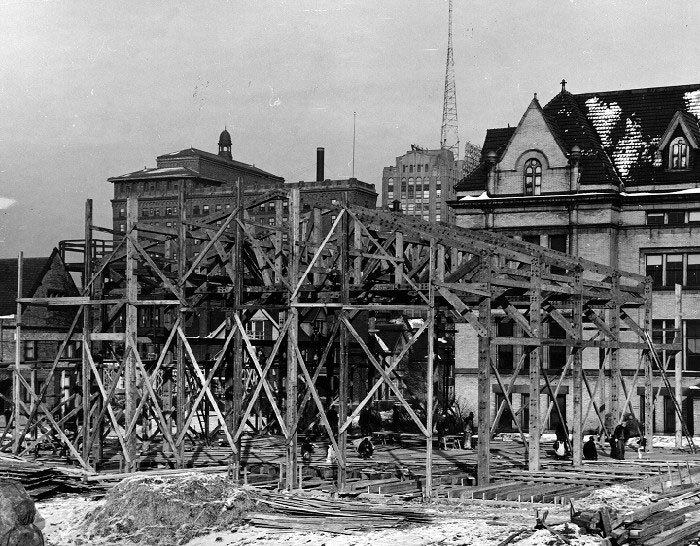 Construction begins on an addition to Old Main. 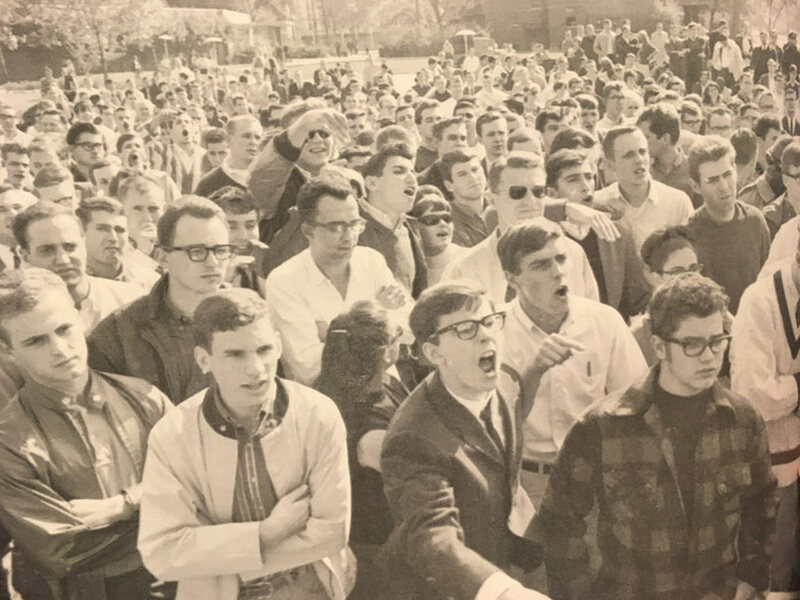 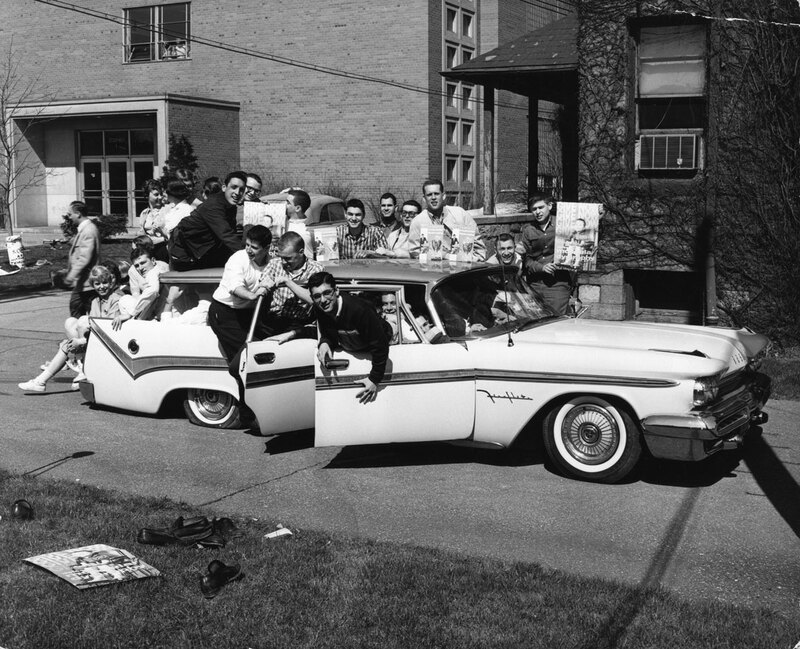 To help fight muscular dystrophy, the Sigma Alpha Mu fraternity fulfills a fundraising challenge to pack 51 Wayne State students in a 1959 DeSoto Fireflite. 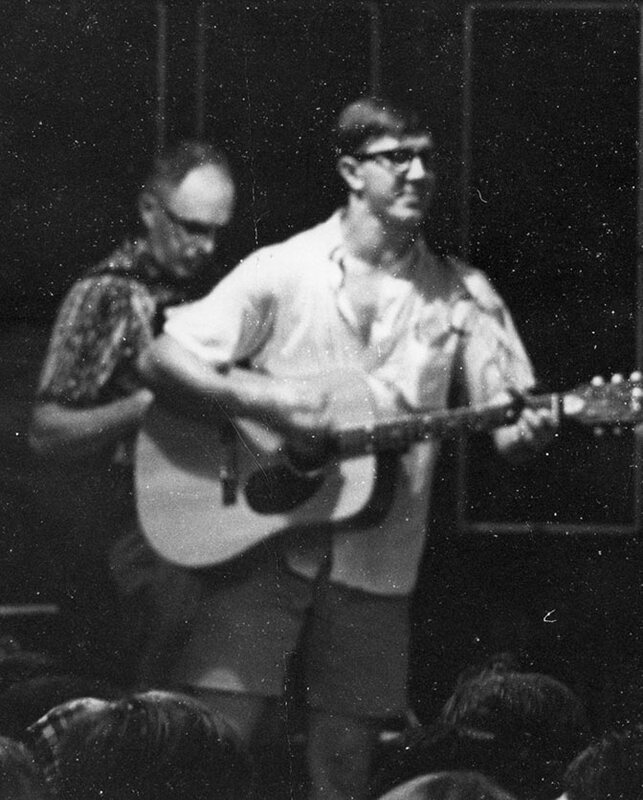 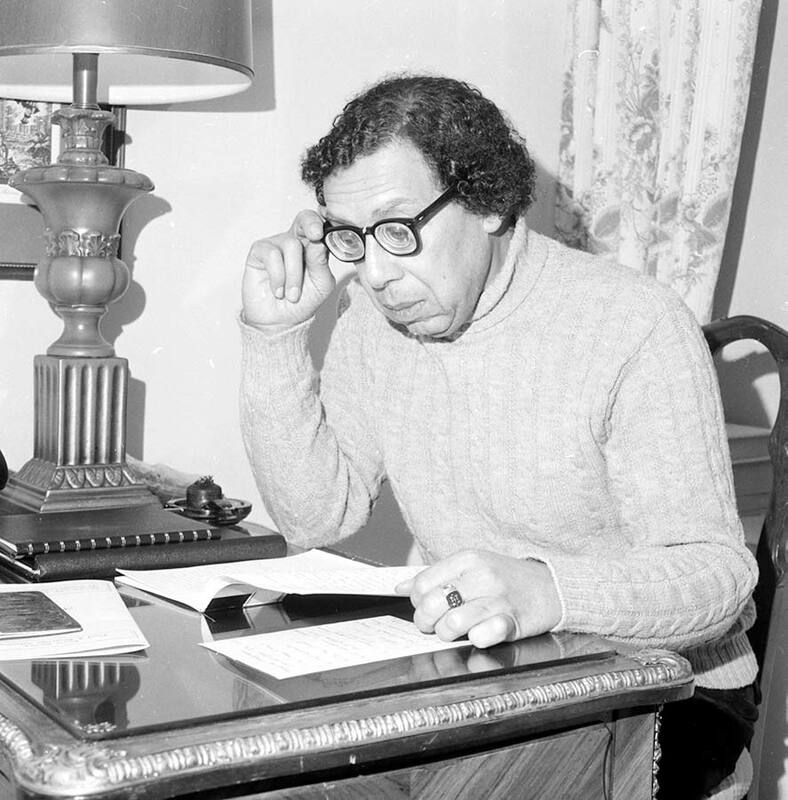 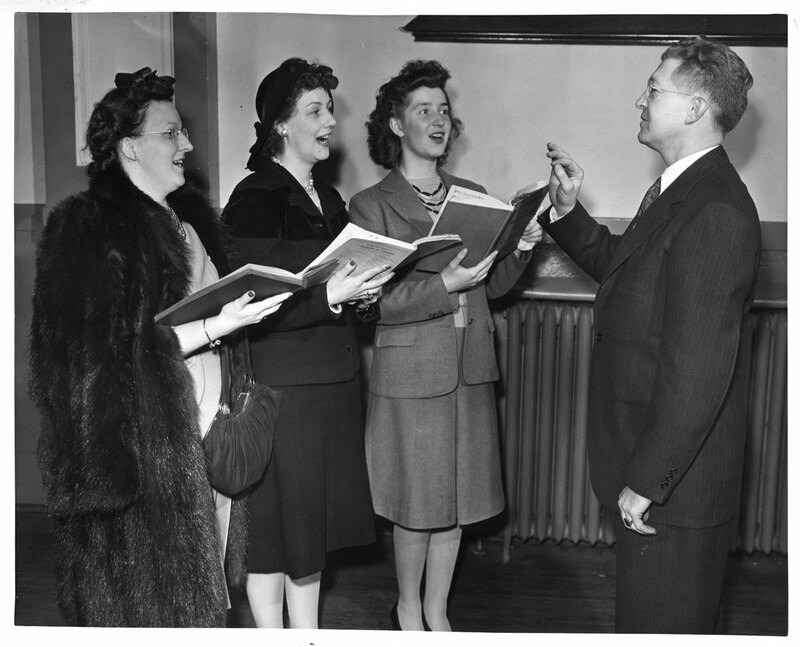 "Hymn to Wayne" is written by Nicholas Stanley Oates. 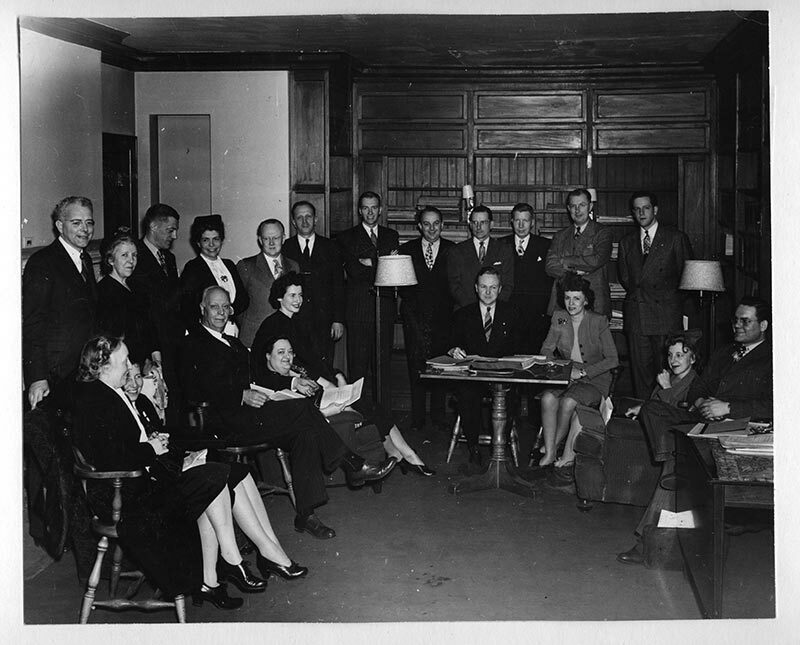 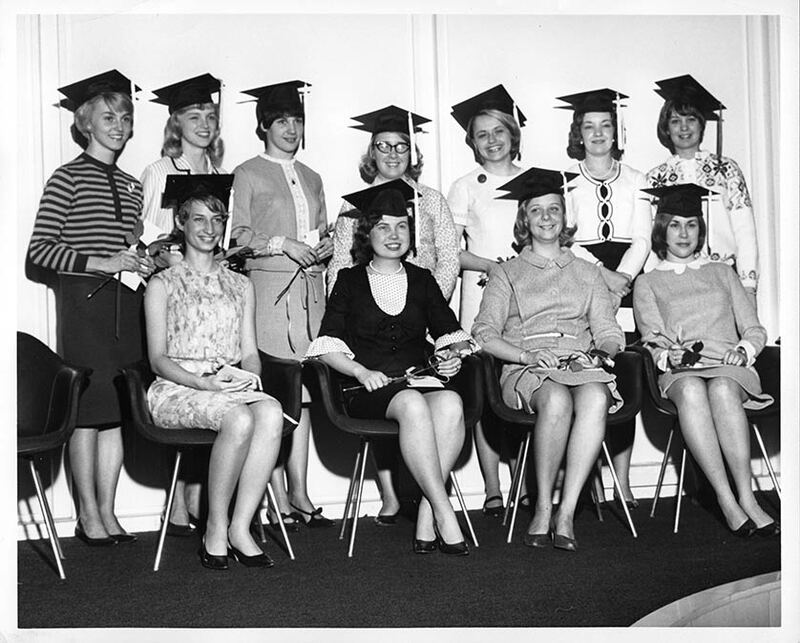 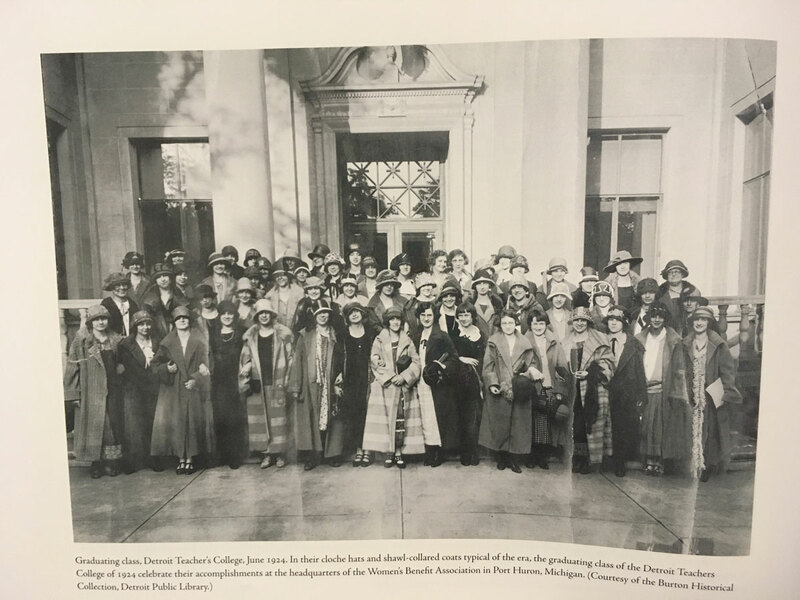 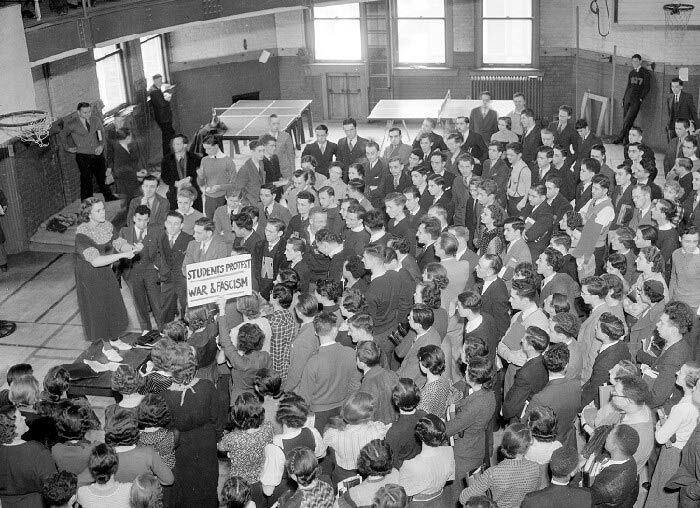 The graduating class of the Detroit Teachers College, a predecessor of Wayne State University’s College of Education, celebrates at the headquarters of the Women’s Benefit Association in Port Huron. 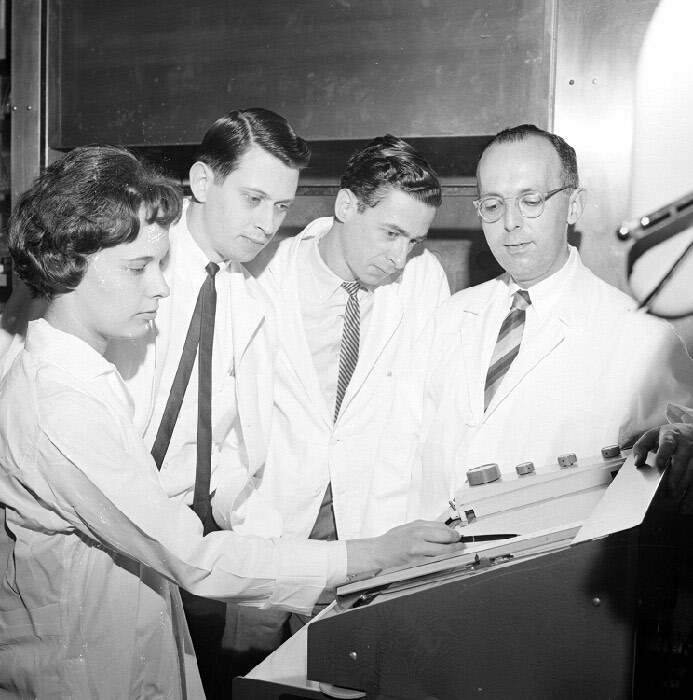 Chemical engineering faculty members prepare for an upcoming presentation. 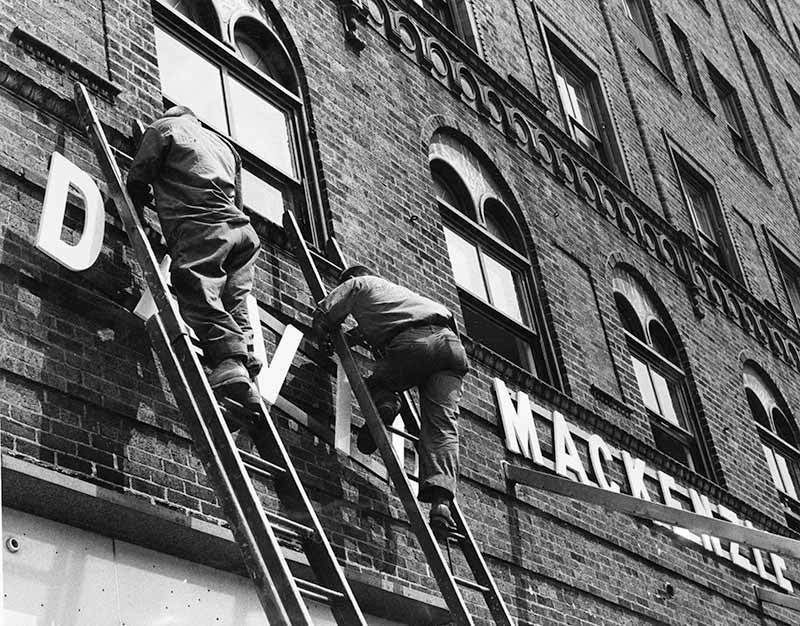 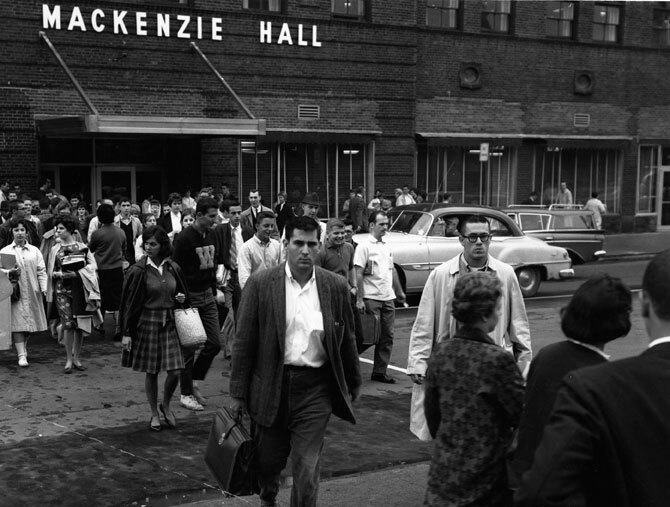 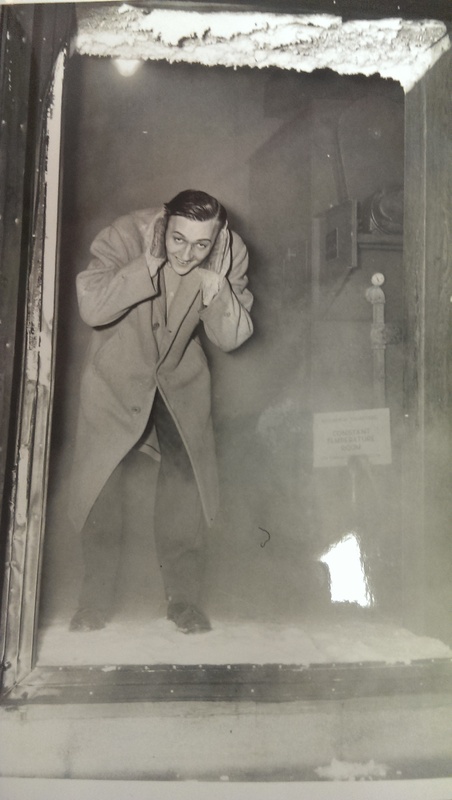 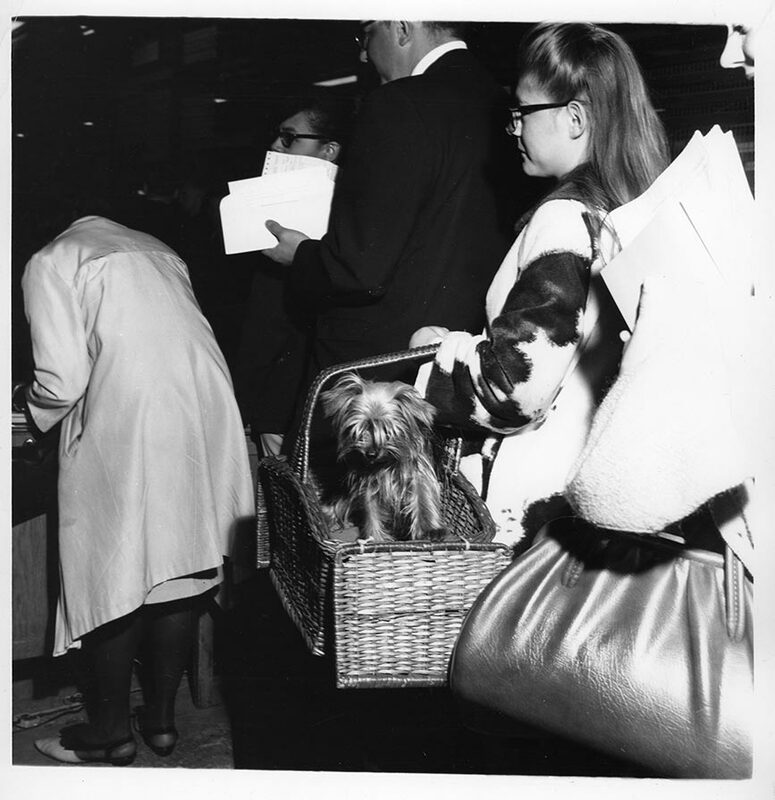 Students leave Mackenzie Hall, Wayne State’s original student center. 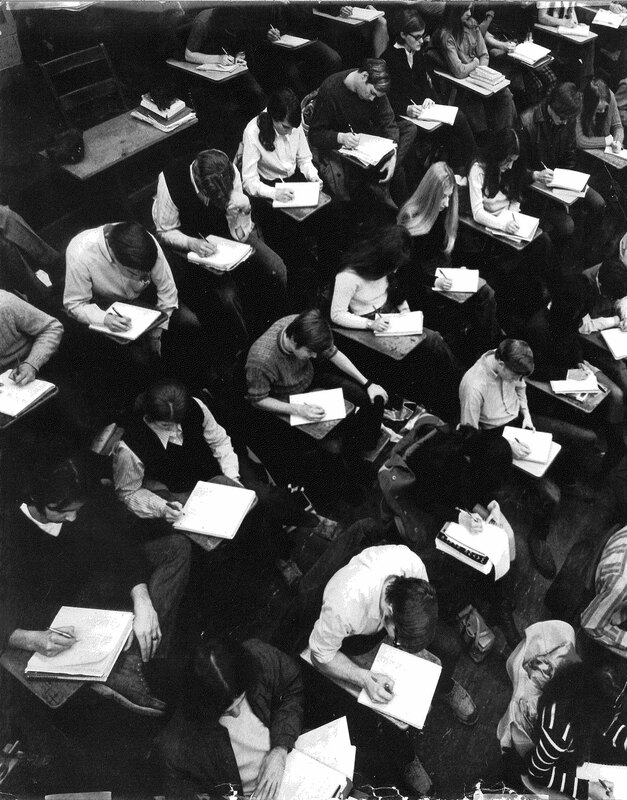 Students take their final exams in the College of Engineering. 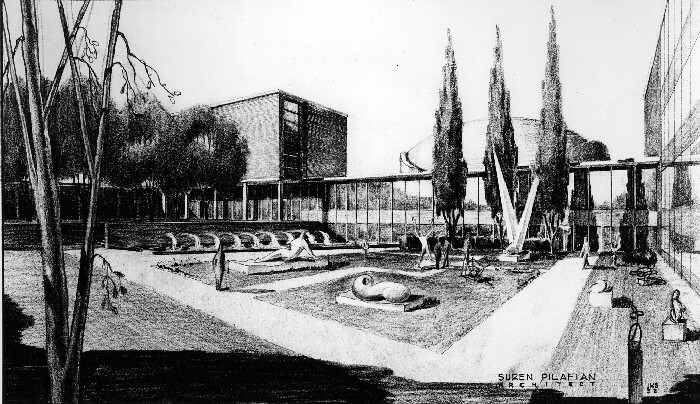 An architectural rendering of the new Community Arts Building. 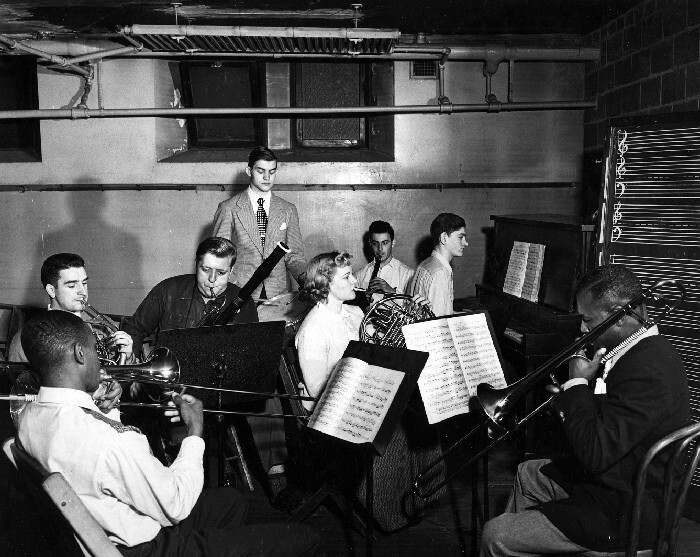 Students participate in a music class. 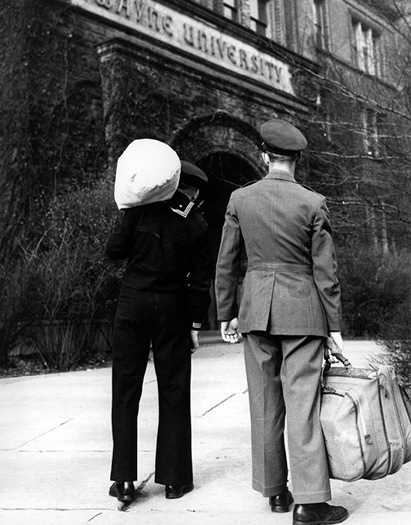 Wayne State removes the last of the World War II barracks from campus. 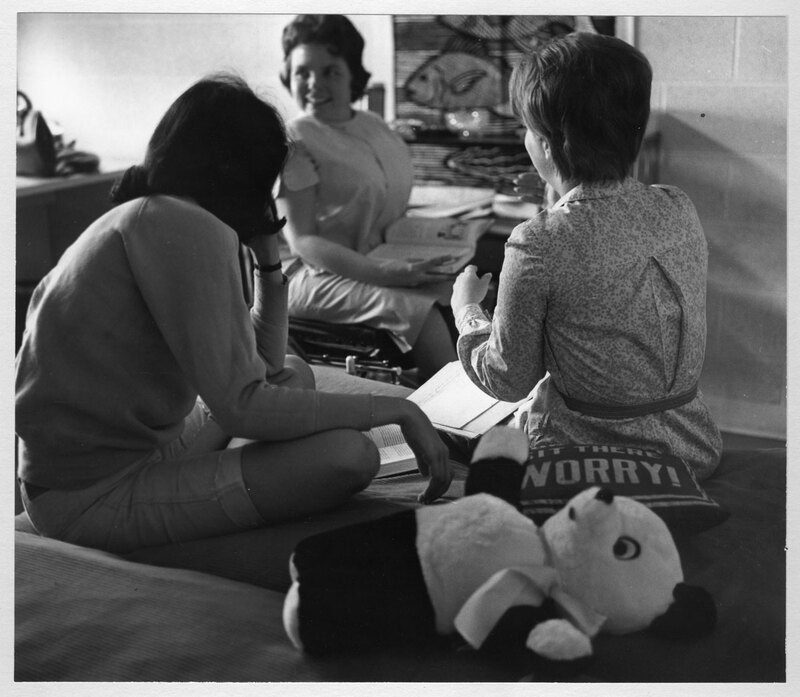 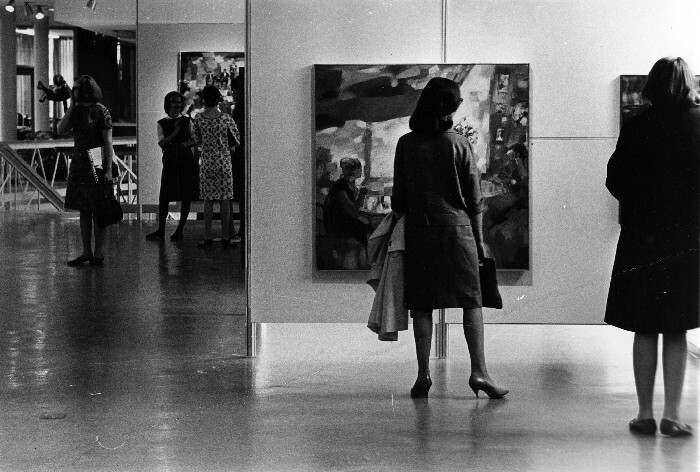 They had been used as temporary classroom space during the post-war influx of students. 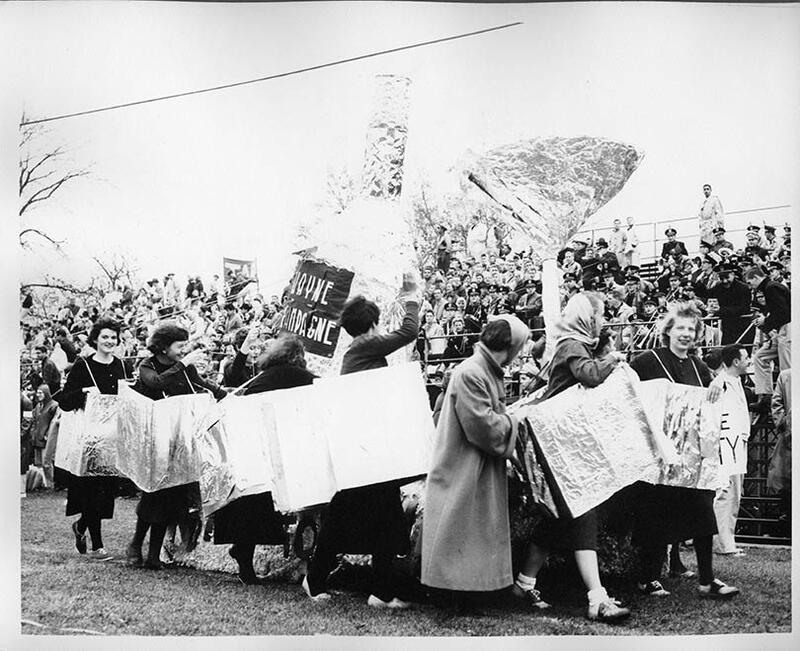 Wayne University students perform Oedipus Rex. 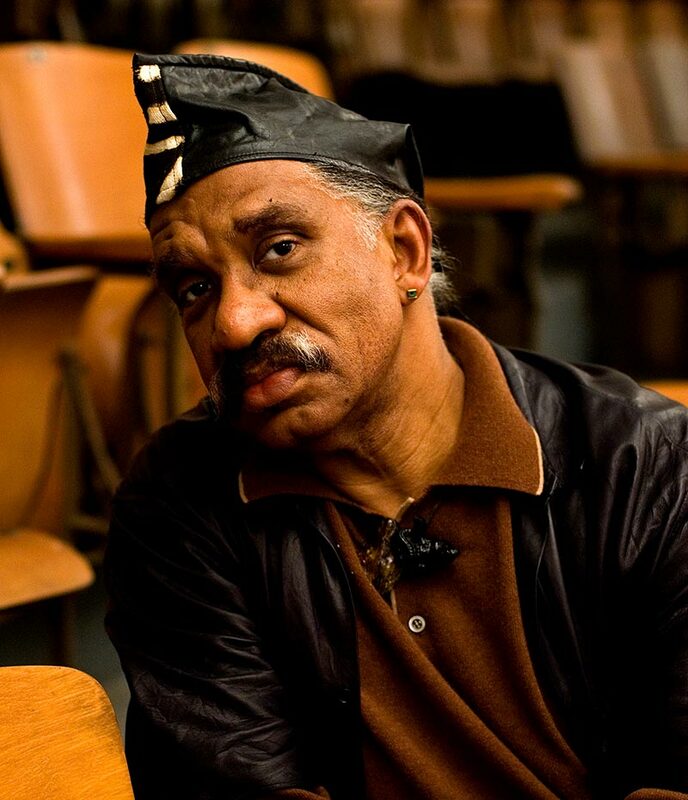 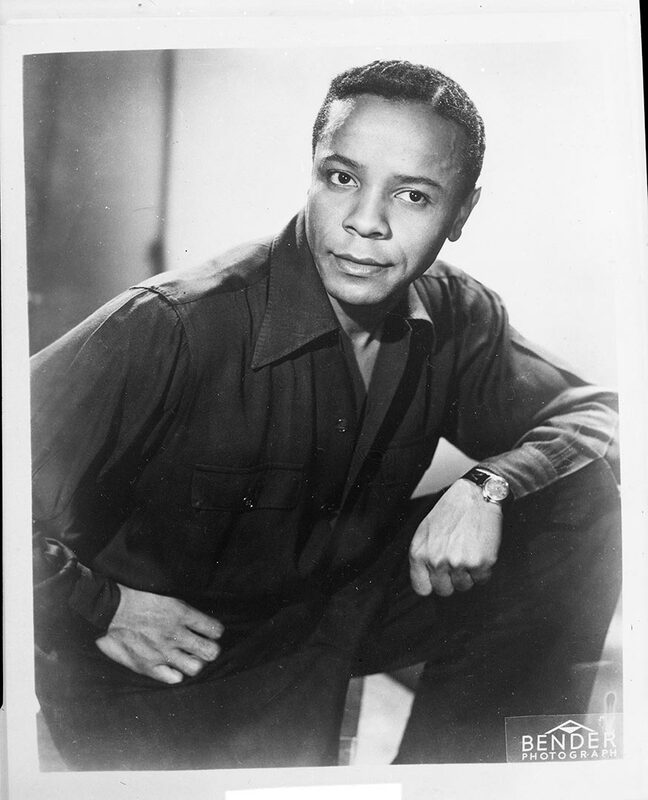 At center stage is Grammy Award-winning alumnus George Shirley. 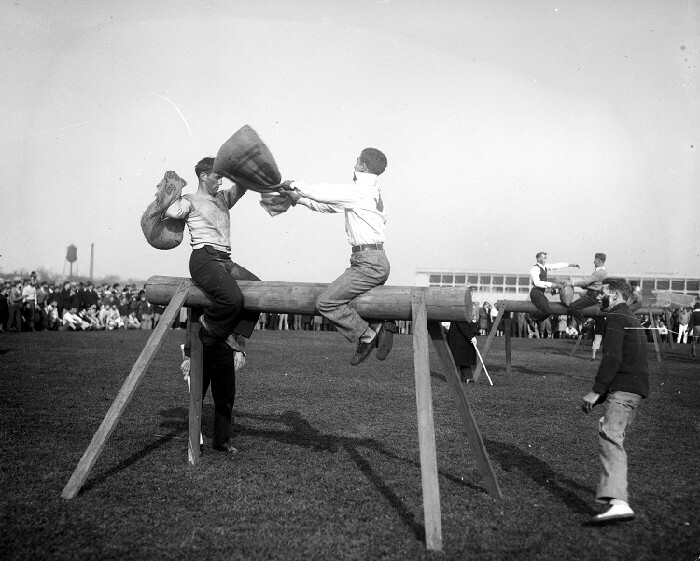 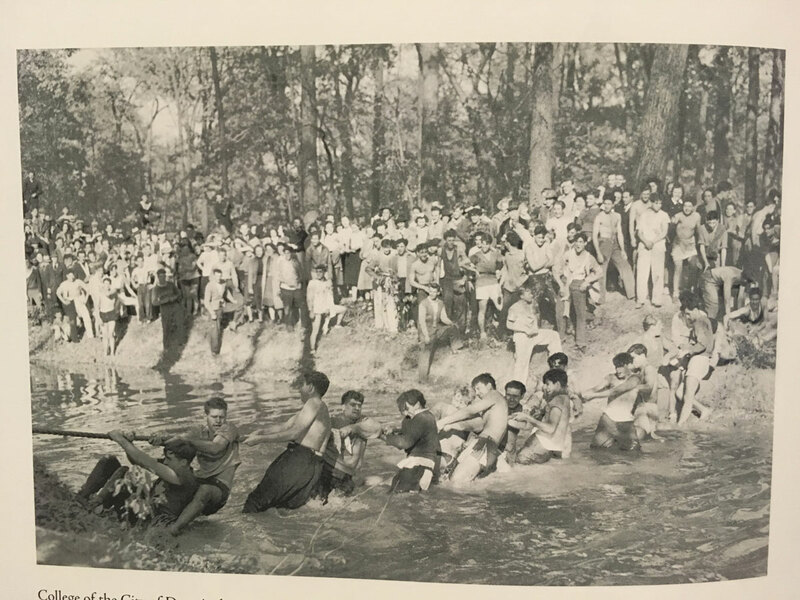 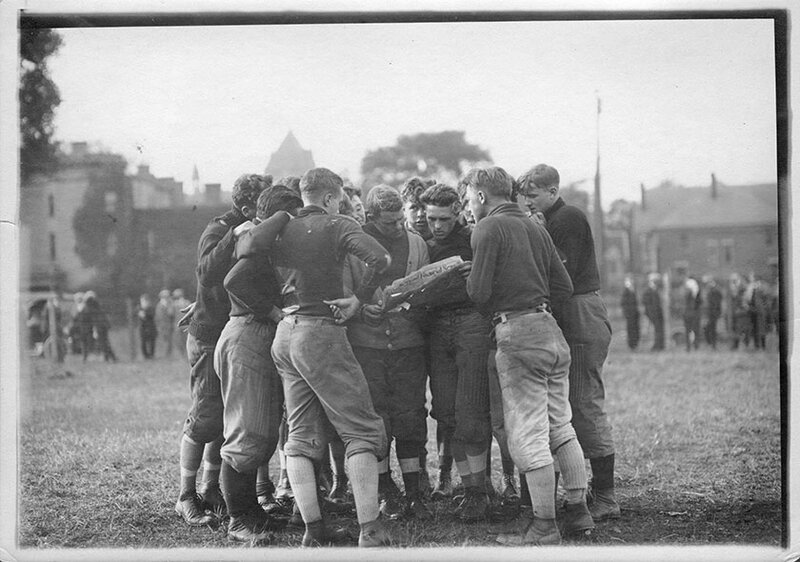 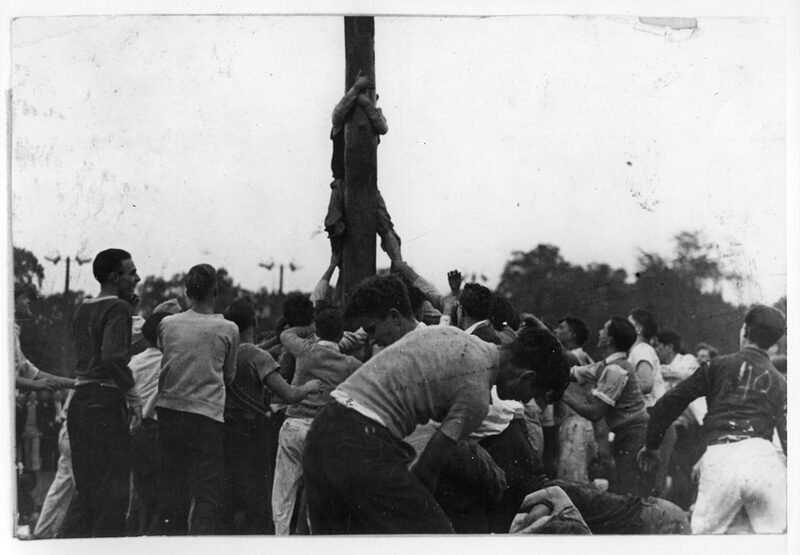 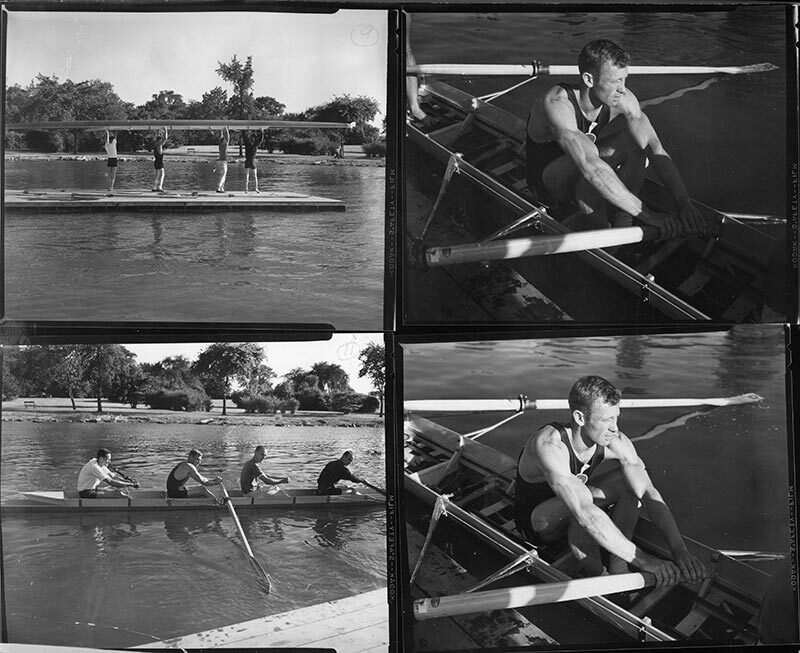 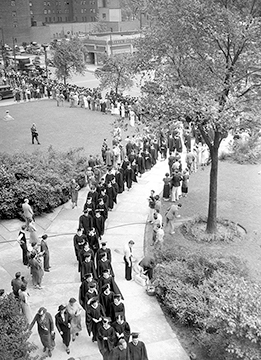 Students from the College of the City of Detroit participate in a tug-of-war during freshman class rush, which was held on Belle Isle throughout the 1920s and ’30s. 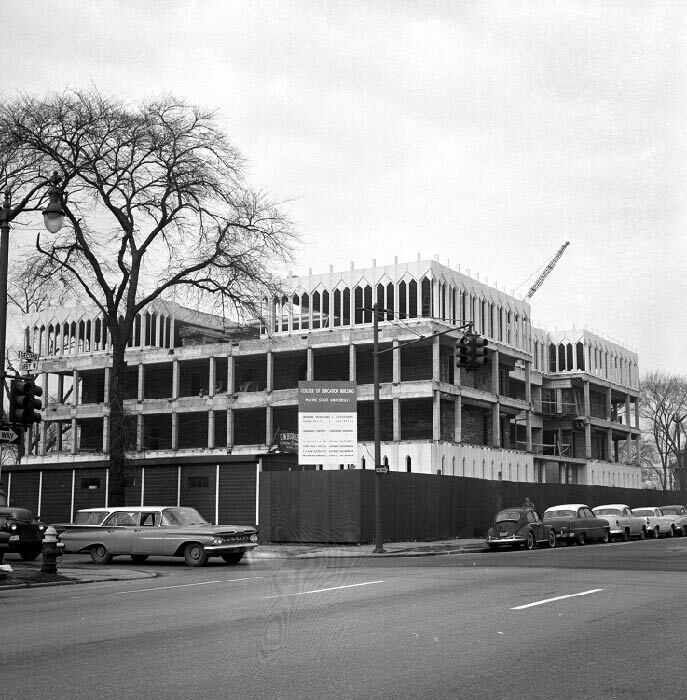 Wayne State begins construction on the Faculty/Administration Building. 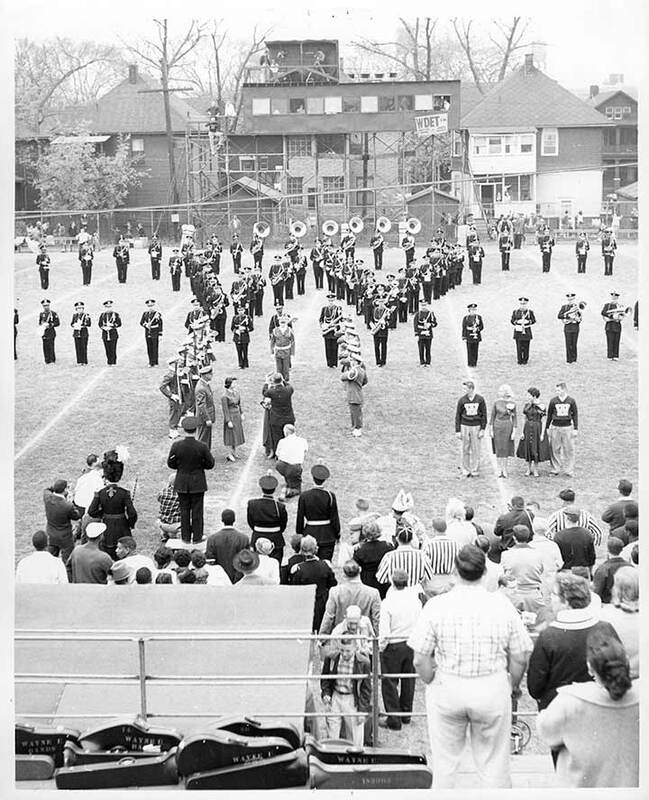 Now commonly known as FAB, it was completed in 1990. 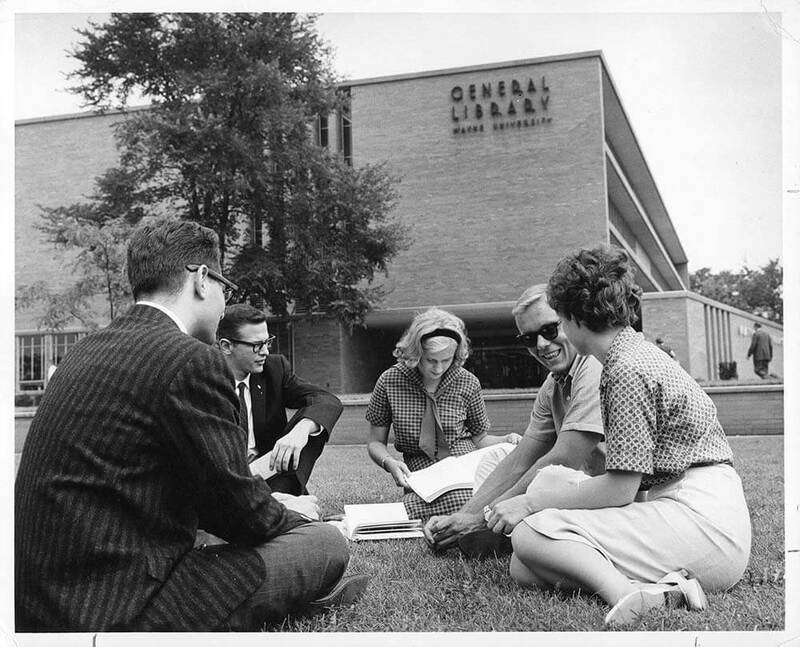 Students relax and play outside the Student Center Building. 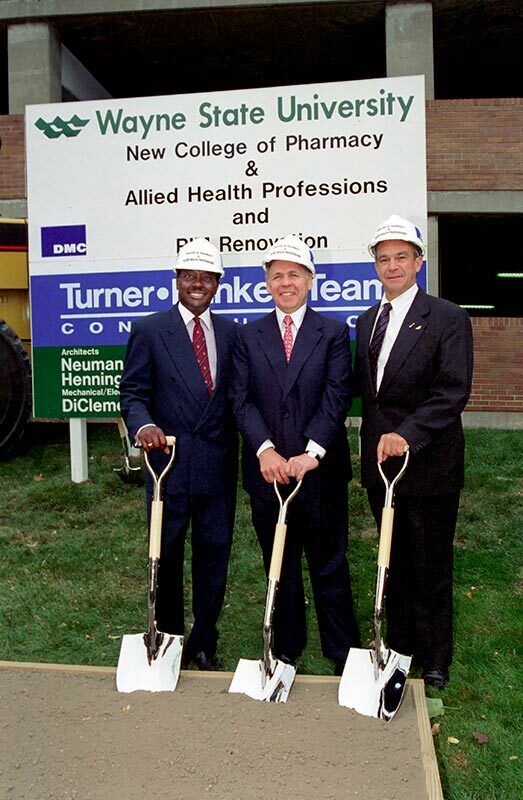 Today, this is where the Mort Harris Recreation and Fitness Center stands. 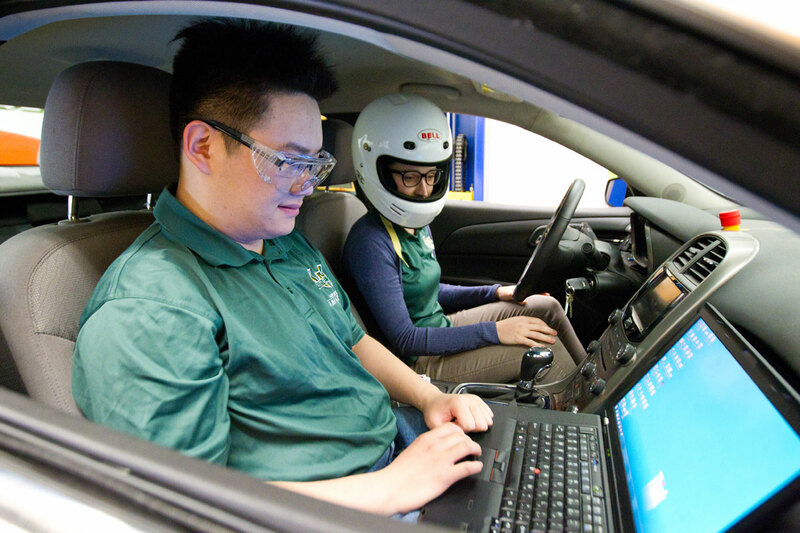 Wayne State is the first university in the nation to offer an electric-drive vehicle engineering program. 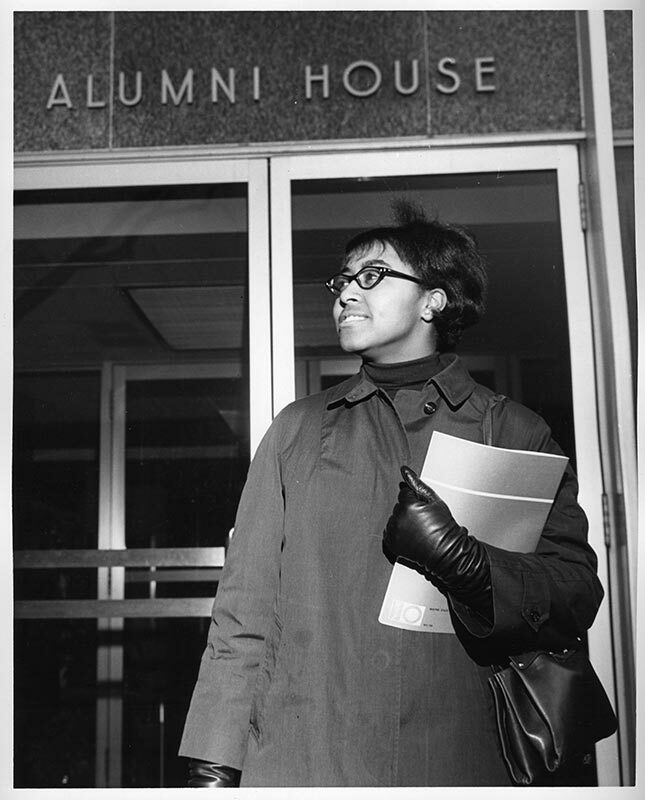 Elinore Batie earns a degree in chemical engineering, making her the first female graduate in the College of Engineering. 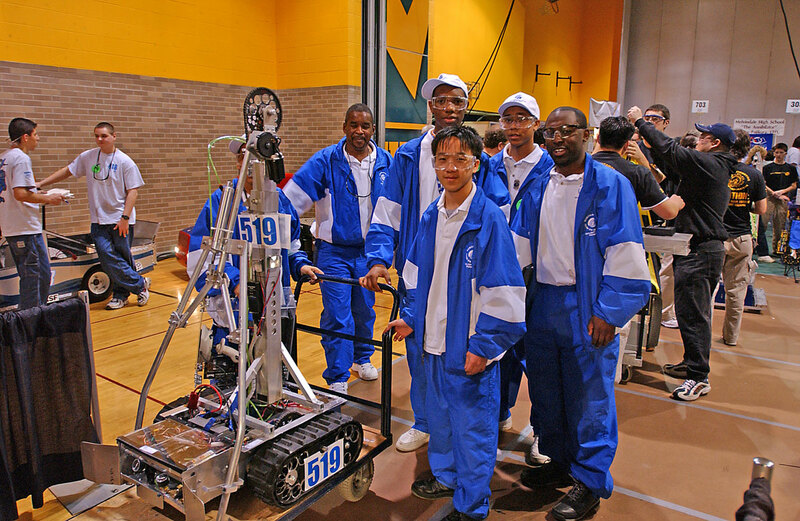 Wayne State hosts a FIRST Robotics Competition on campus for local high school teams. 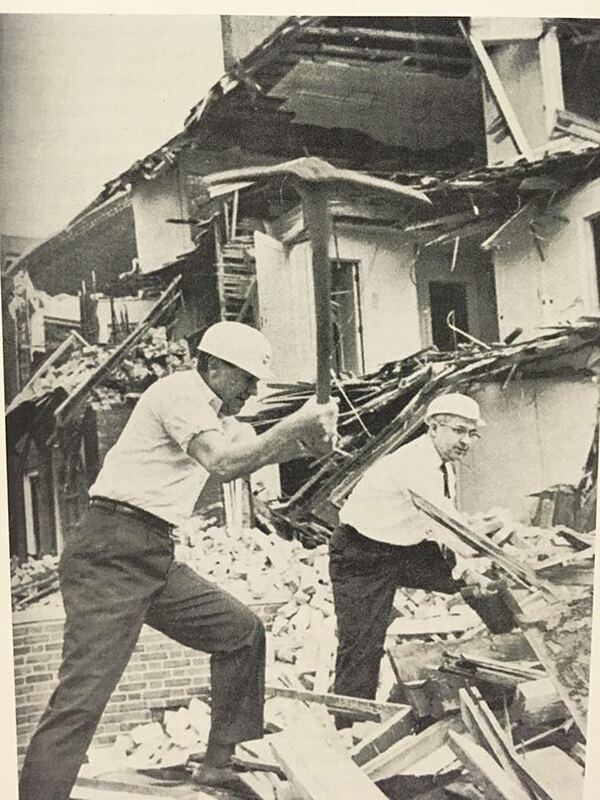 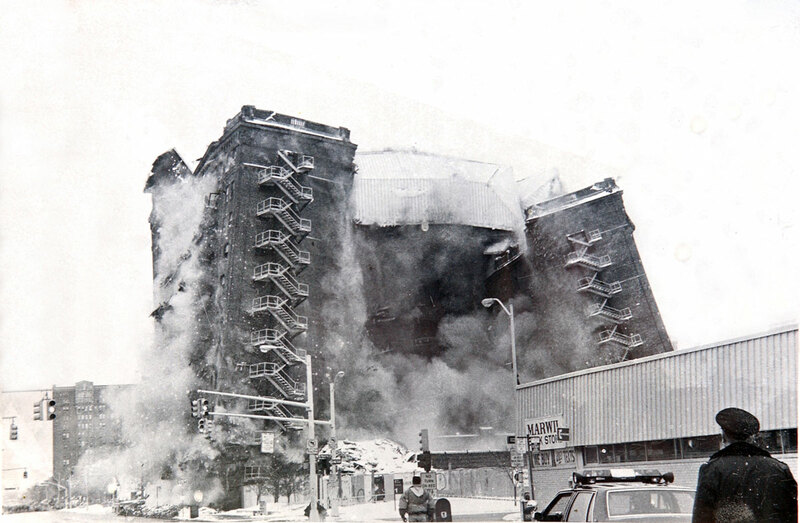 The former student center, David Mackenzie Hall, is demolished by implosion. 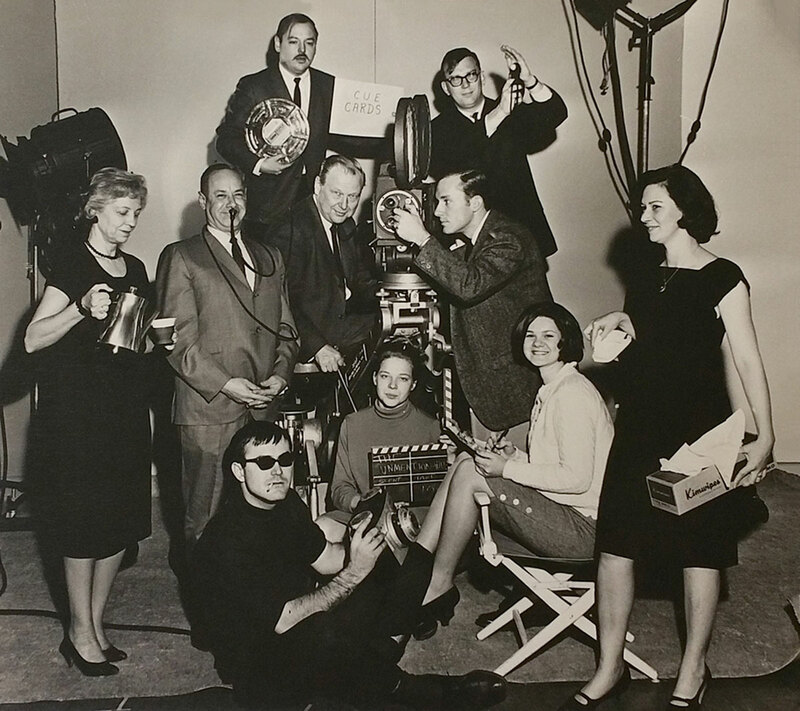 Wayne State’s photography motion picture department shows off its skills. 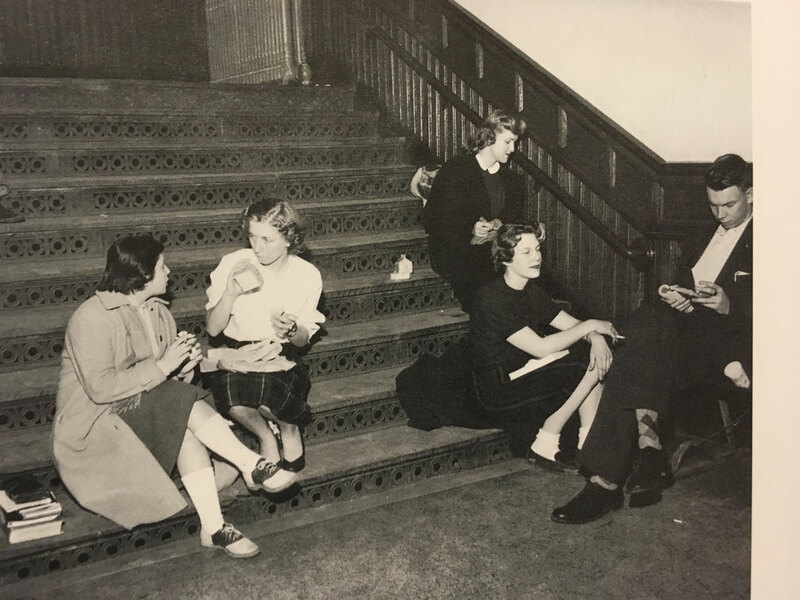 Students enjoy a quick lunch on the stairs of Old Main. 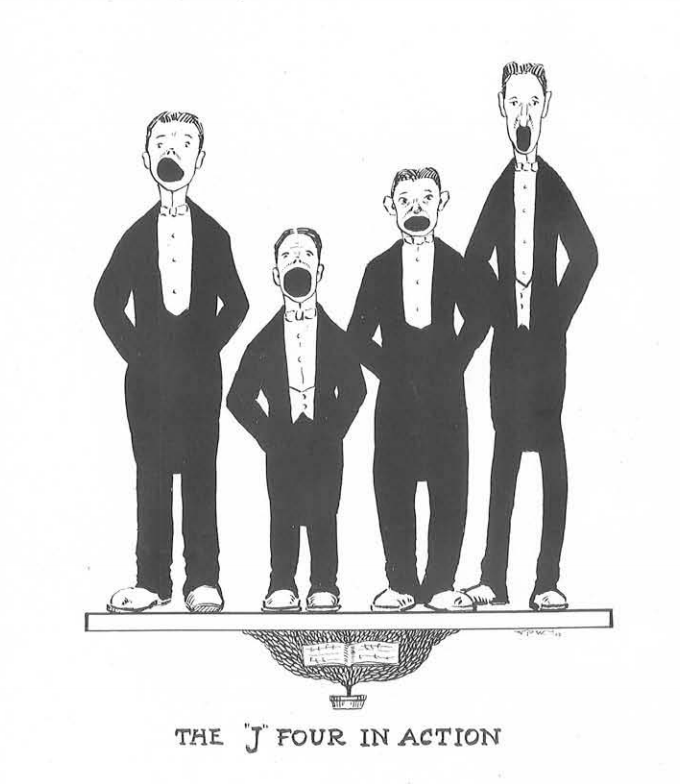 Choir students practice Handel’s Messiah. 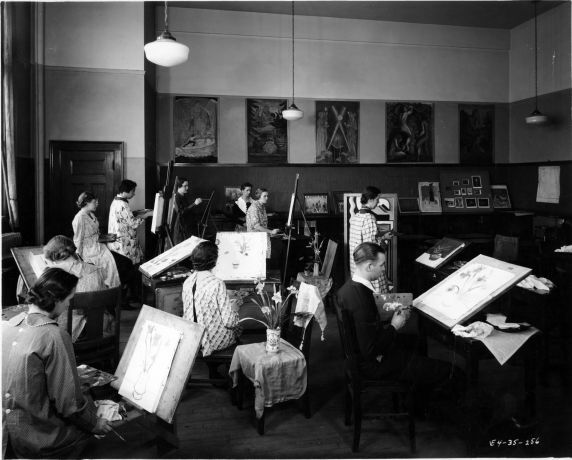 Students attend art class in Old Main. 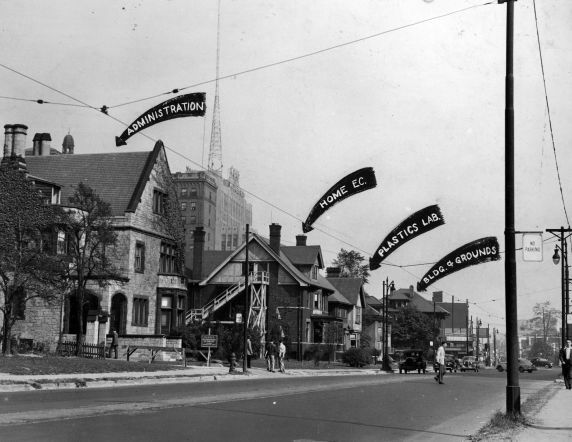 A row of residential buildings on Warren Avenue serves as a hub for Wayne University laboratories and classrooms. 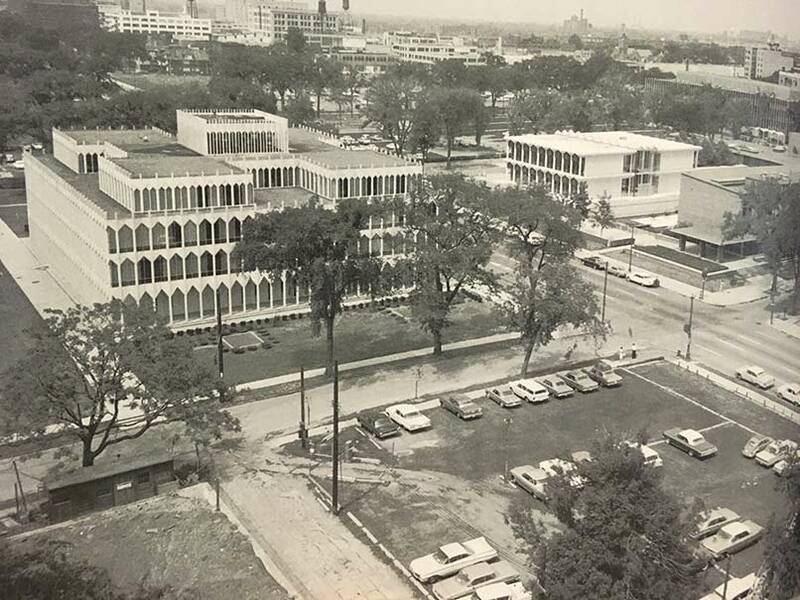 The arrows show the Administration Building, Home Economics Building, Plastics Laboratory and the Building and Grounds Department. 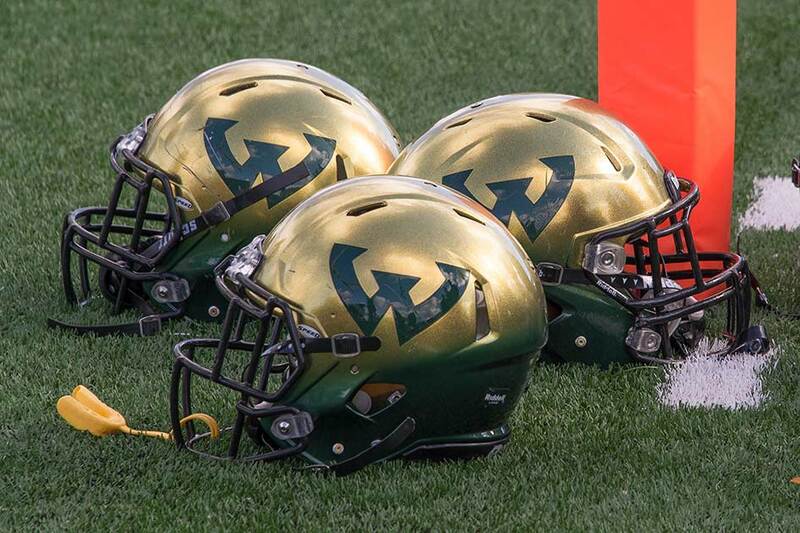 Following a three-year, $41.8 million renovation, Wayne State debuts the new-and-improved Old Main. 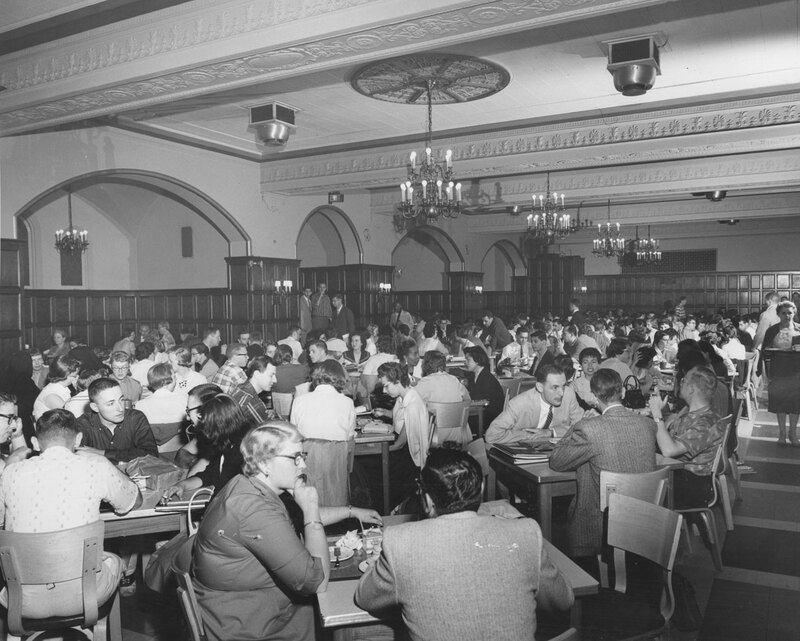 The cafeteria in Wayne University’s student center, Webster Hall, opens. 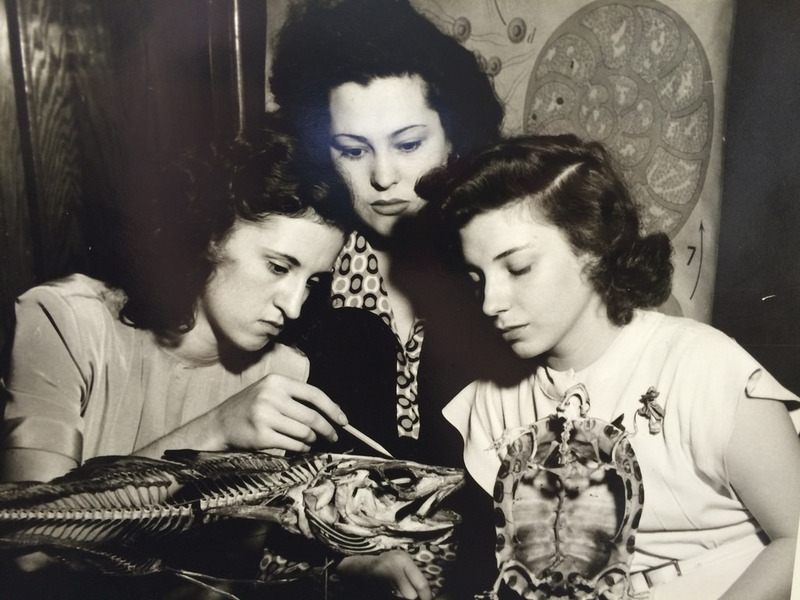 Biology students get a closer look as they inspect skeletons. 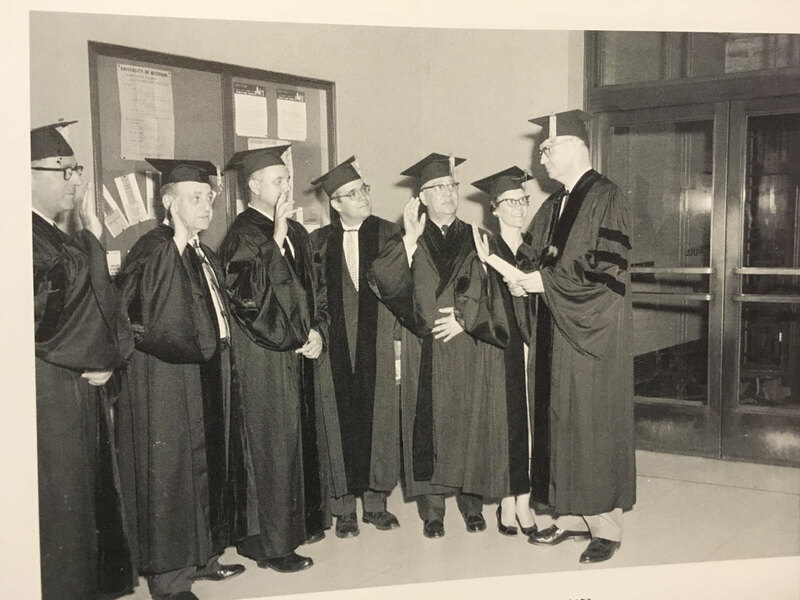 Following a statewide election, the first Board of Governors is sworn in at Wayne State University. 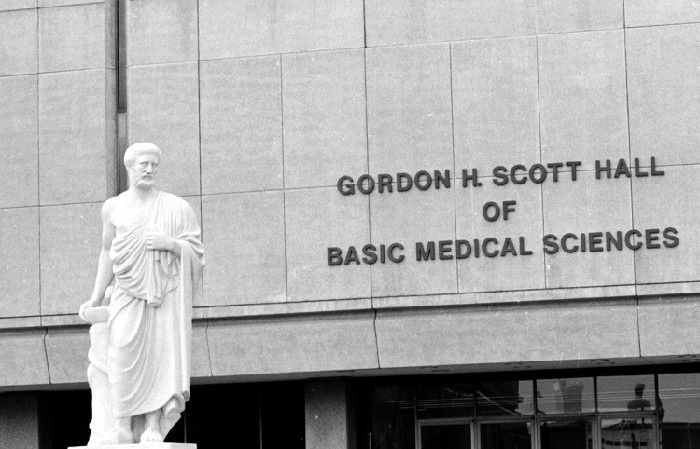 Angus McLean graduates from the Detroit College of Medicine. 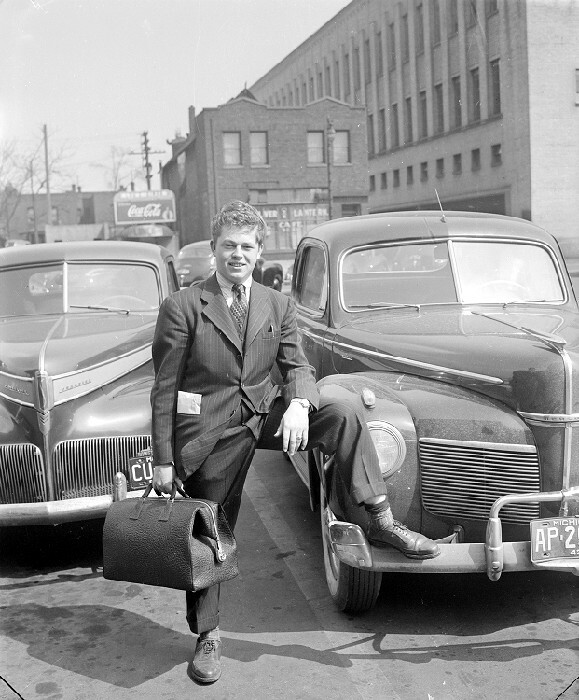 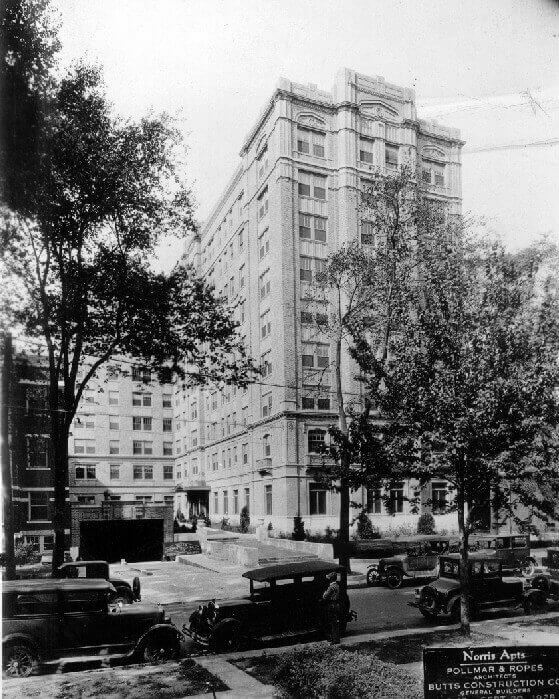 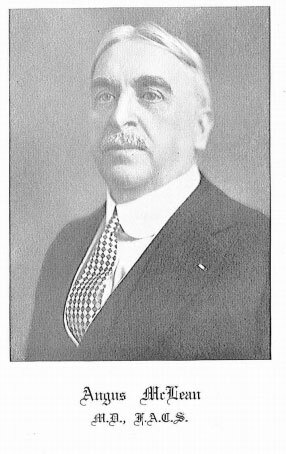 During World War I, he organized Base Hospital 17 with staff from Harper Hospital. 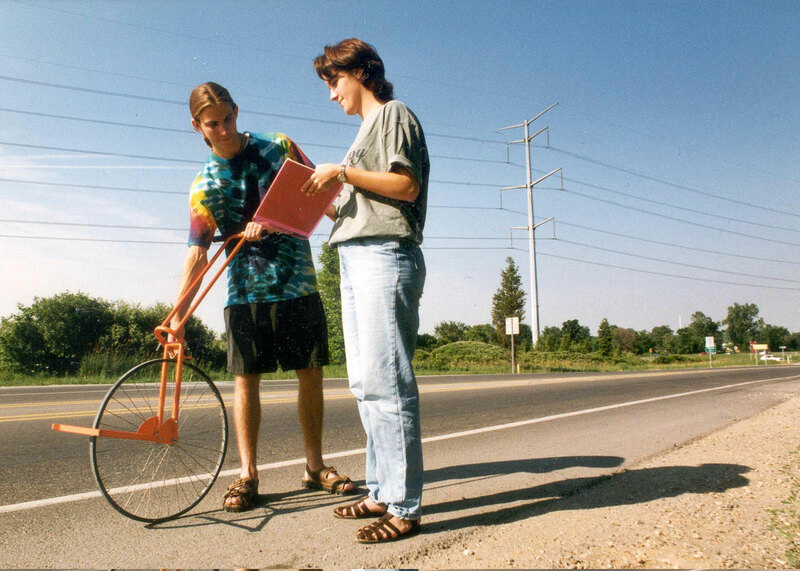 Civil engineering students survey metro Detroit roads for infrastructure research. 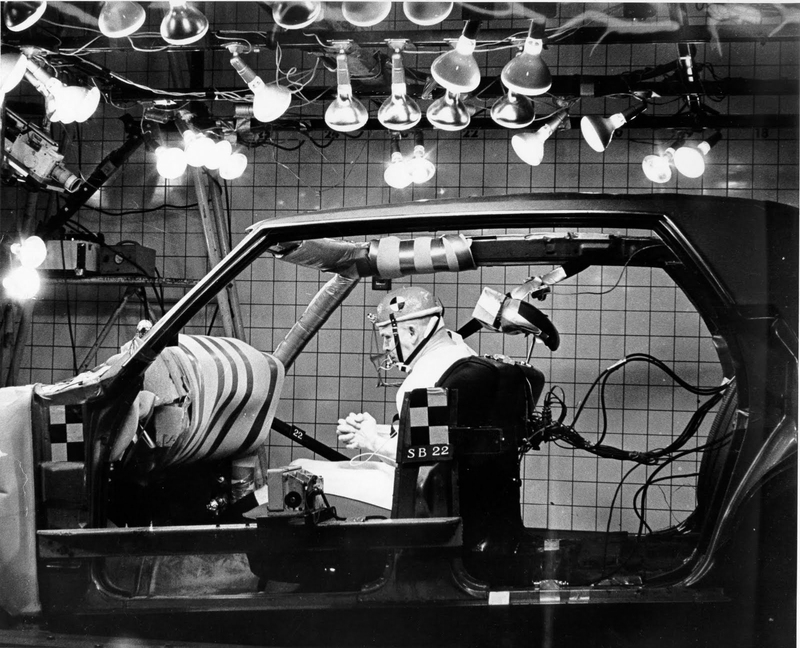 The Wayne State Tolerance Curve is used to establish the head injury criterion for Federal Motor Vehicle Safety Standards. 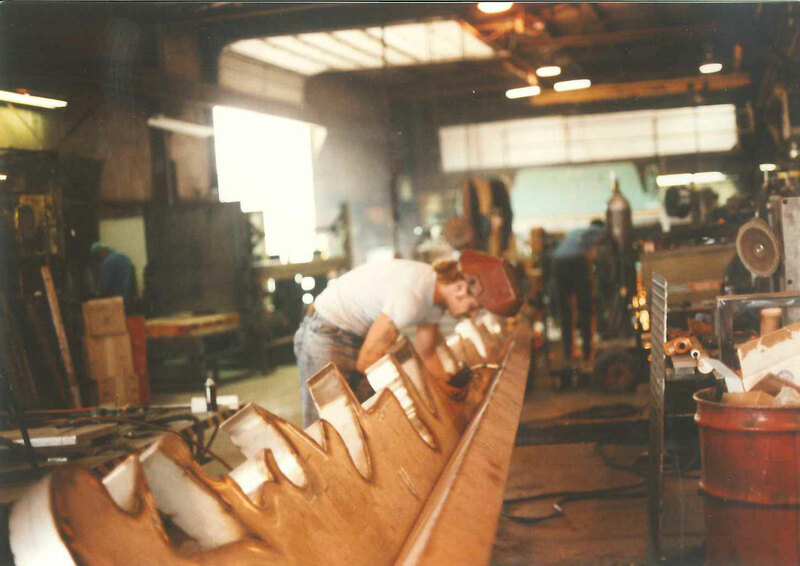 Bruce White constructs the Helios Trail, a sculpture that stands outside Wayne State’s College of Engineering. 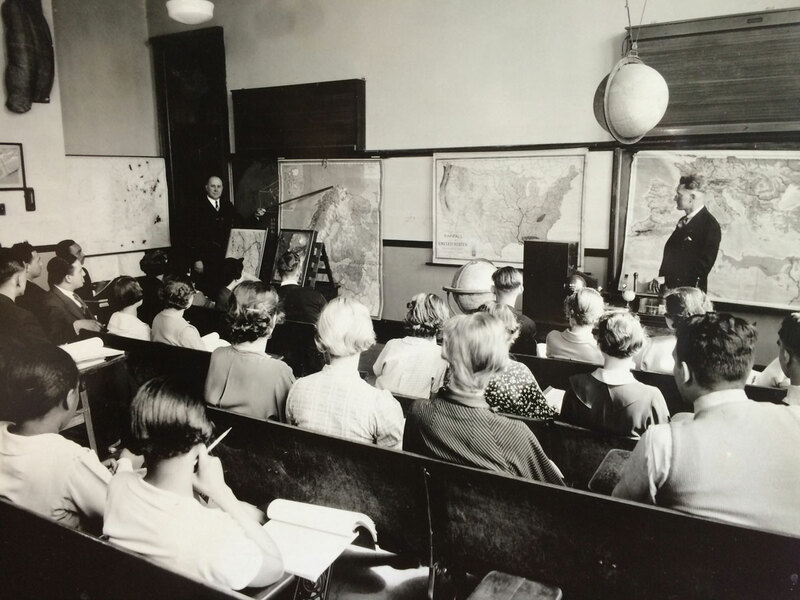 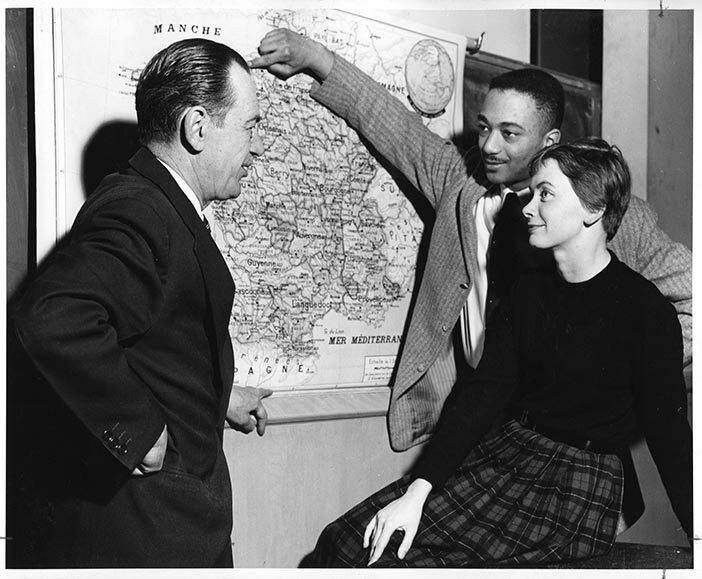 Students attend a geology lecture. 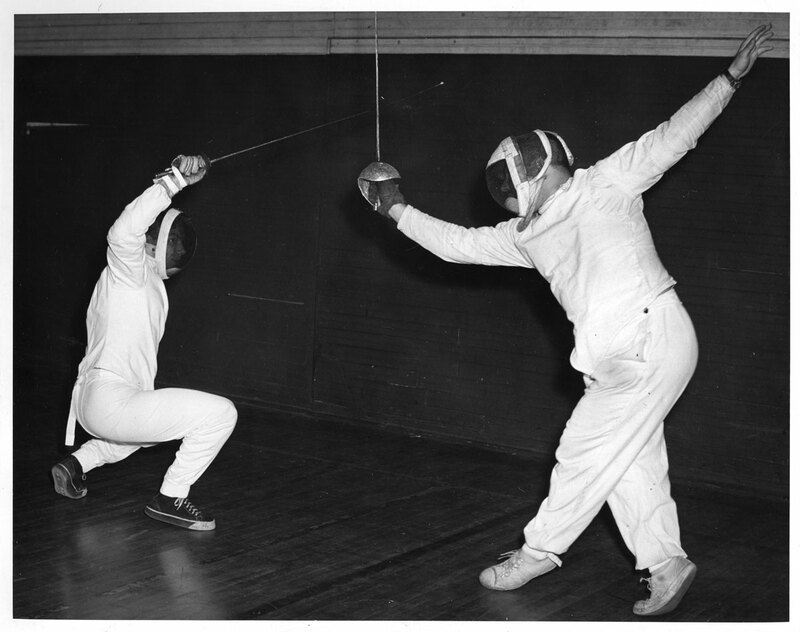 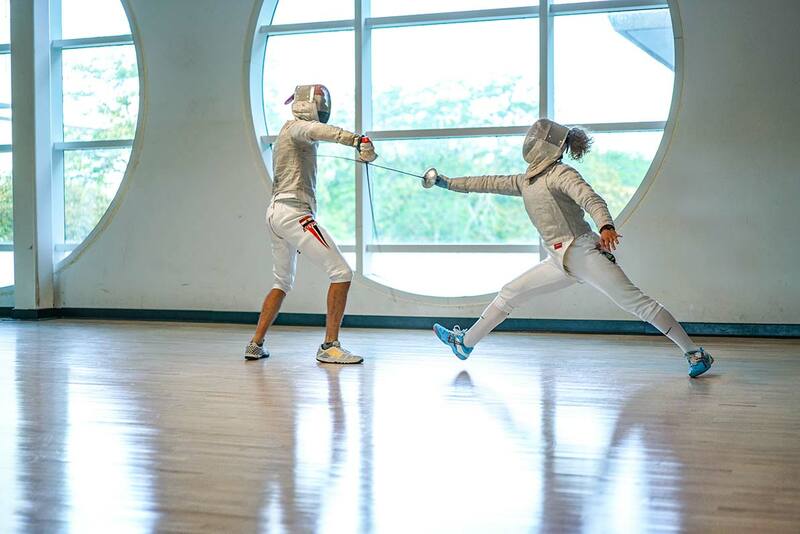 The men’s fencing team is established. 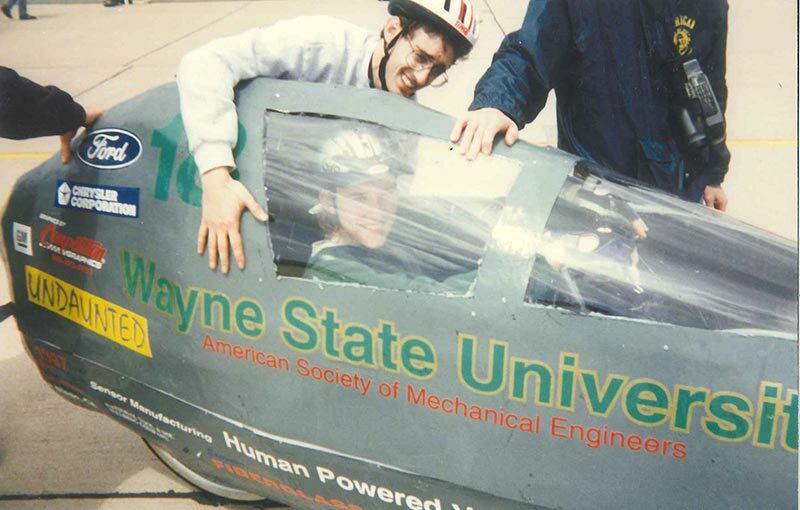 College of Engineering students show off their vehicle for the Clean Air Car Race. 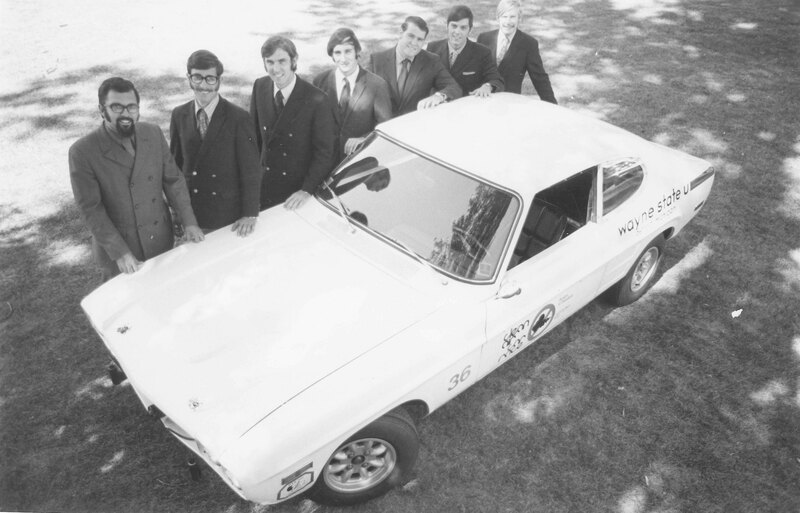 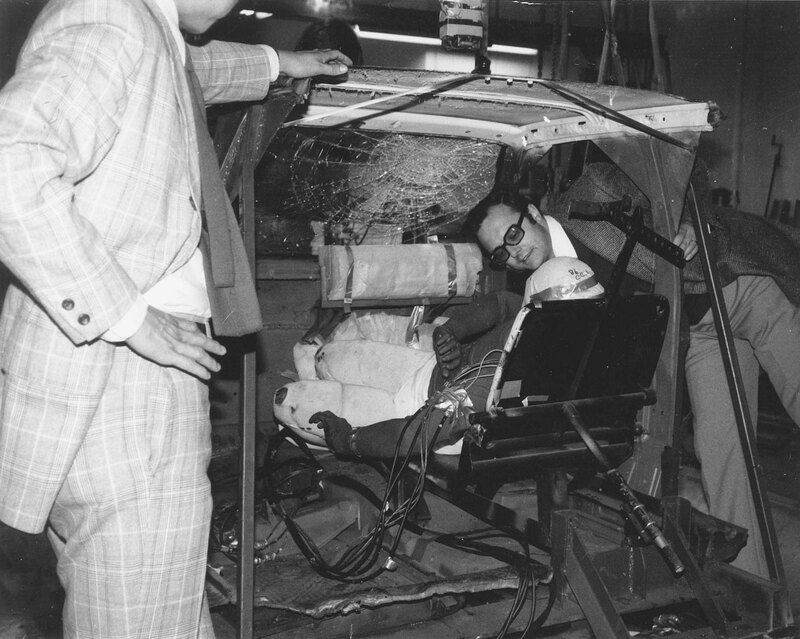 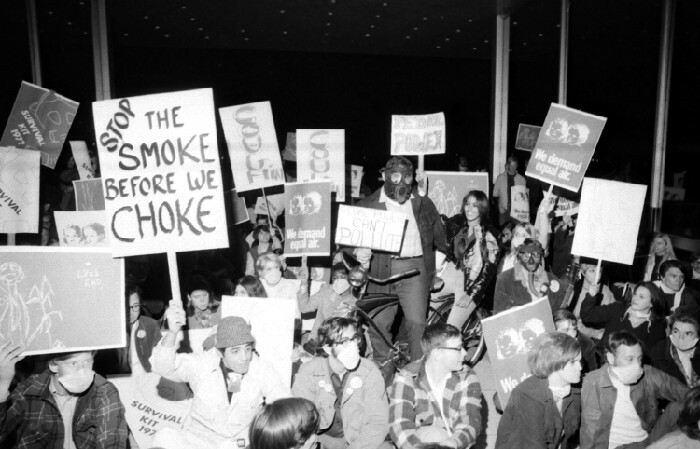 The 1970 team — the first to win a national competition for Wayne State — introduced an emission control system design that’s now produced in virtually every car sold in the United States. 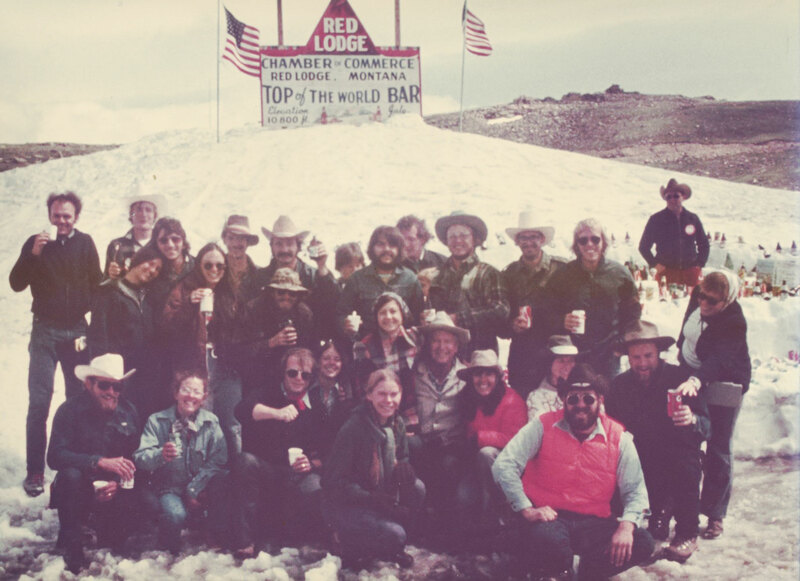 The Wayne State Geology Field Camp visits the Top of the World Bar in Montana’s Beartooth Mountains. 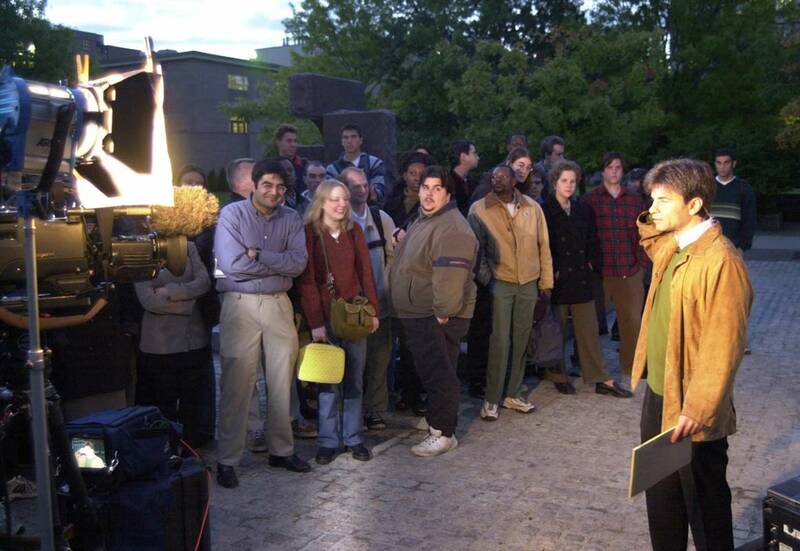 Students at the Merrill Palmer Skillman Institute speak with honorary trustee and world-renowned cultural anthropologist Margaret Mead. 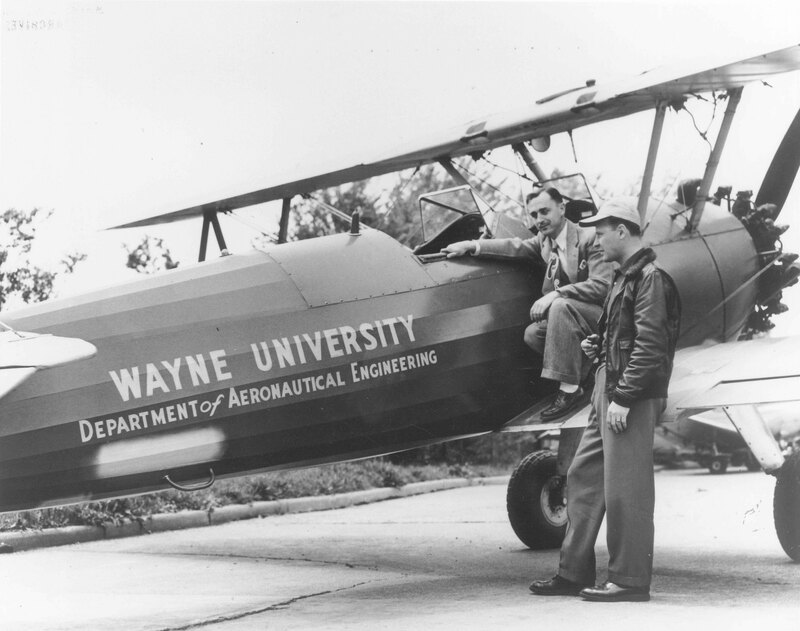 Wayne University receives World War II surplus machinery — including a Boeing airplane — from the Engineering, Science and Management War Training program. 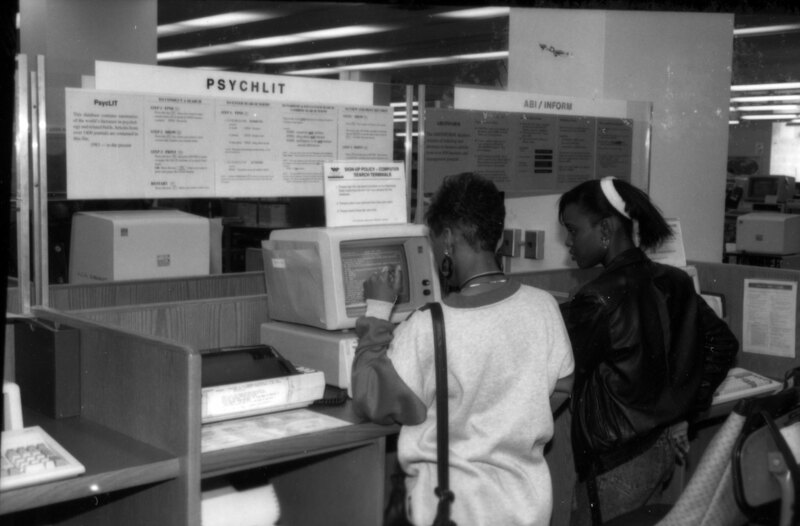 A student reviews the “simplified appointment system” for class registration. 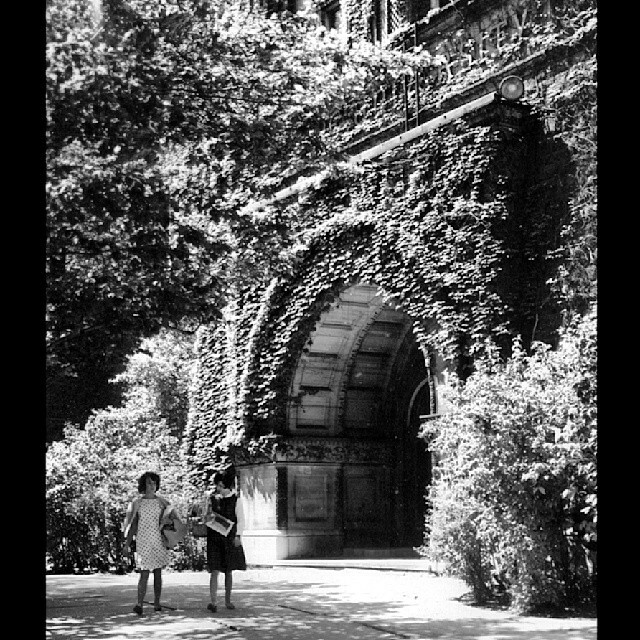 Old Main is in full bloom during the spring. 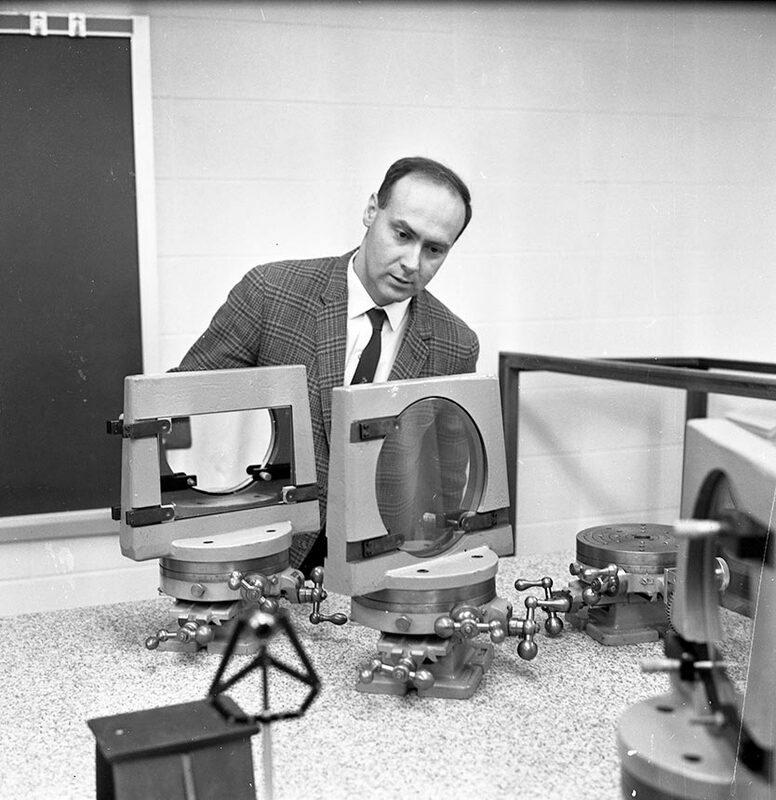 A researcher stands in the Mechanical Engineering Constant Temperature Room. 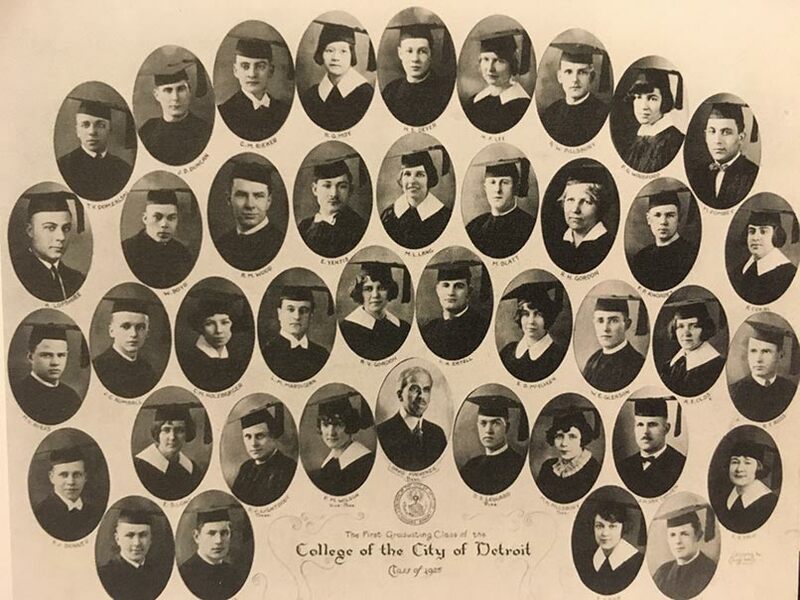 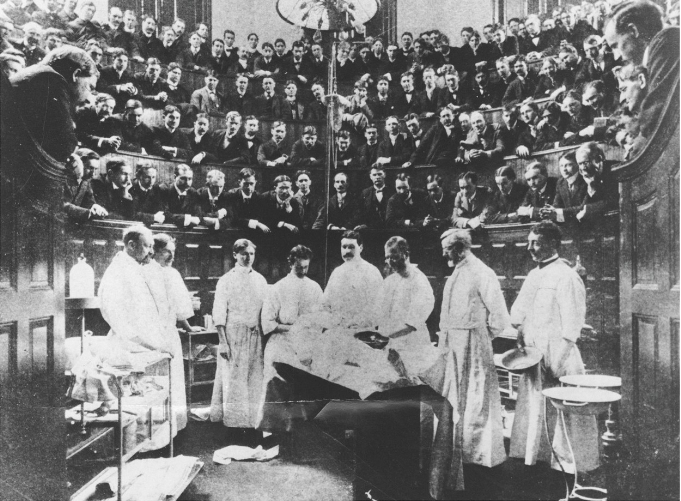 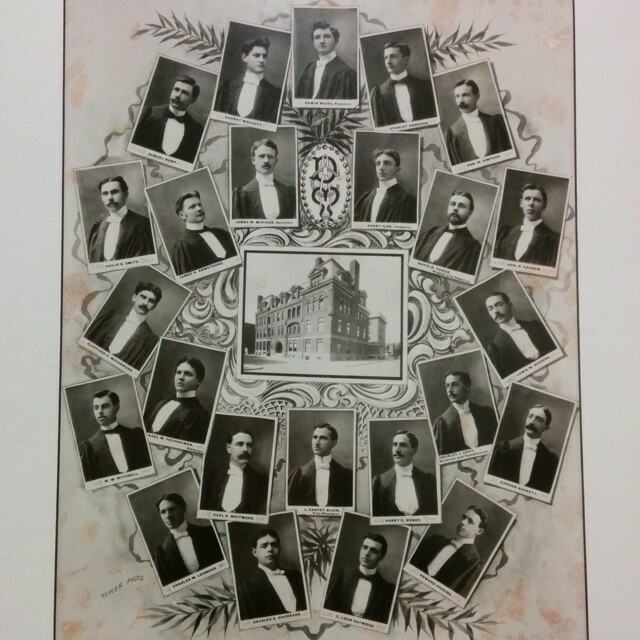 This picture shows the 1900 class of the Detroit College of Medicine, a predecessor of the Wayne State School of Medicine. 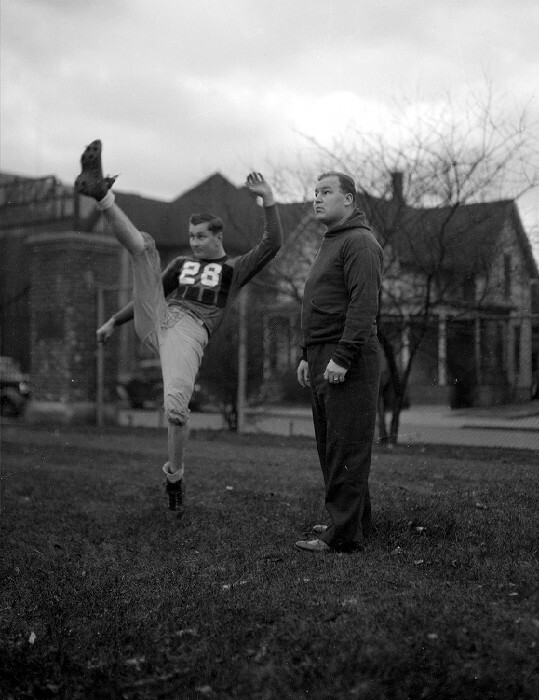 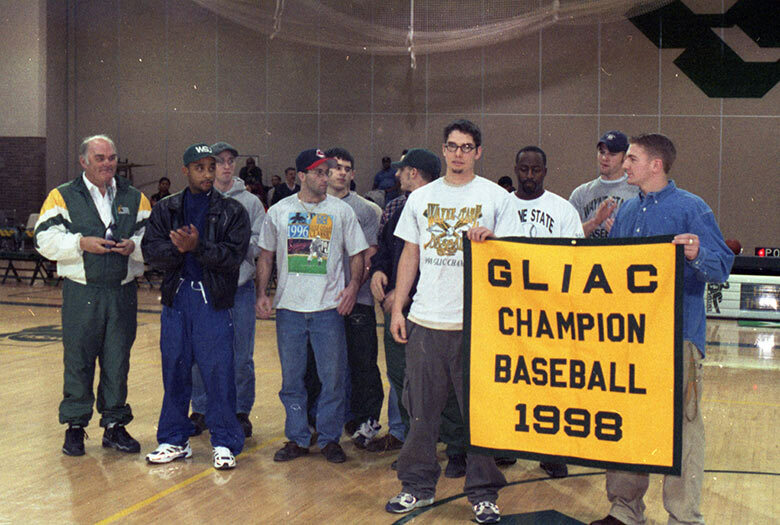 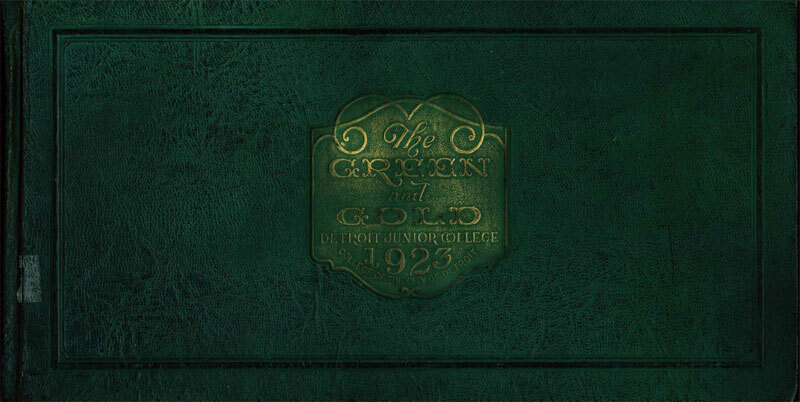 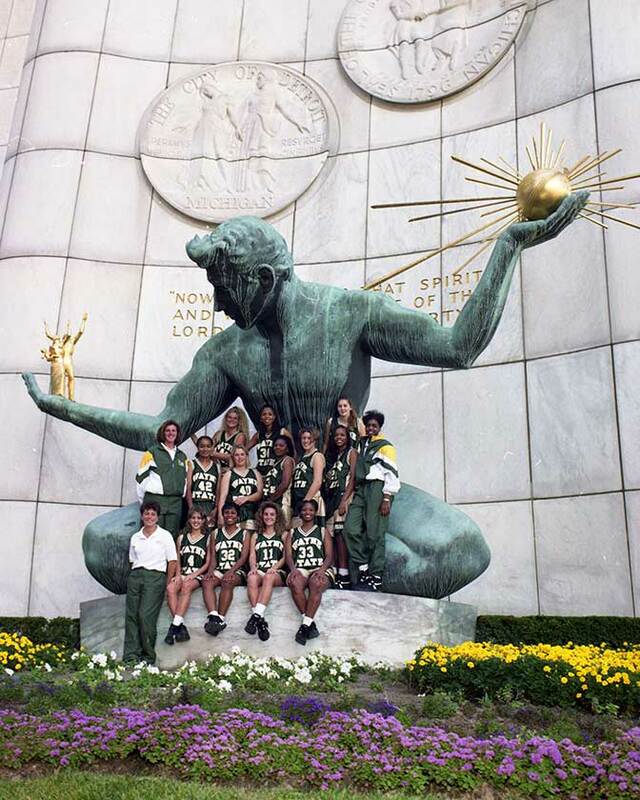 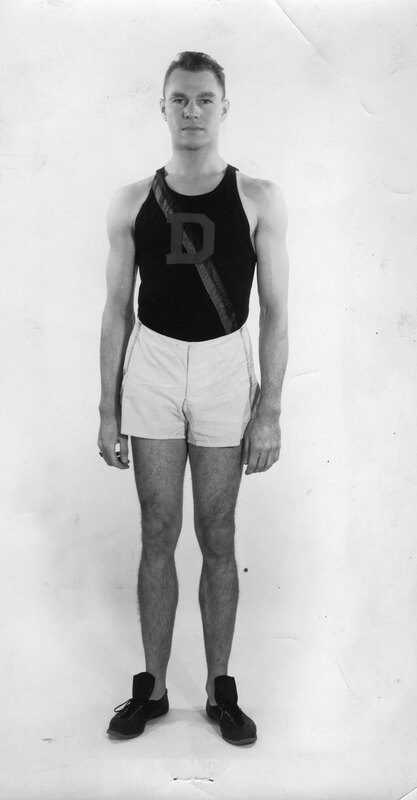 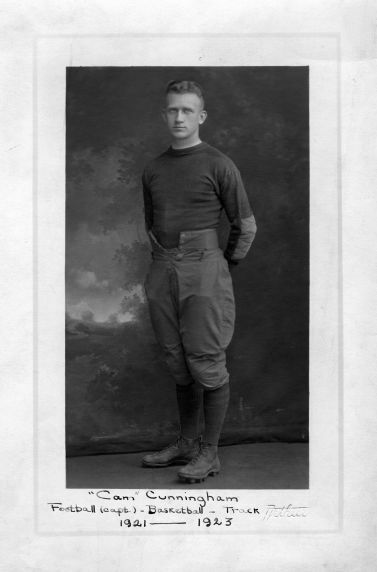 Kelly green and “old gold” are adopted as the school colors of Detroit Junior College, a predecessor of Wayne State. 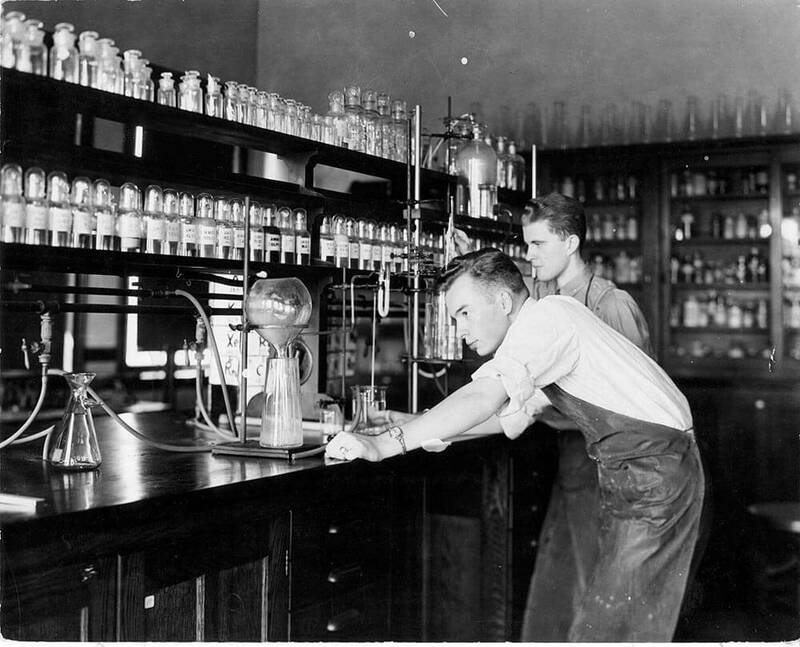 A general chemistry class meets in Old Main. 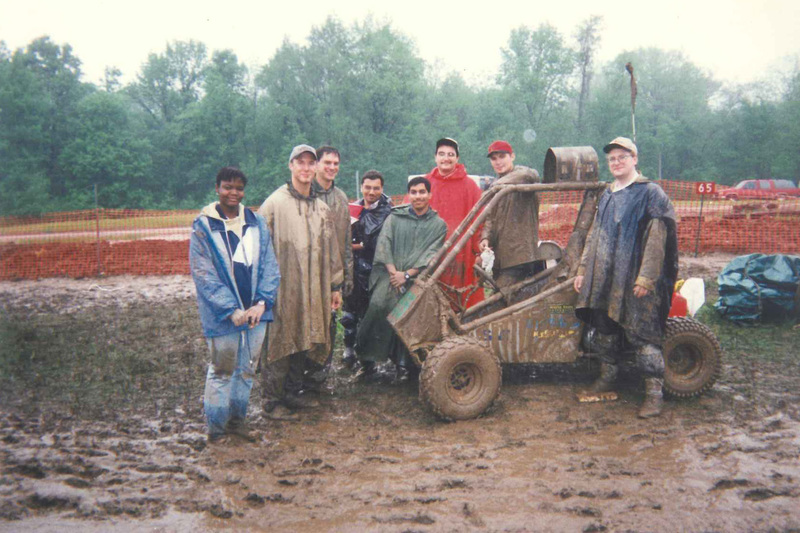 The Formula SAE Warrior Racing team goes to great lengths to test its machinery. 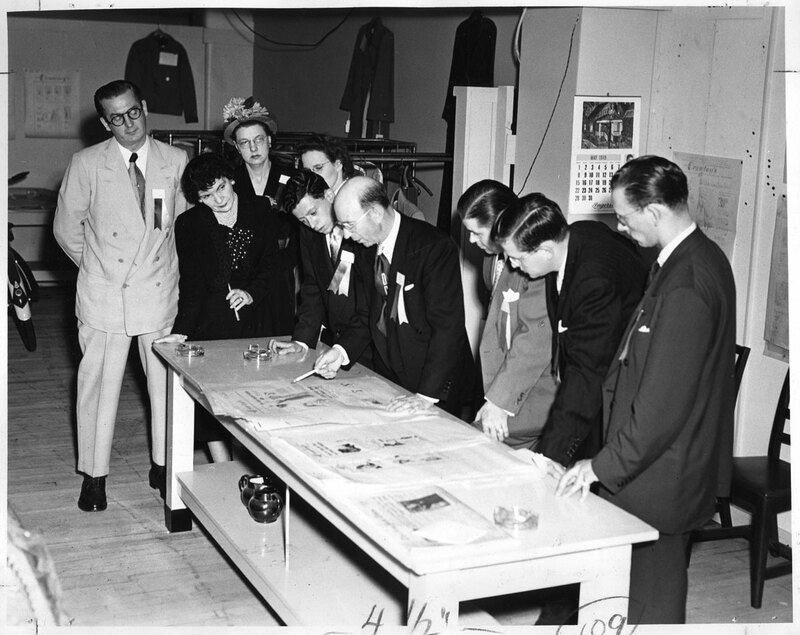 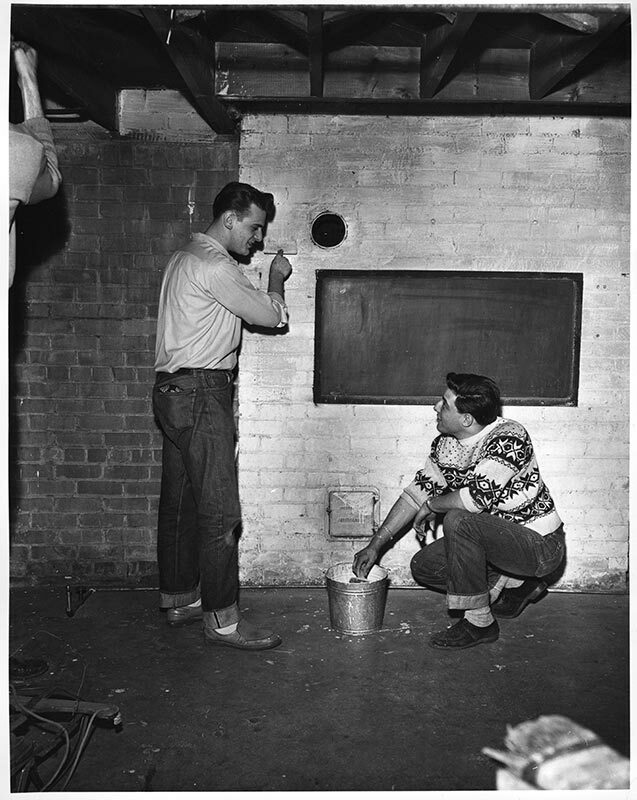 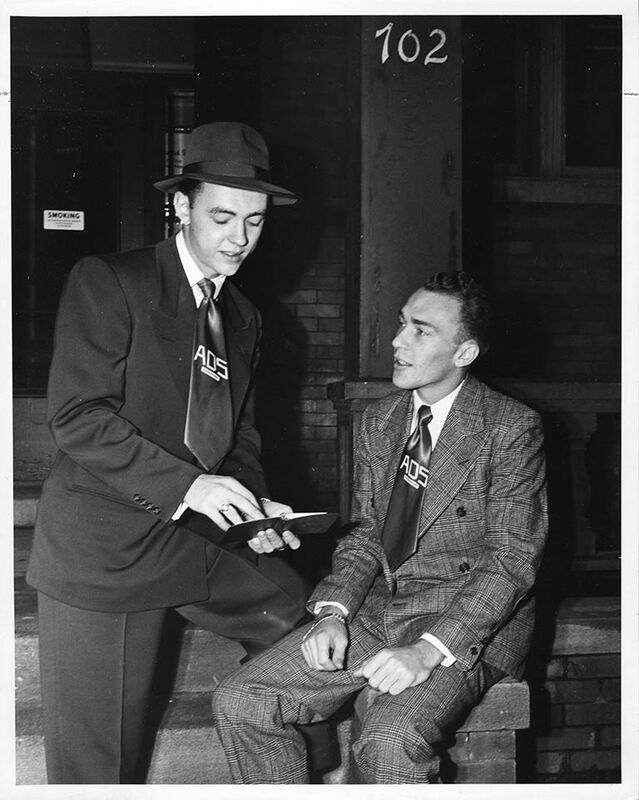 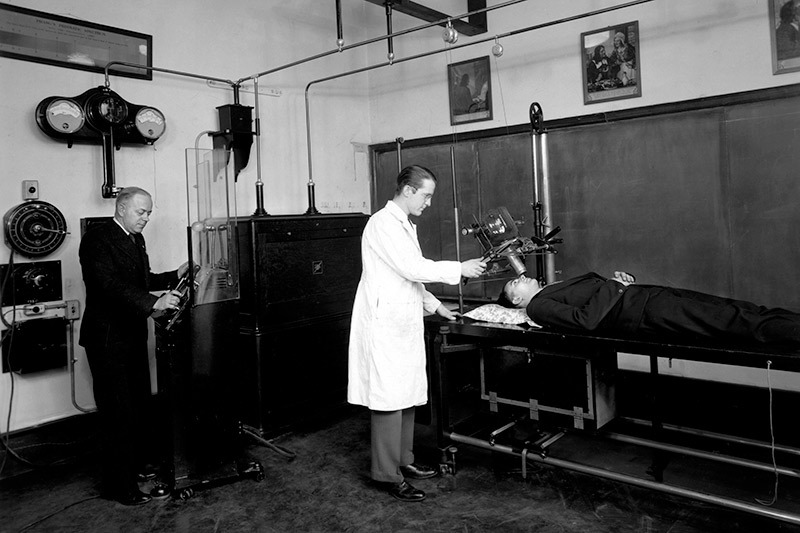 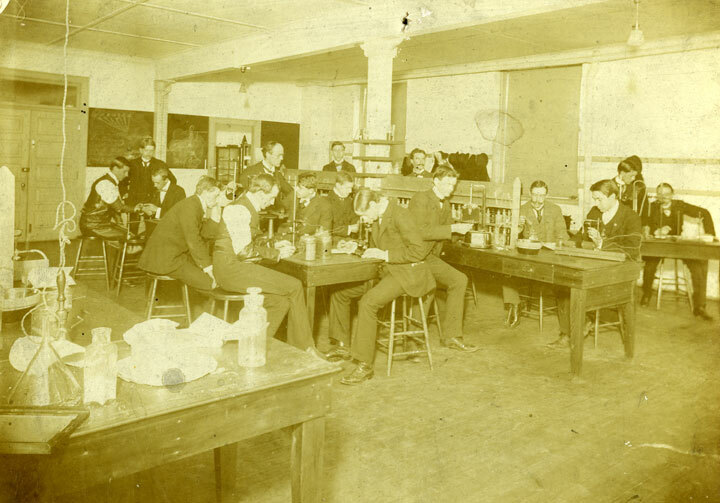 Dr. Burt Shurly and Dr. Augustus Ives teach a physiology class. 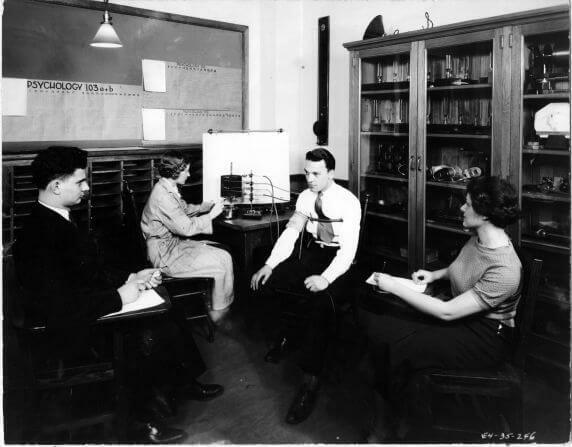 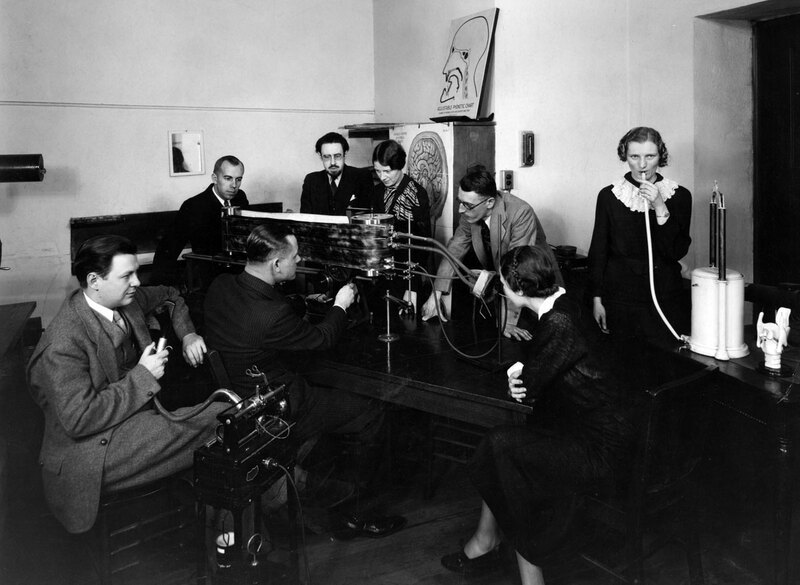 Students run a test (possibly on a kymograph or polygraph) in psychology class. 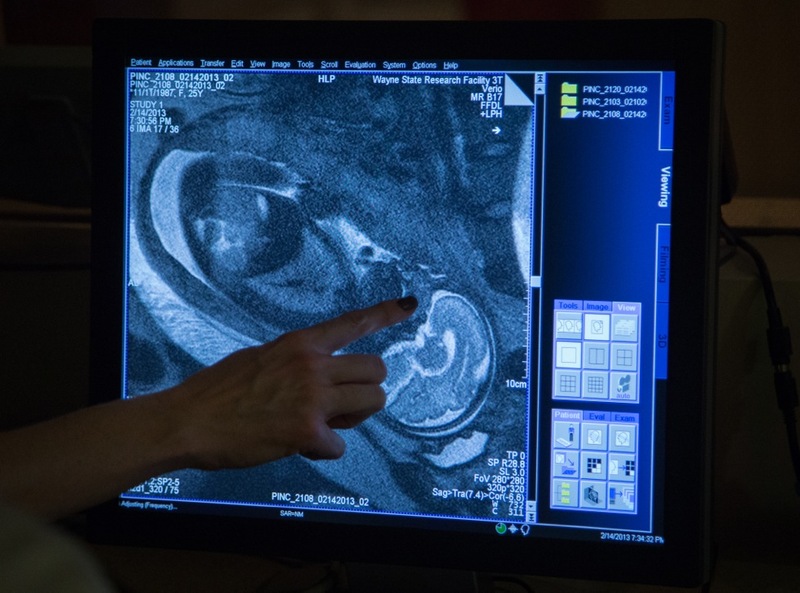 Today, our psychology department is ranked among the top 100 in the nation by U.S. News and World Report. 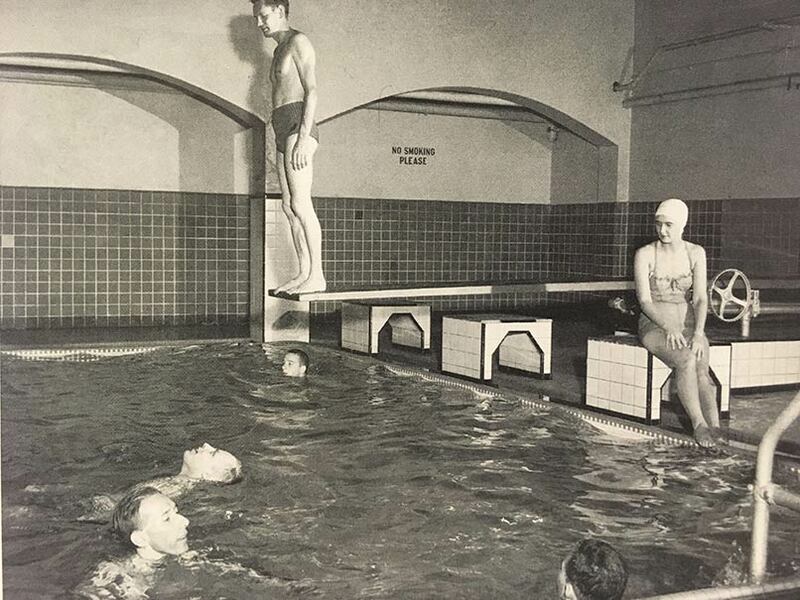 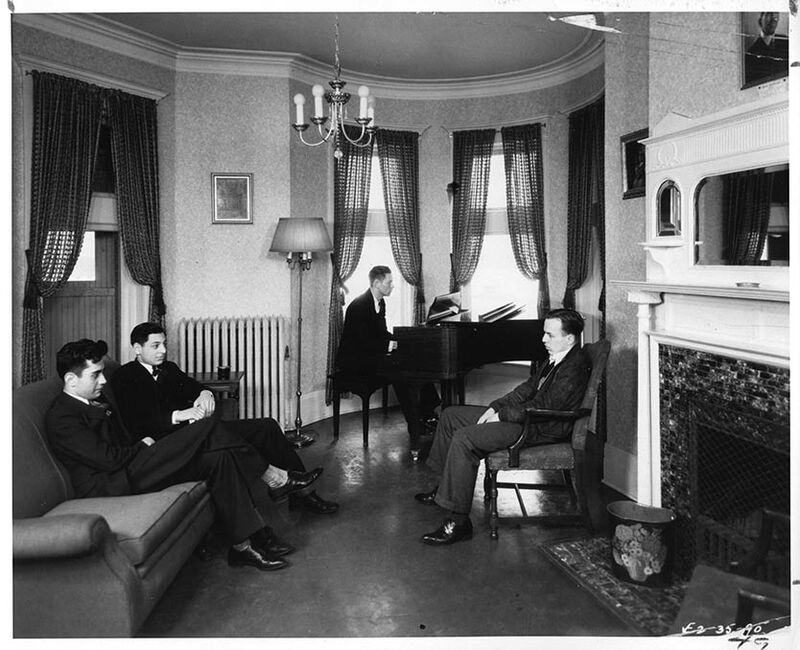 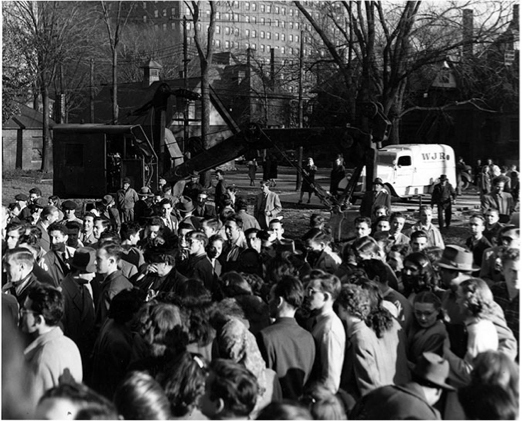 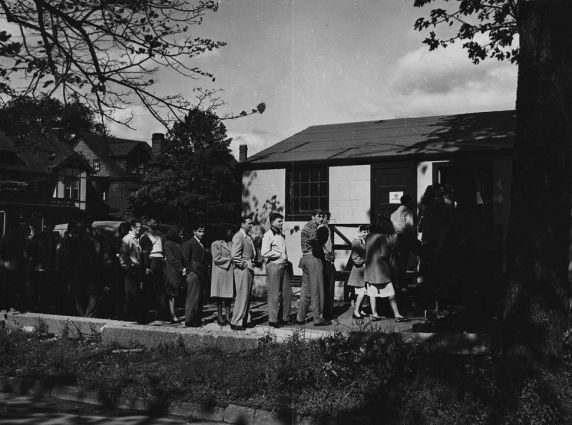 During the 1940s, a growing student body led to crowded conditions in buildings such as Mackenzie Hall (pictured). 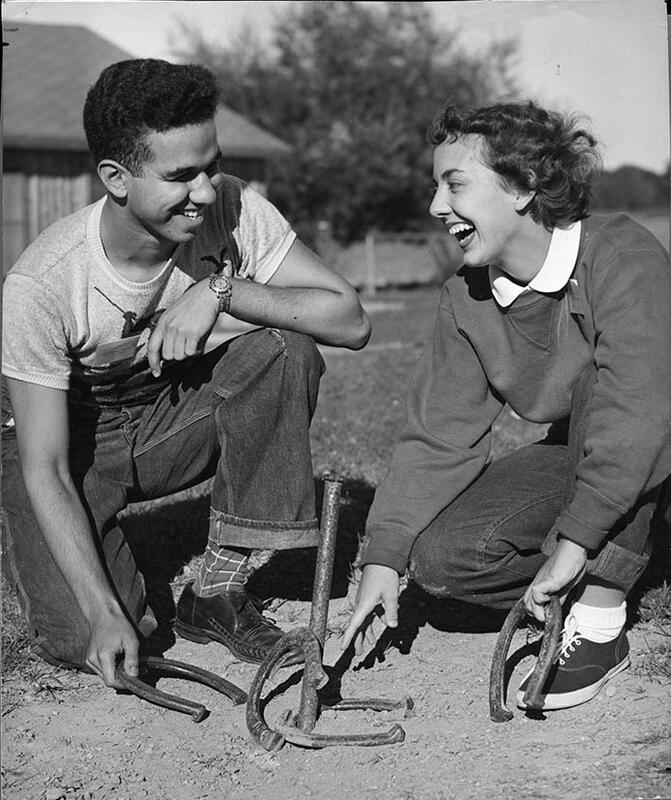 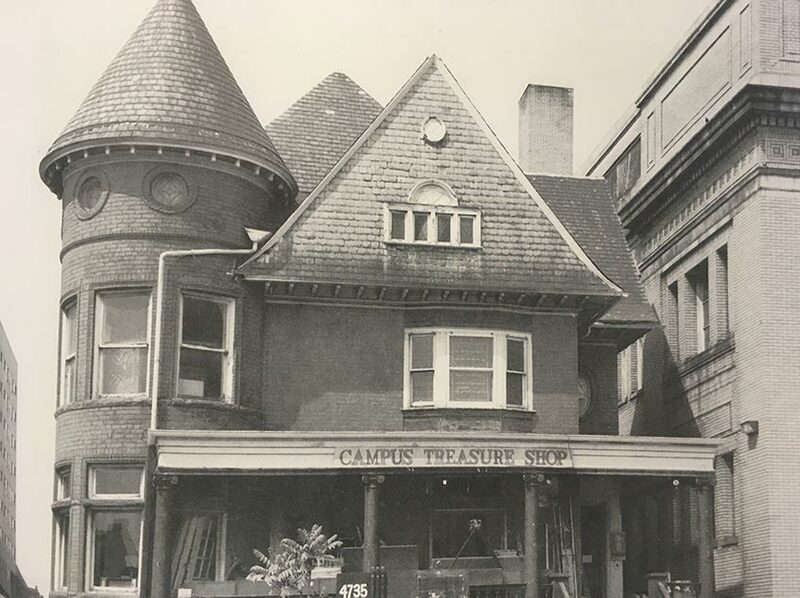 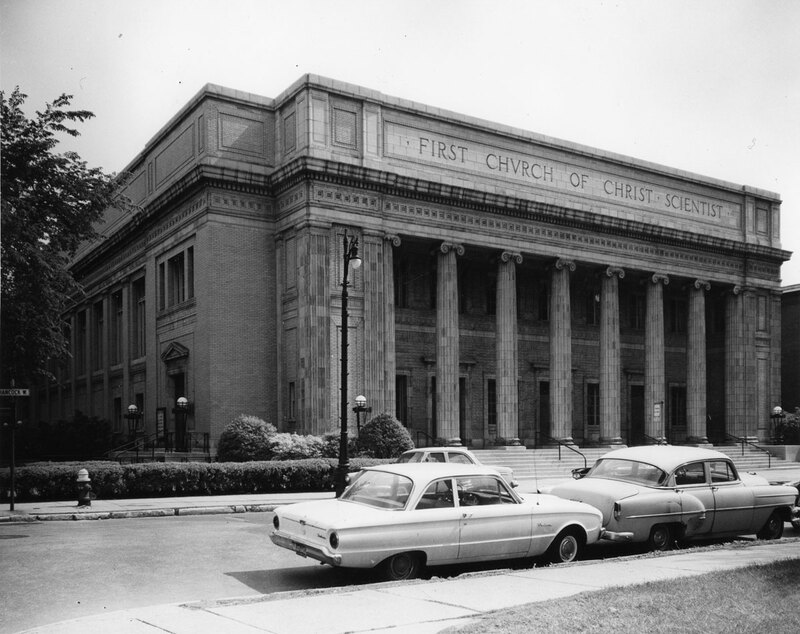 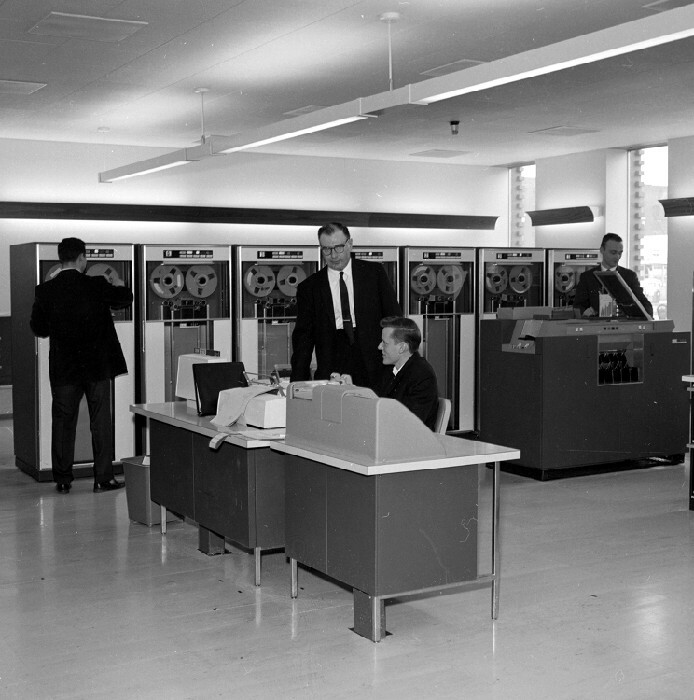 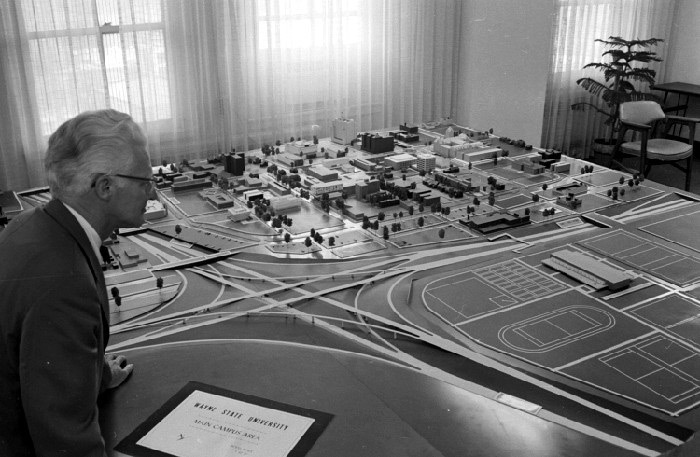 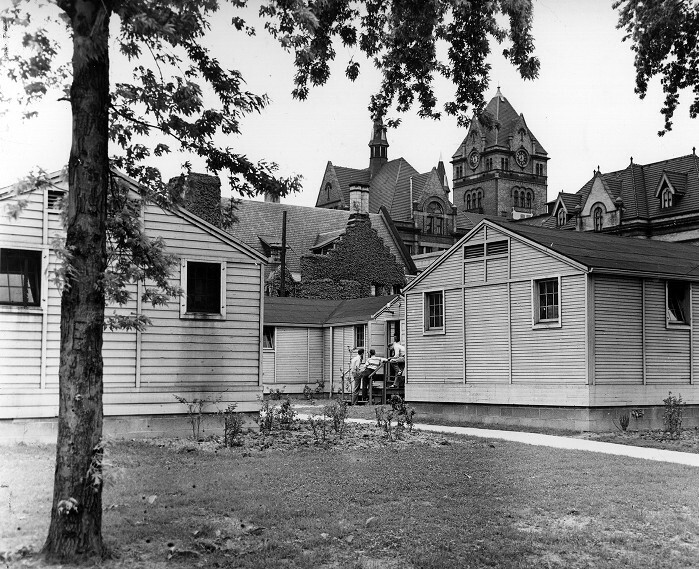 This resulted in campus expansion in the early 1950s. Veteran enrollment peaks at 7,685 students — roughly 40 percent of the student population. 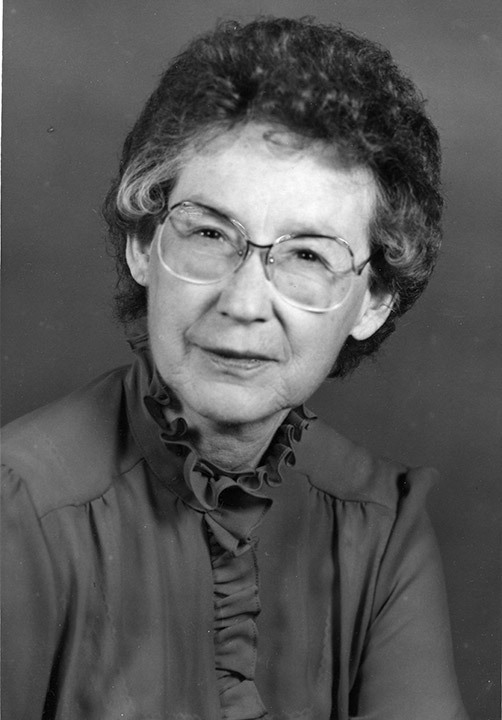 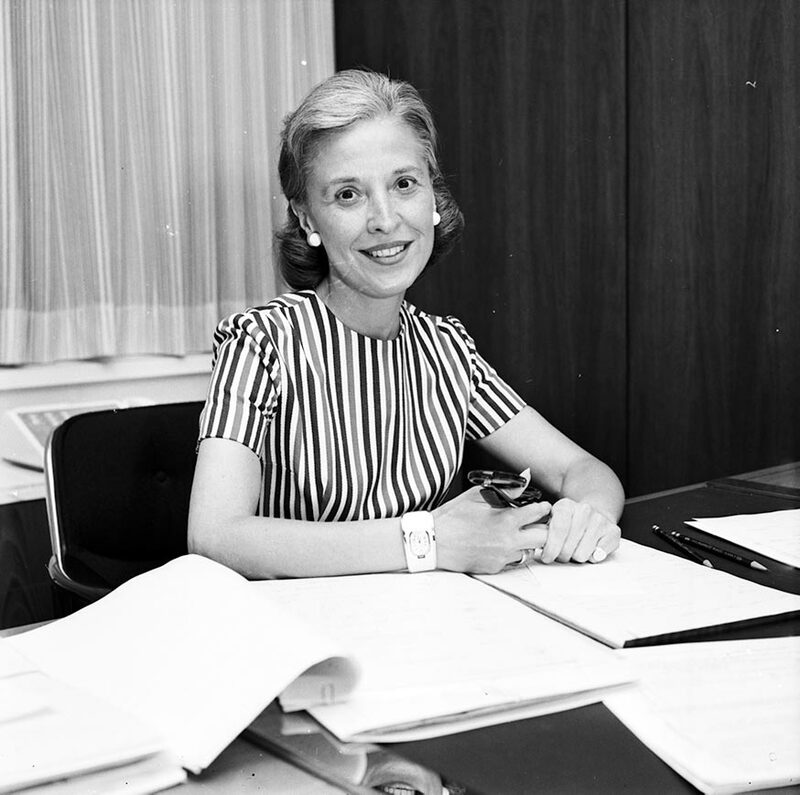 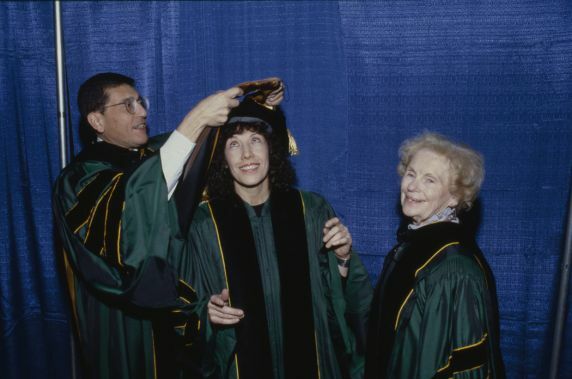 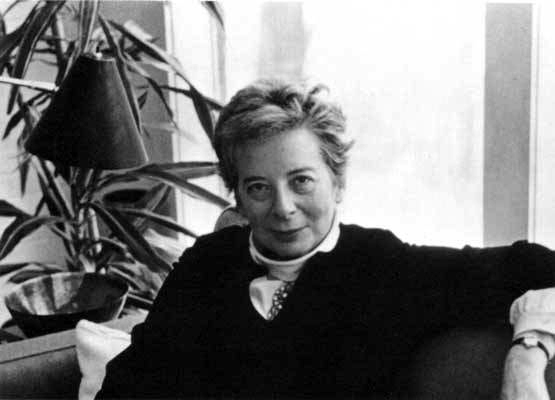 Marion Barnhart, Ph.D., is the first woman to become a professor at the Wayne State University School of Medicine. 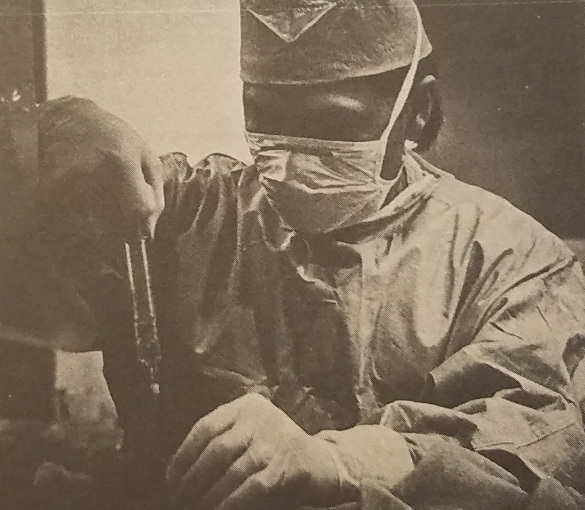 During the 1970s, Wayne State faculty member Manuel Madayag pioneers a thinner, less invasive biopsy needle that becomes known as the Madayag needle. 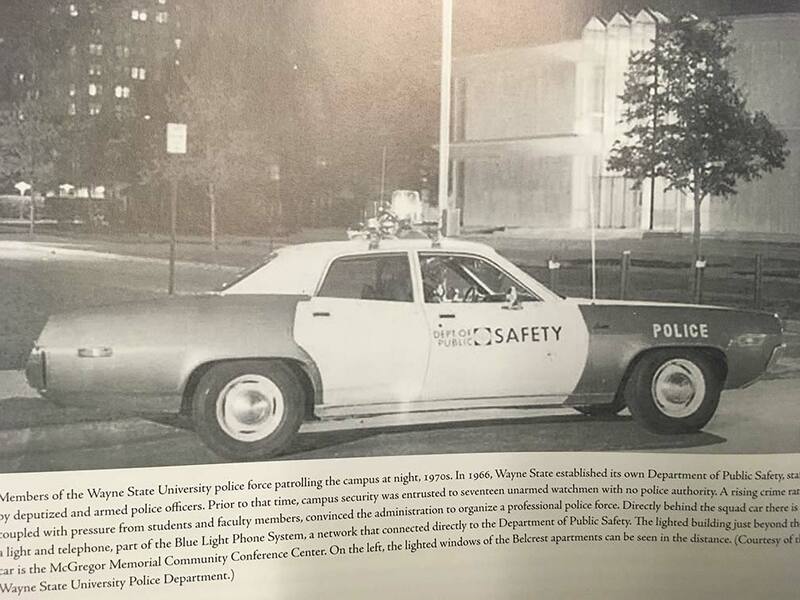 Wayne State establishes its Department of Public Safety, which is staffed by deputized and armed police officers. 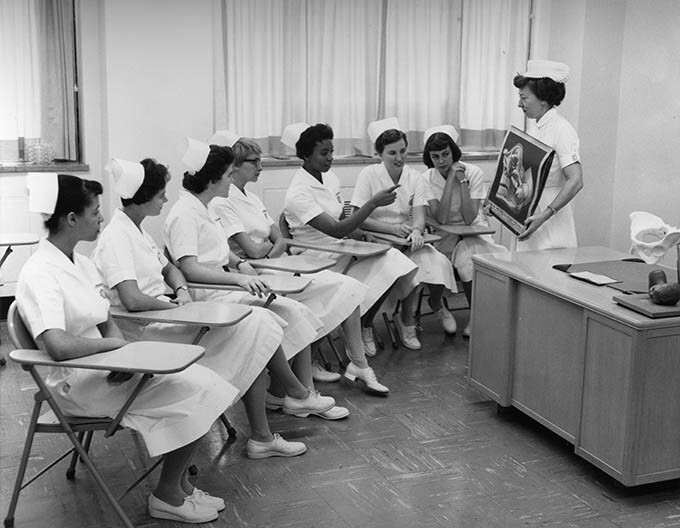 The Richard Cohn Building is completed to serve as the home of the College of Nursing. 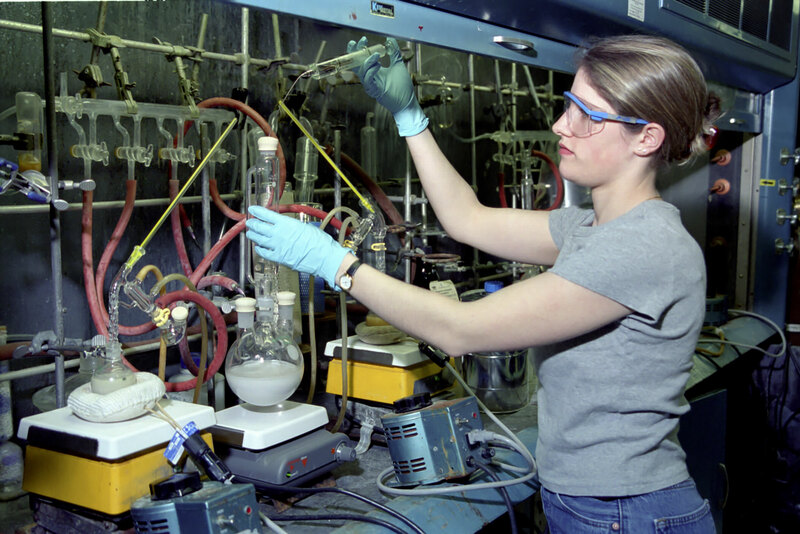 The university awards the first doctoral degree in biochemistry. 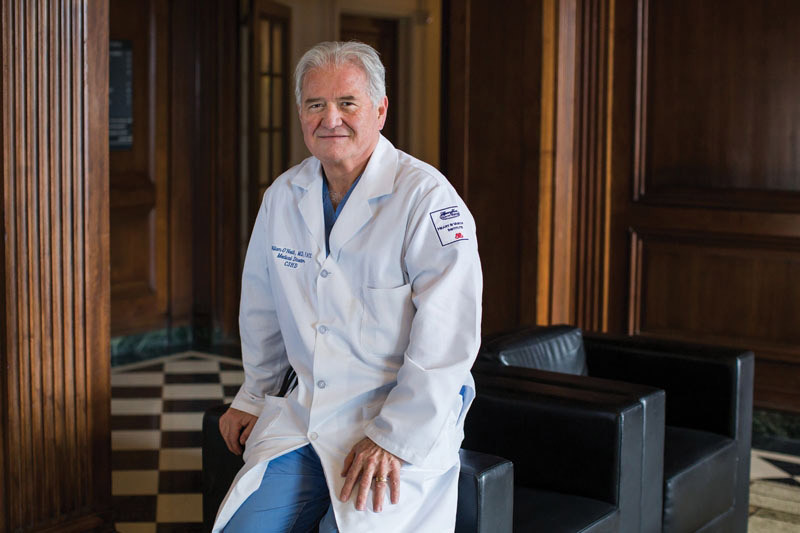 Alumnus William O’Neill, M.D., is the first in the country to perform an aortic valve replacement through a catheter. 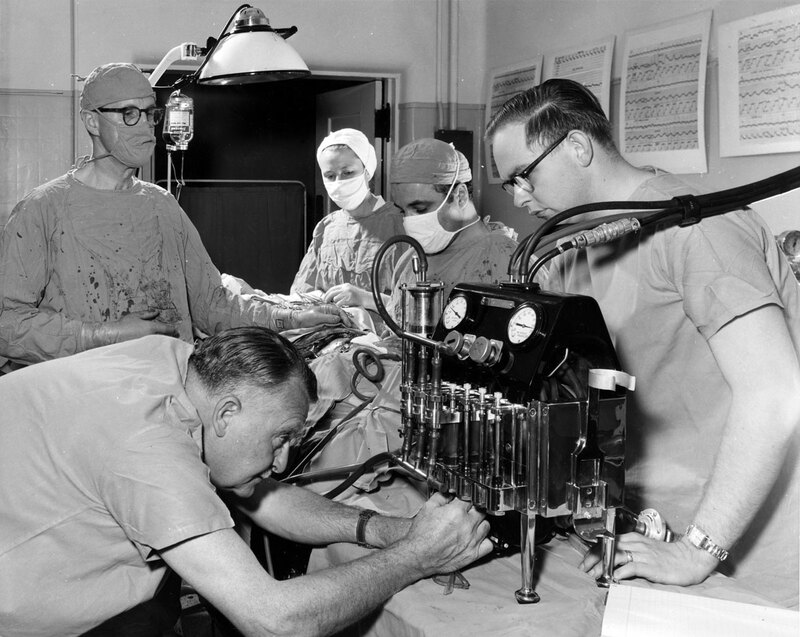 A leader in interventional cardiology, Dr. O’Neill pioneered the use of angioplasty to treat heart attacks. 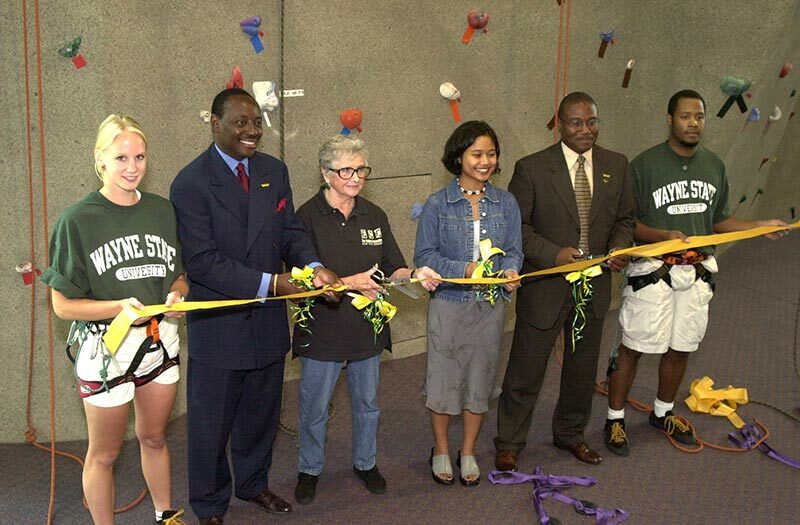 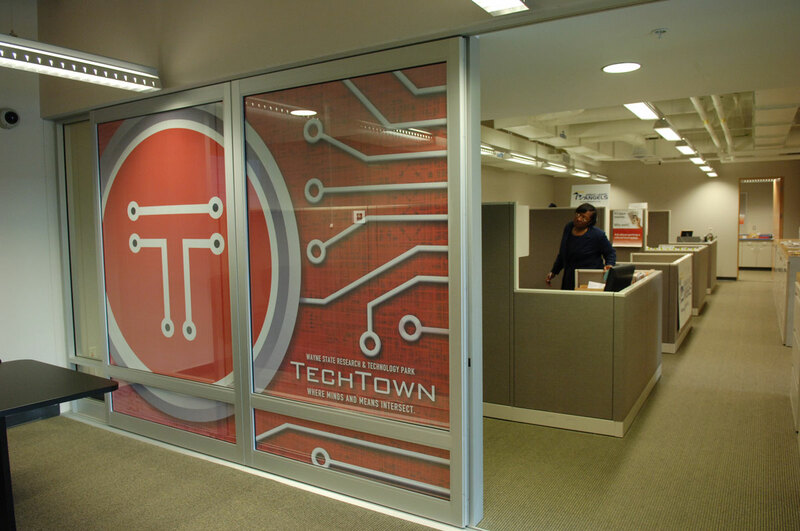 Wayne State University purchases Chatsworth Tower and Chatsworth Annex. 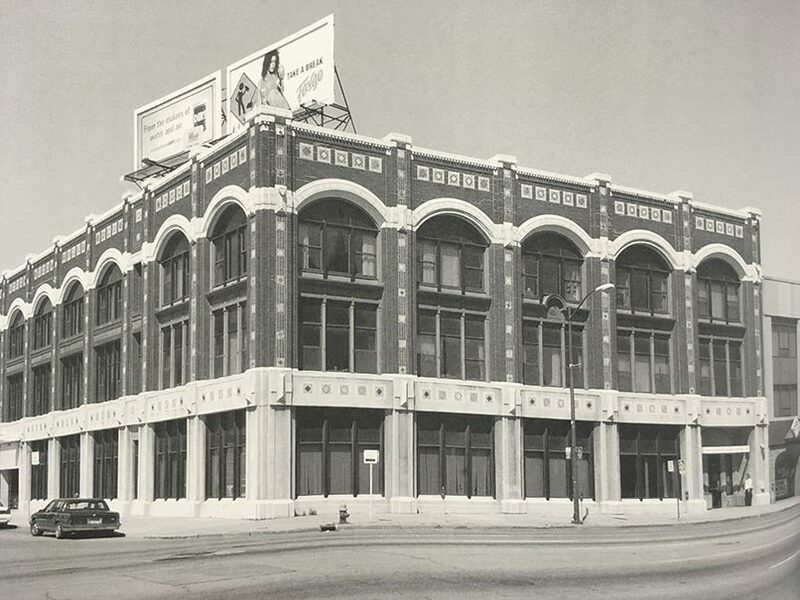 Built in 1928, Chatsworth Tower is listed on the National Register of Historic Places. 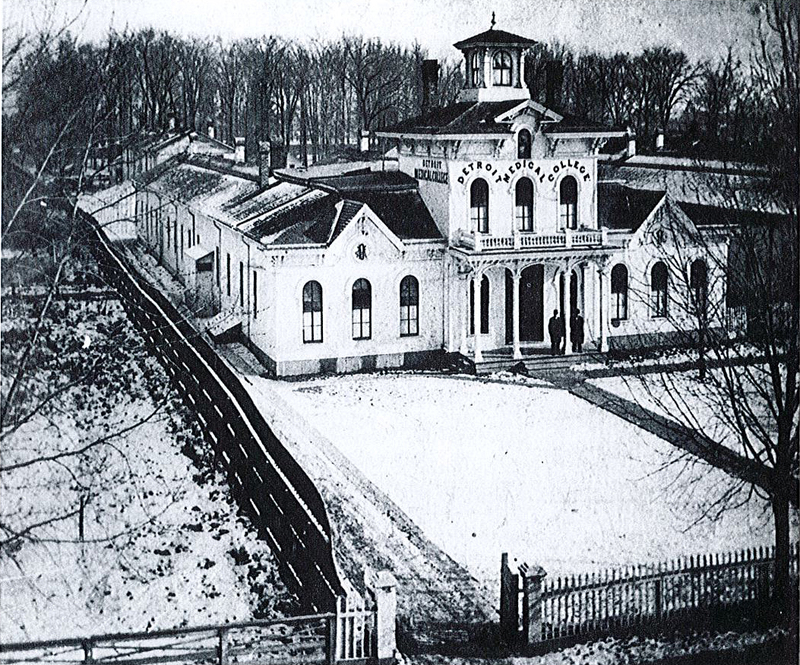 The General Library is completed. 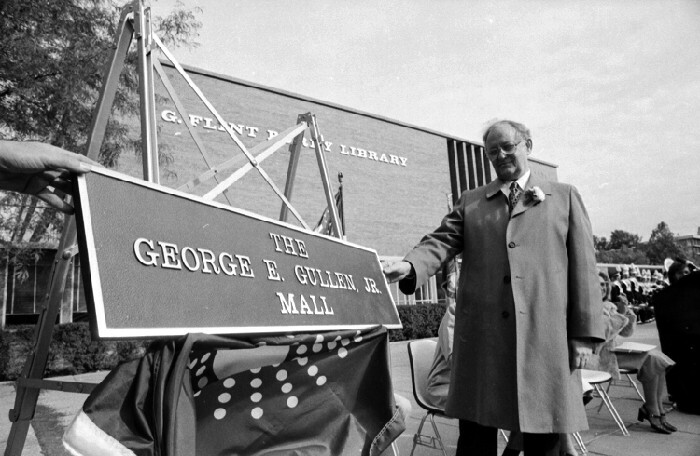 Later renamed G. Flint Purdy Library, it is now part of Purdy/Kresge Library. 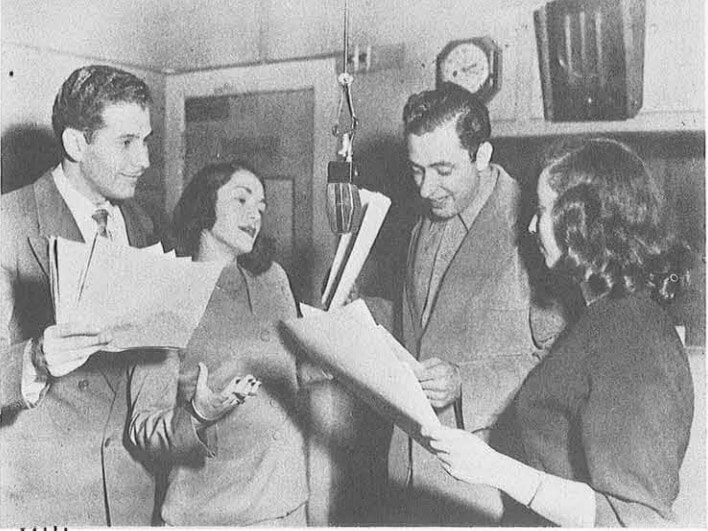 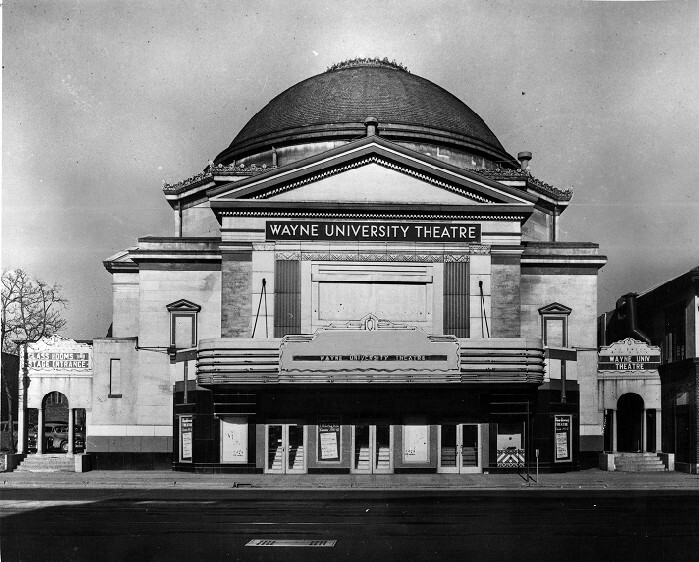 Radio station WDET is donated to Wayne University by the UAW. 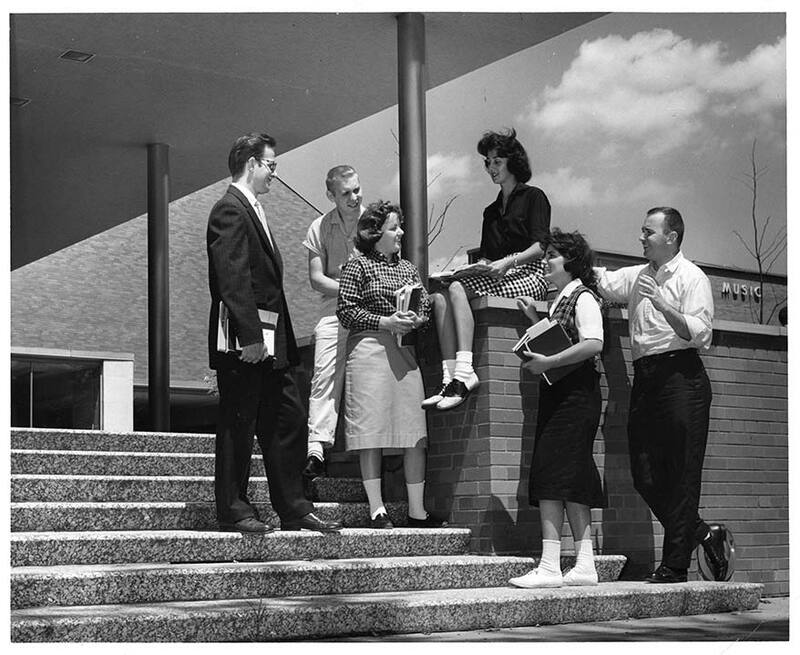 The Student Center is completed. 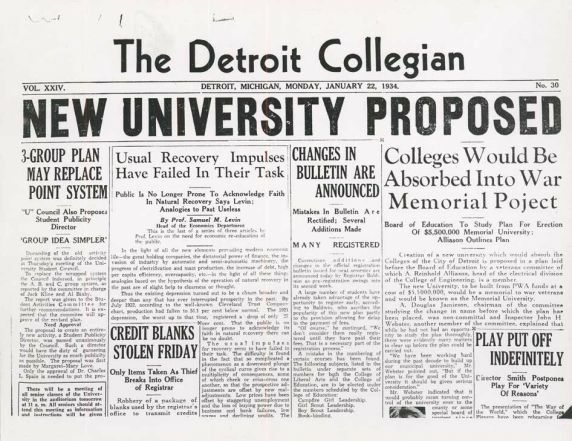 Wayne State’s African Democracy Project (ADP) is founded by FOCIS in collaboration with Wayne State Honors and the Journalism Institute for Media Diversity. 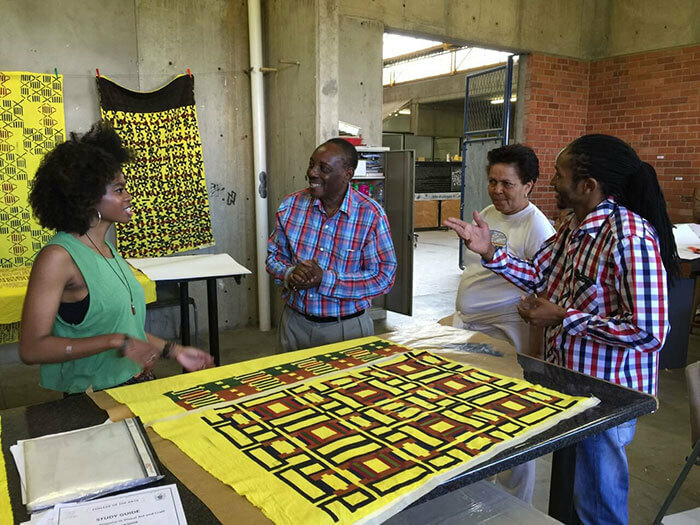 The ADP has traveled to countries including Mozambique, Botswana, Ghana and Liberia. 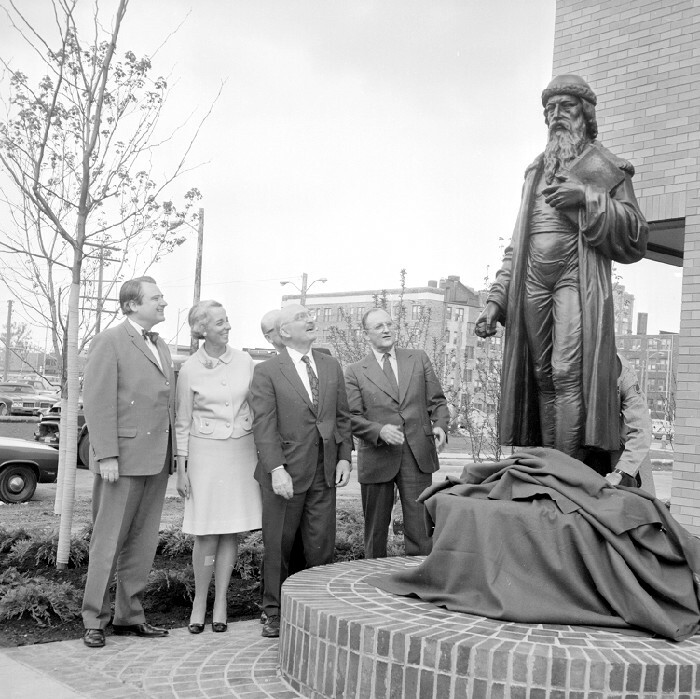 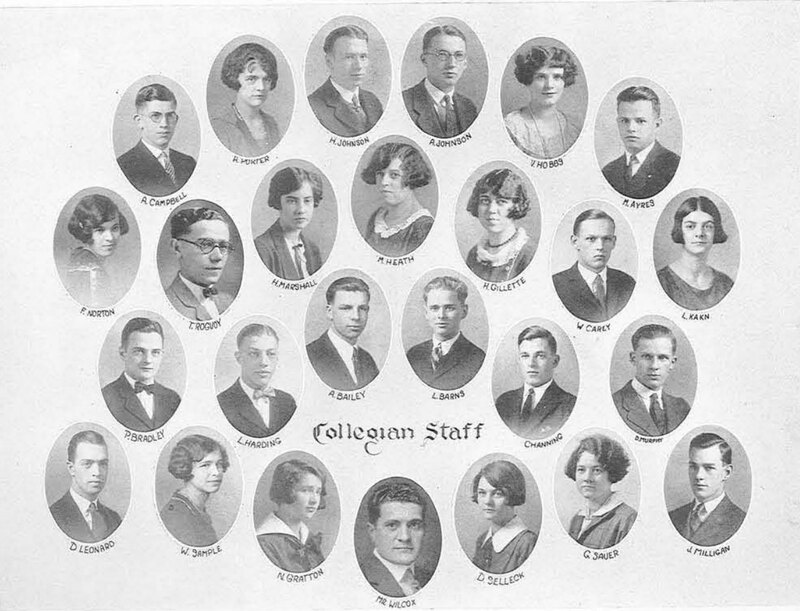 The College of Pharmacy is founded. 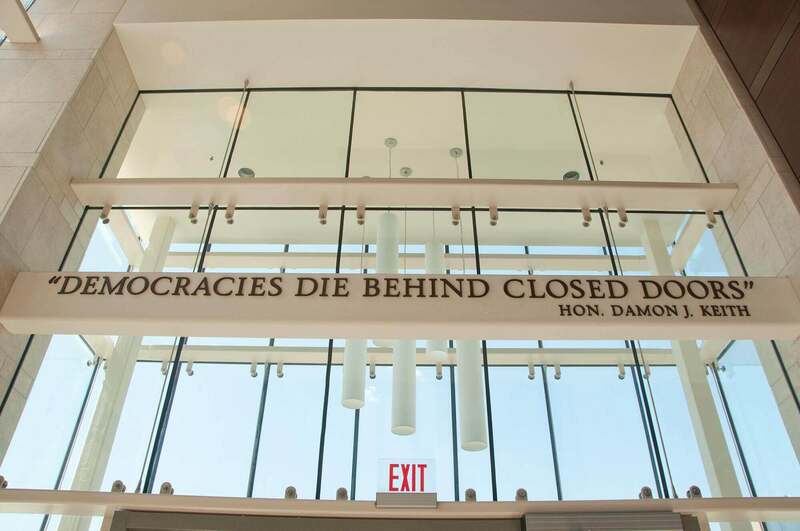 The Damon J. Keith Center for Civil Rights opens at WSU to study and support the civil rights of underrepresented communities in urban areas. 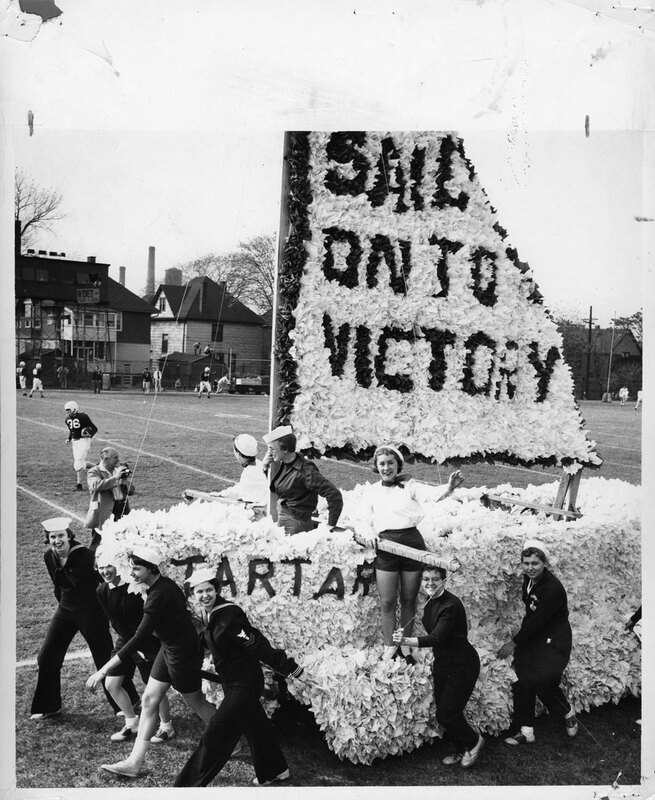 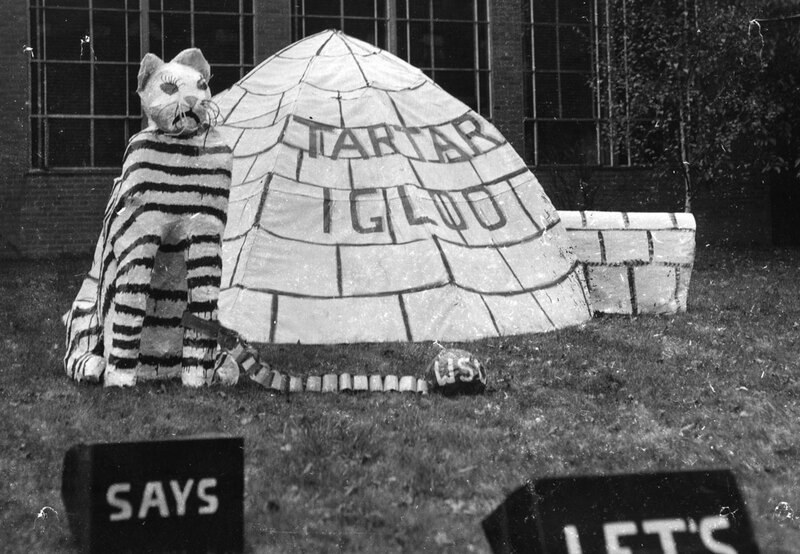 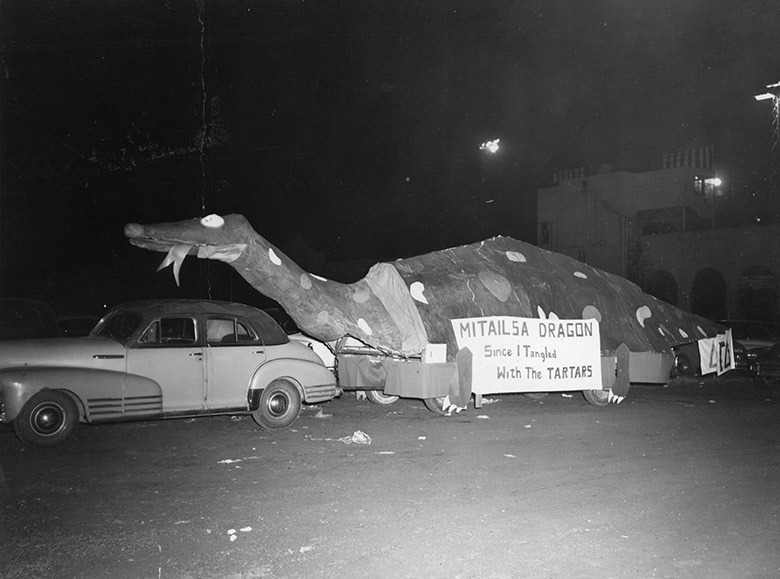 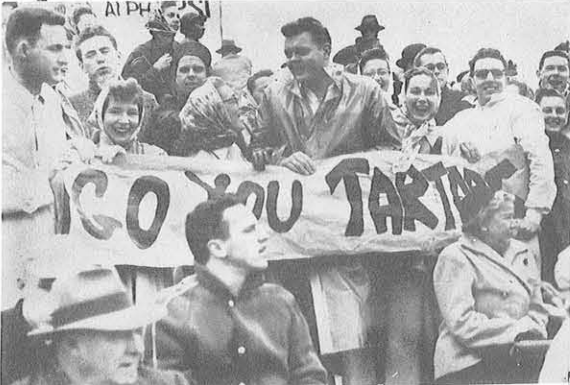 Tartars are adopted as the school mascot of City College, a predecessor of Wayne State. 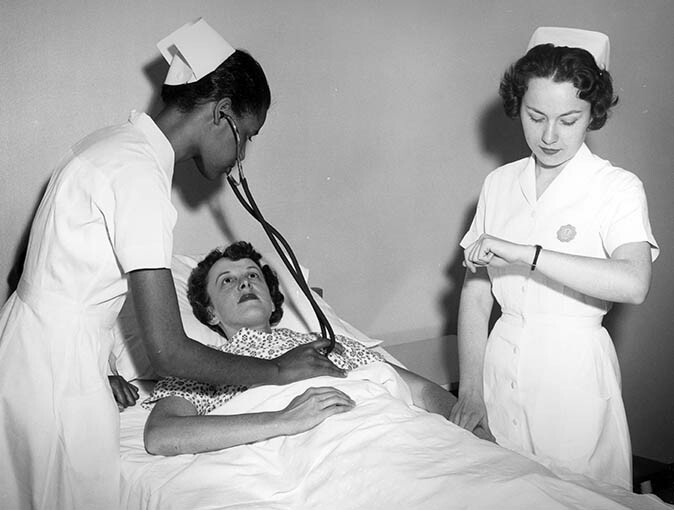 Wayne State signs contracts with Dillard and Tuskegee universities that pave the way for partnerships to prepare African American nursing faculty. 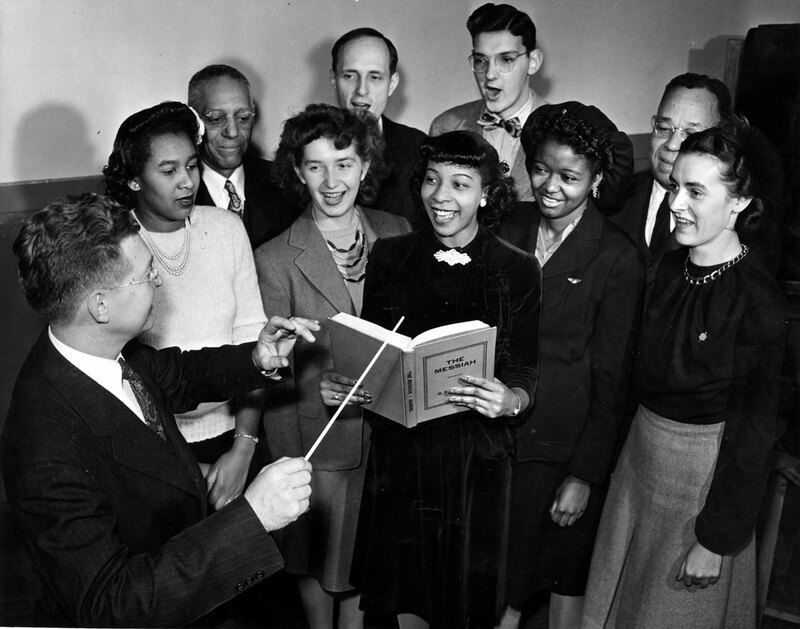 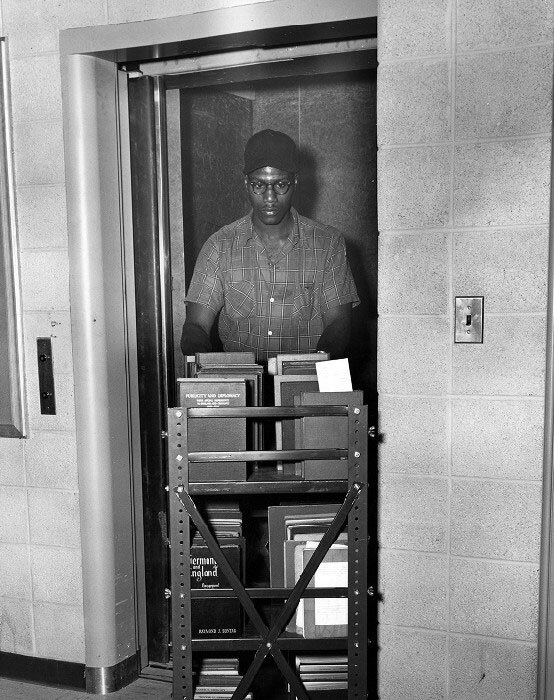 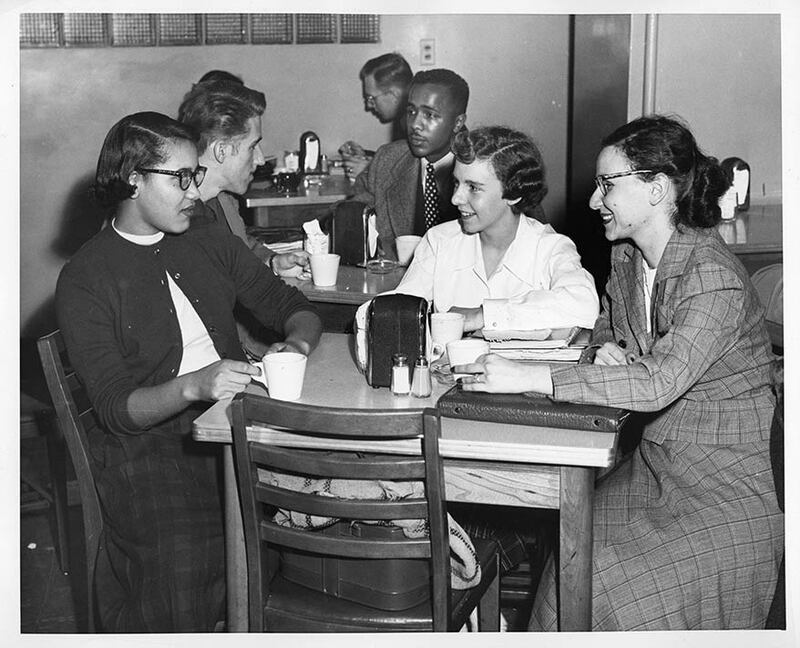 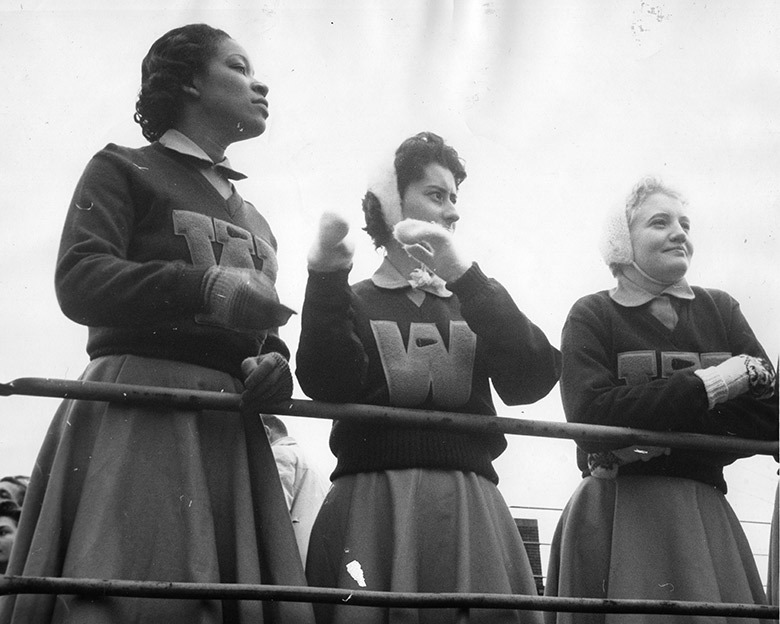 go.wayne.edu/wsu150 #wsu150 #blackhistorymonth Image courtesy of @ReutherLibrary. 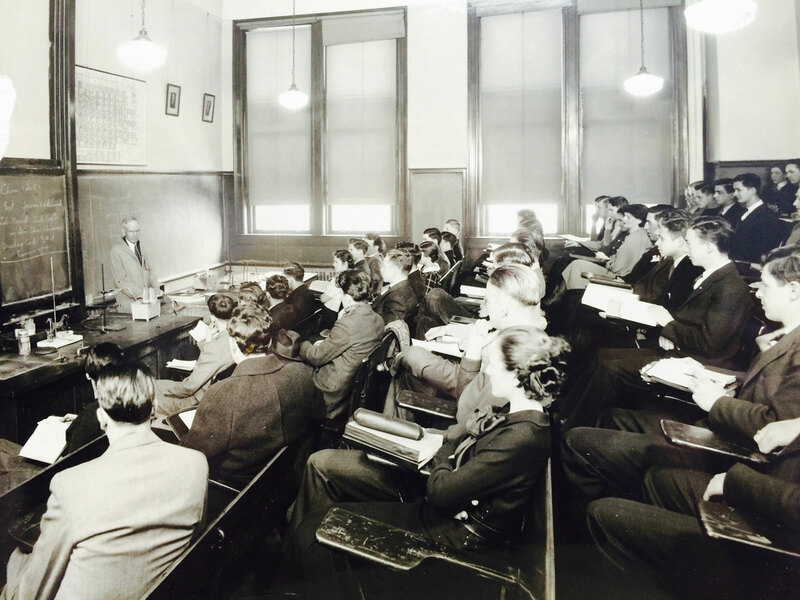 The Wayne Law Moot Court is founded to help students hone their written and oral advocacy skills. 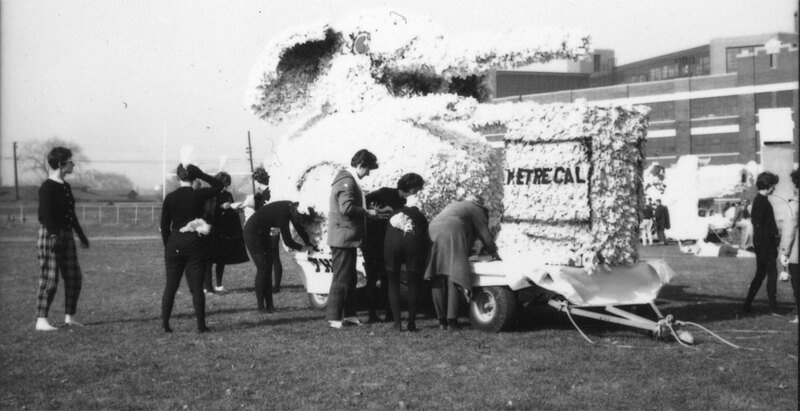 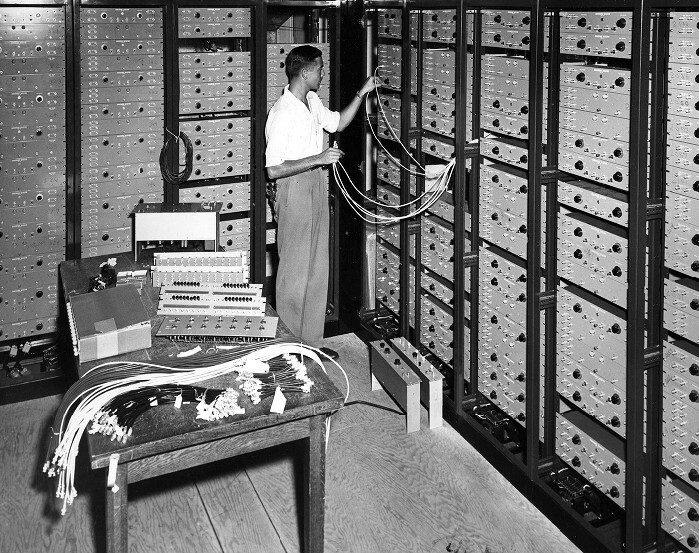 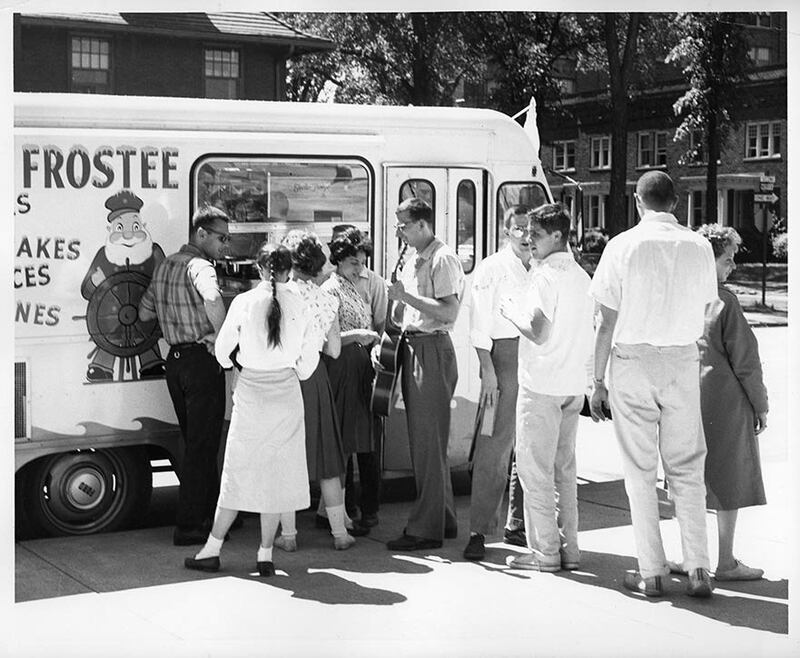 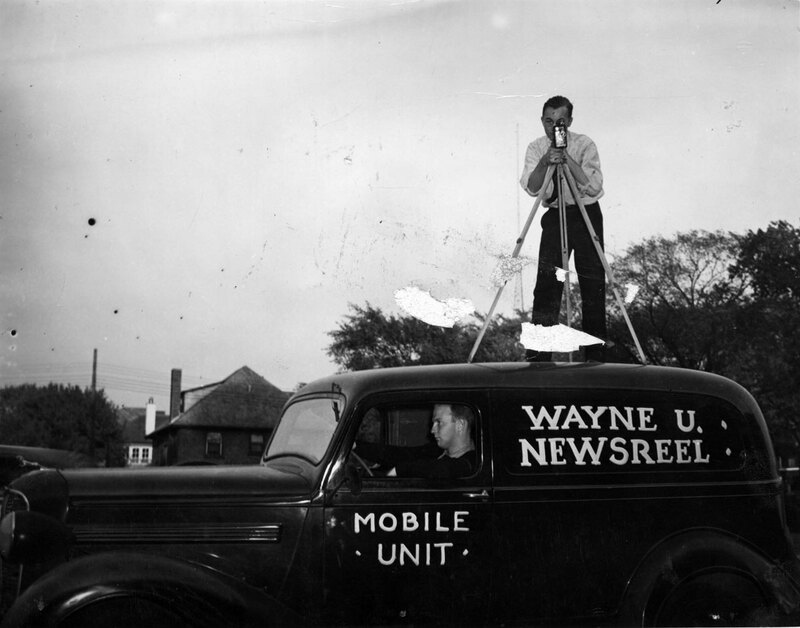 The mobile newsreel unit of the university’s TV station, WTVS-TV Channel 56, films a segment in 1957. 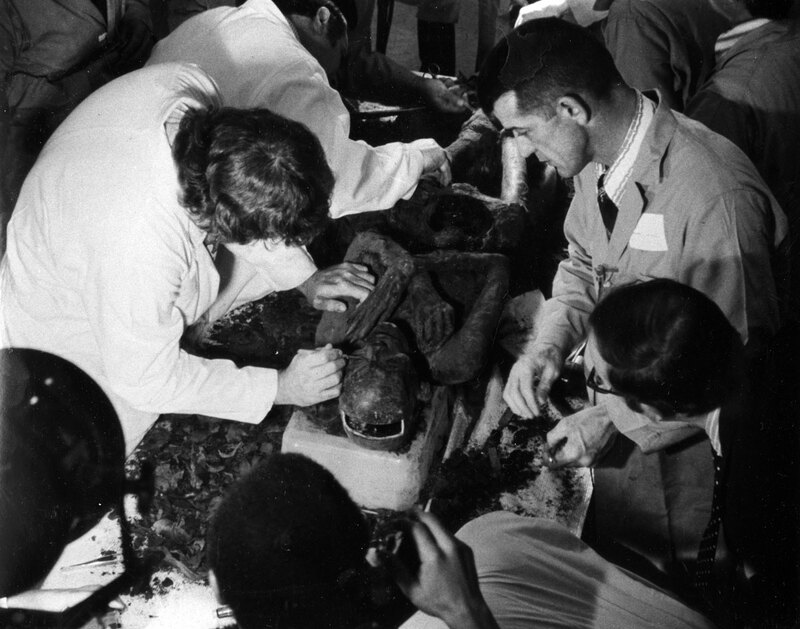 As part of a seminar on death and disease in ancient Egypt, School of Medicine researchers perform an autopsy on Pum II, a mummy on loan from the Philadelphia Museum of Art. 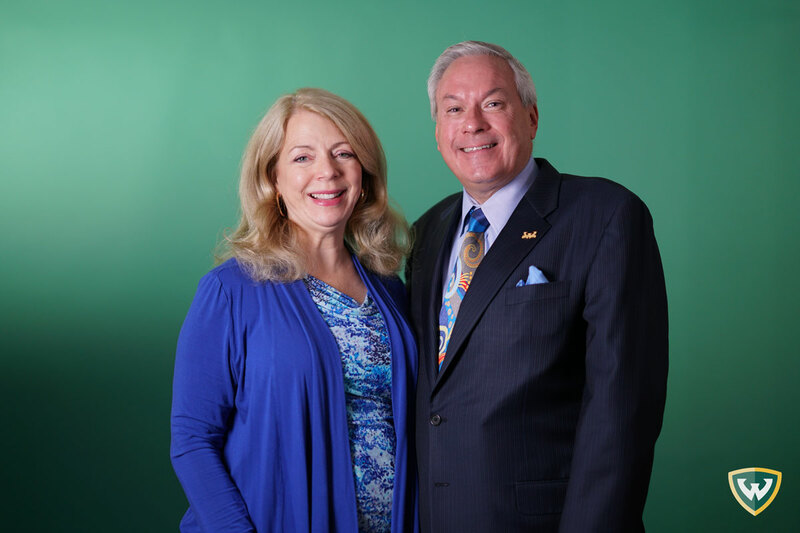 Alumni Mary and @Paulglantz, who met during a class at Wayne State, participate in the launch of the #warriorstrong campaign. 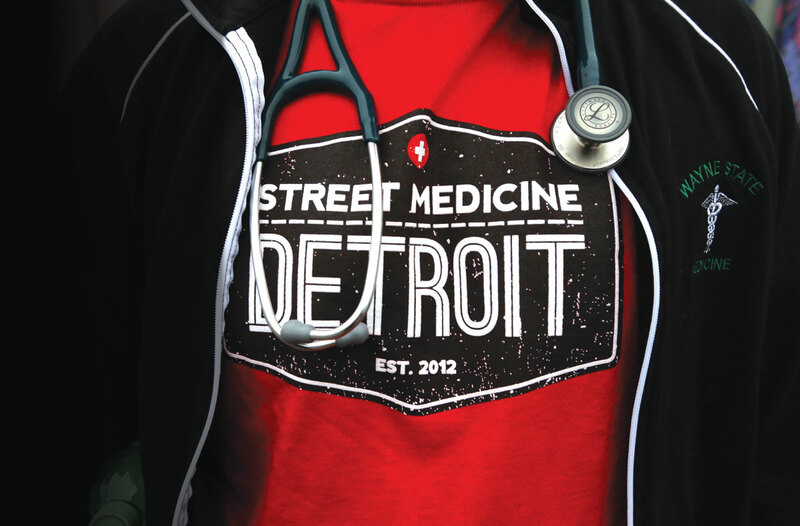 Street Medicine Detroit, a student organization in the School of Medicine that provides medical care to the city’s homeless residents, is founded. 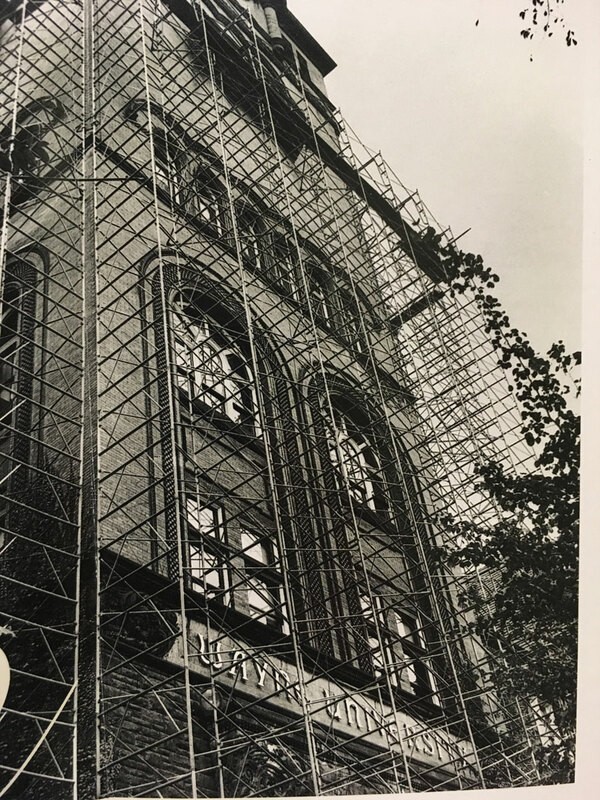 Federal relief funds assigned through the New Deal allow for remodeling at the Main Building, which is later renamed Old Main. 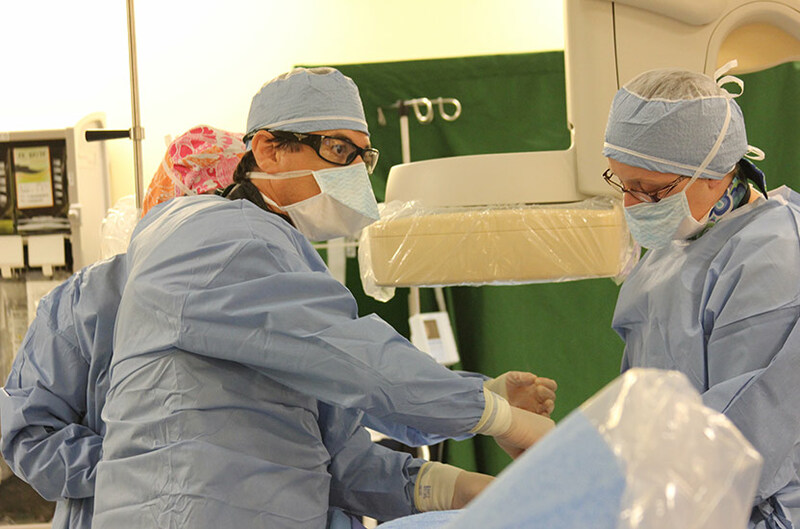 Alexa Canady, M.D., joins the School of Medicine faculty. 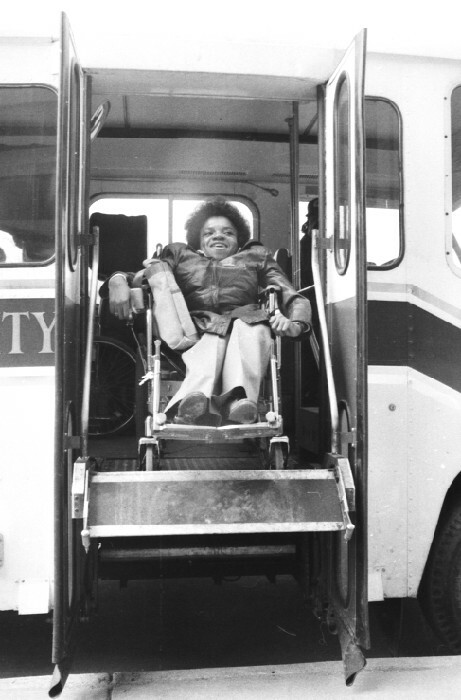 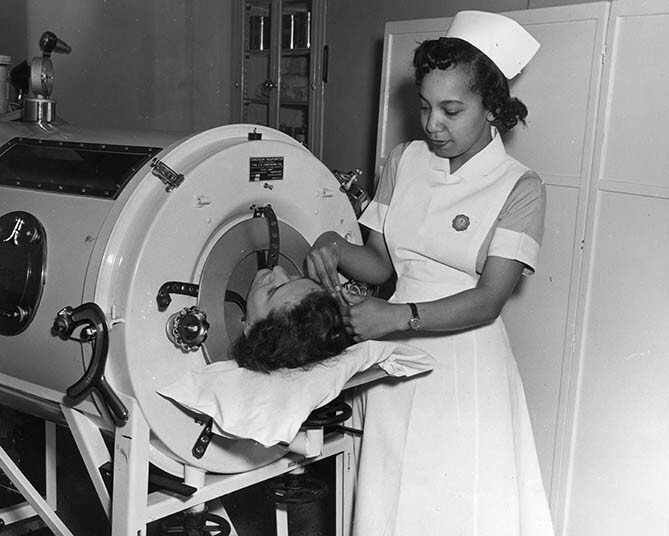 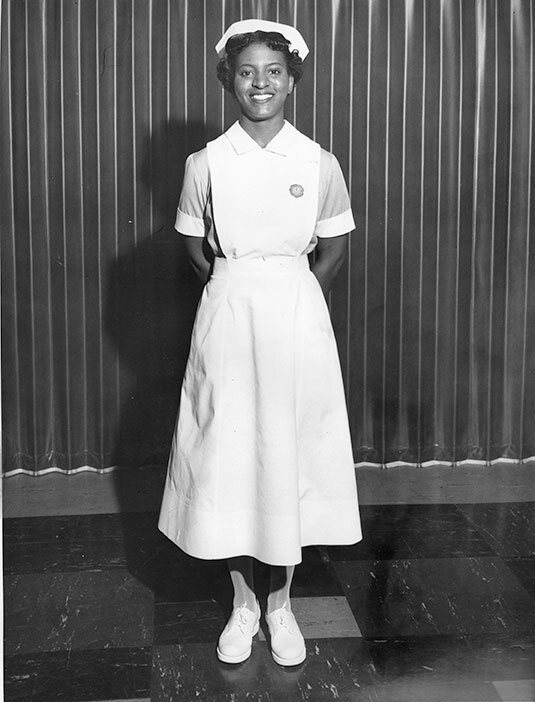 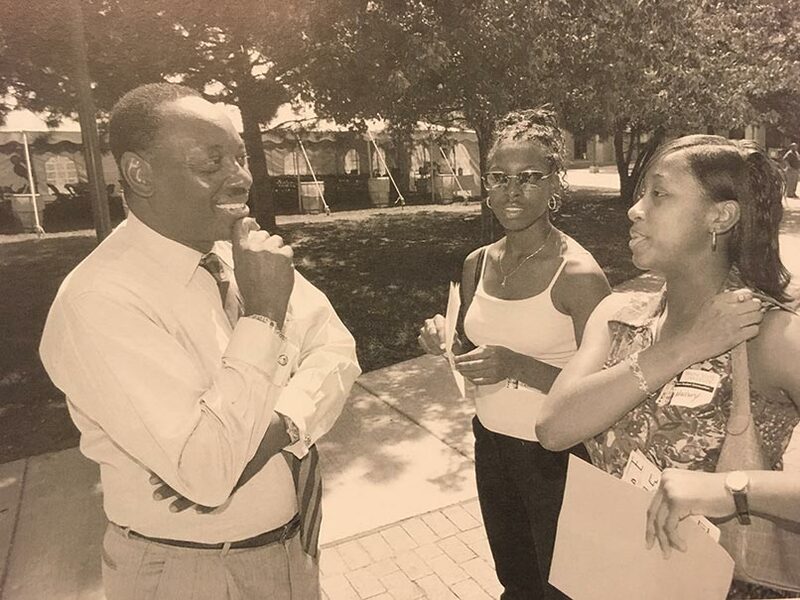 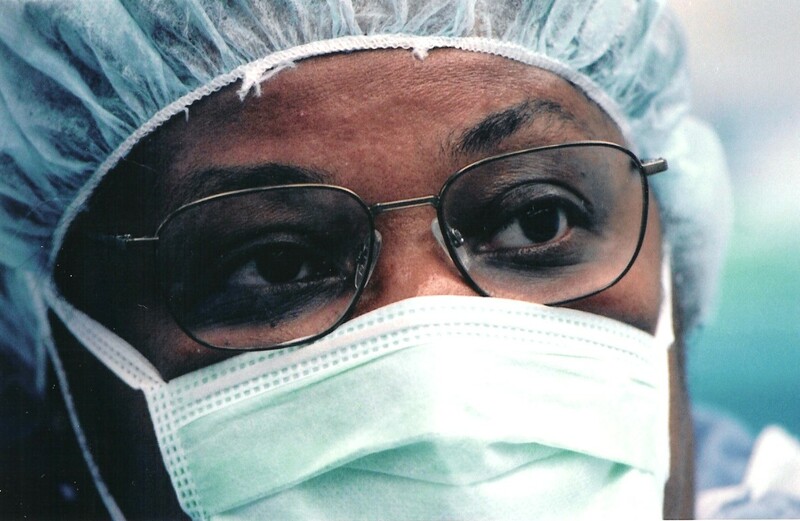 The nation’s first female African American neurosurgeon, Canady would stay at Wayne State until her retirement in 2001. 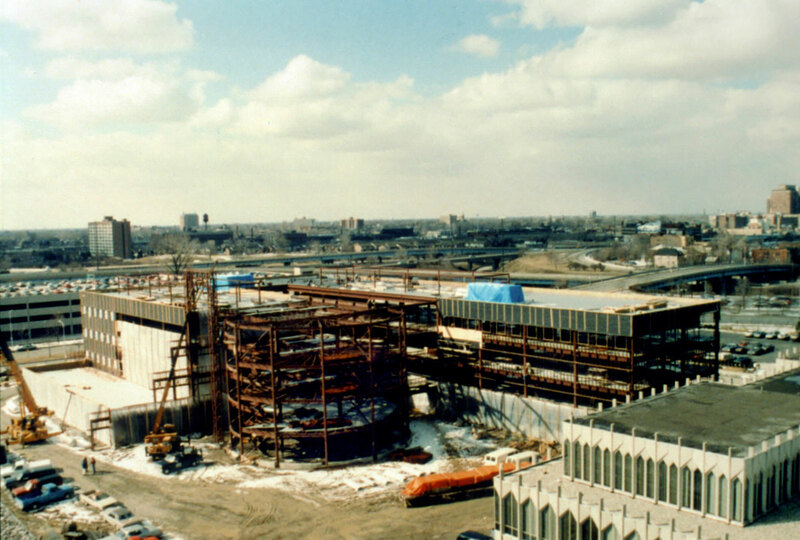 The Frederick C. Matthaei Physical Education and Recreation Building is constructed as part of Detroit’s bid for the 1968 Olympics. 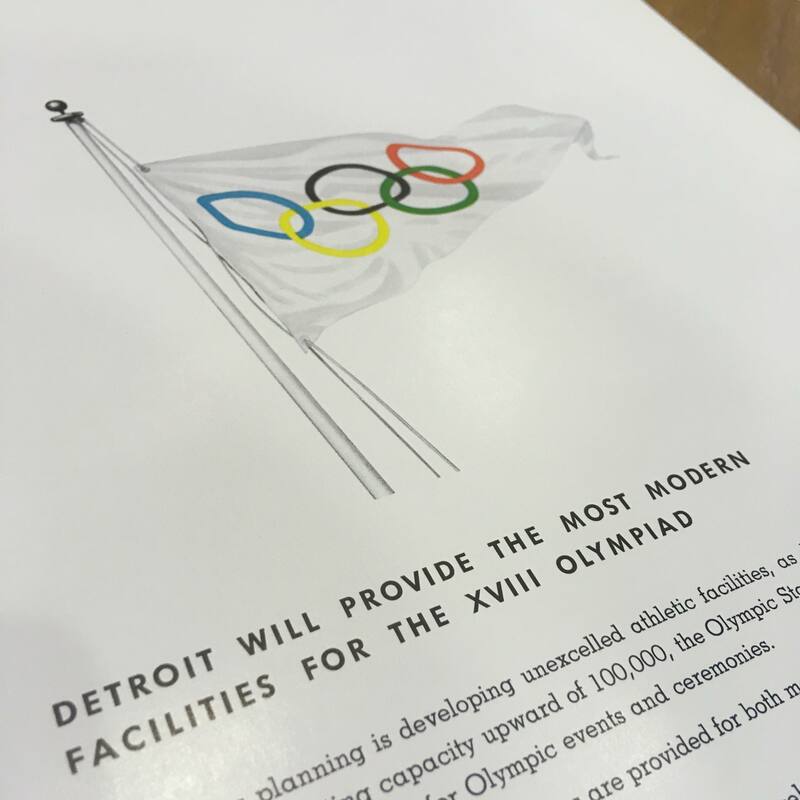 The Summer Games would ultimately take place in Mexico City, with the Matthaei becoming part of WSU’s campus. 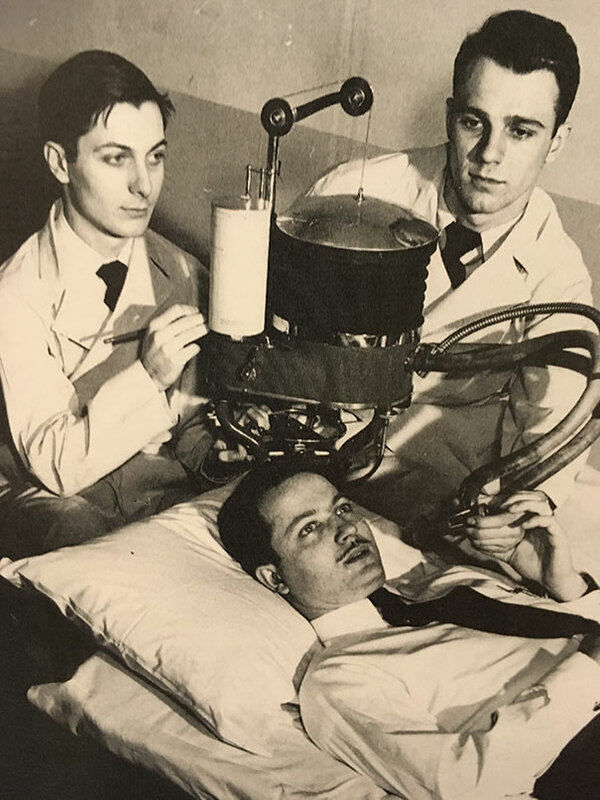 Wayne State researcher Forest Dewey Dodrill, M.D., and General Motors engineers design a machine to temporarily replace the blood-pumping function of the heart, making open-heart surgery possible. 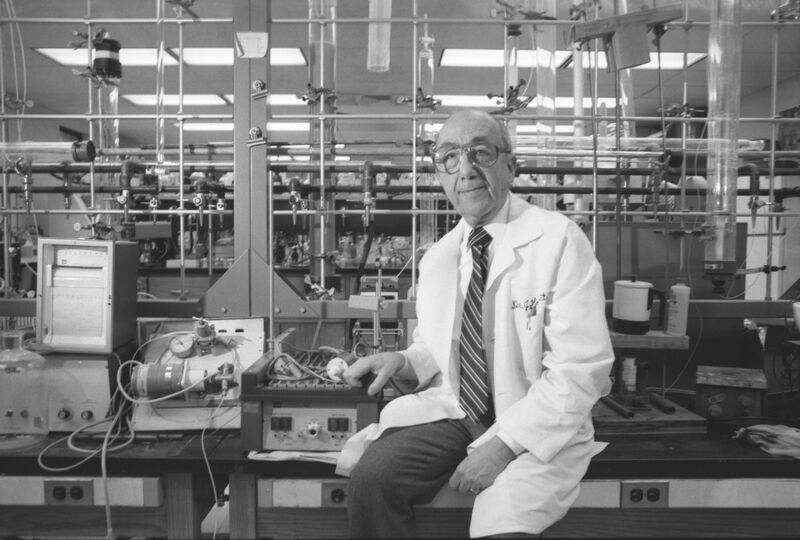 The drug AZT, created by Wayne State professor and researcher Jerome P. Horwitz, becomes the first federally approved treatment for AIDS. 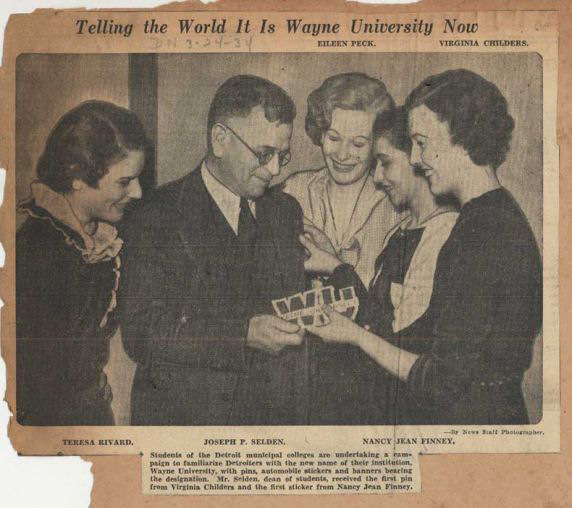 Alumna Sonya Tayeh (CFPCA ’02) teaches a master class at Wayne State. 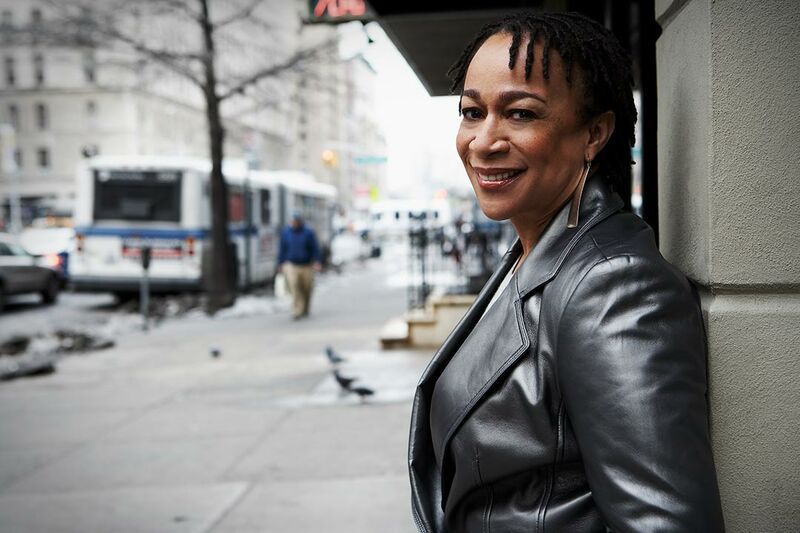 The two-time Emmy Award-winning choreographer is best known for her work on the TV show So You Think You Can Dance. 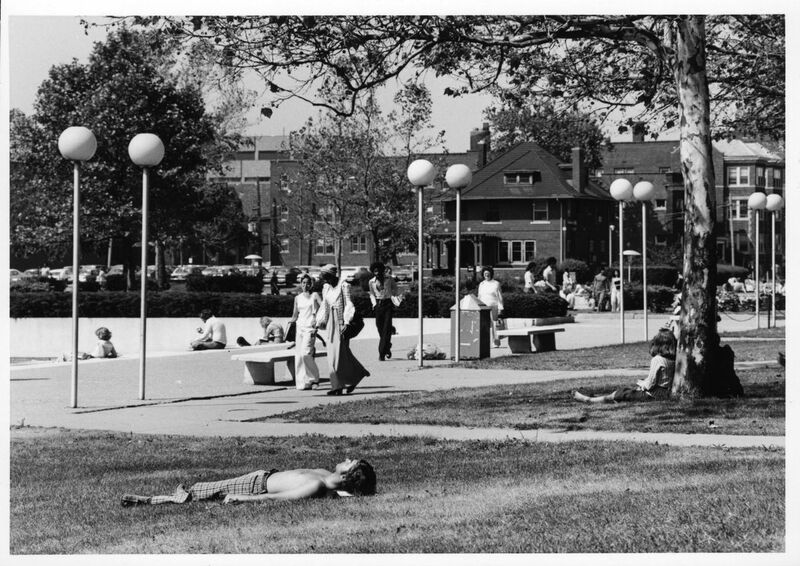 To accommodate campus pedestrians, Second Avenue north of Warren is closed to vehicular traffic and ultimately becomes Gullen Mall. 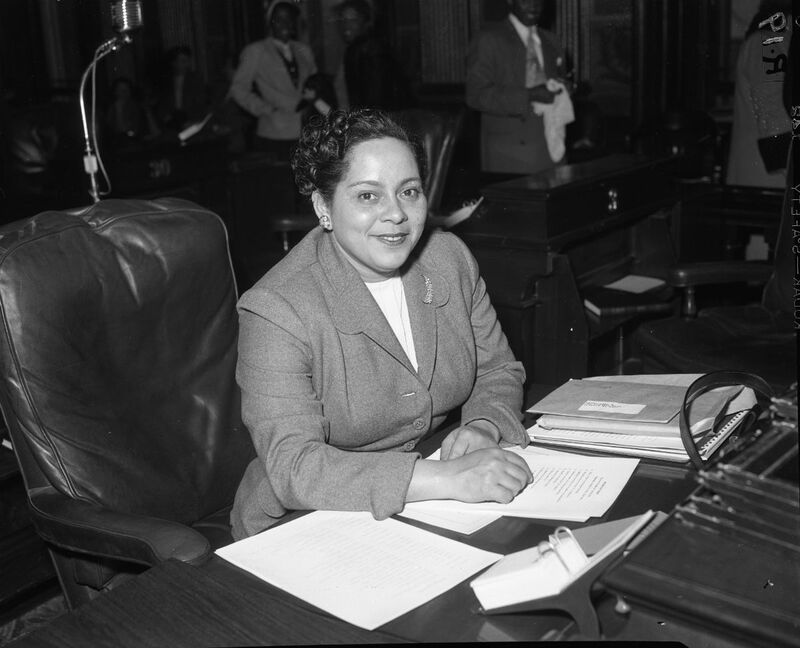 Law School alumna Cora Brown becomes the first African American woman in the country to be elected to a state senate. 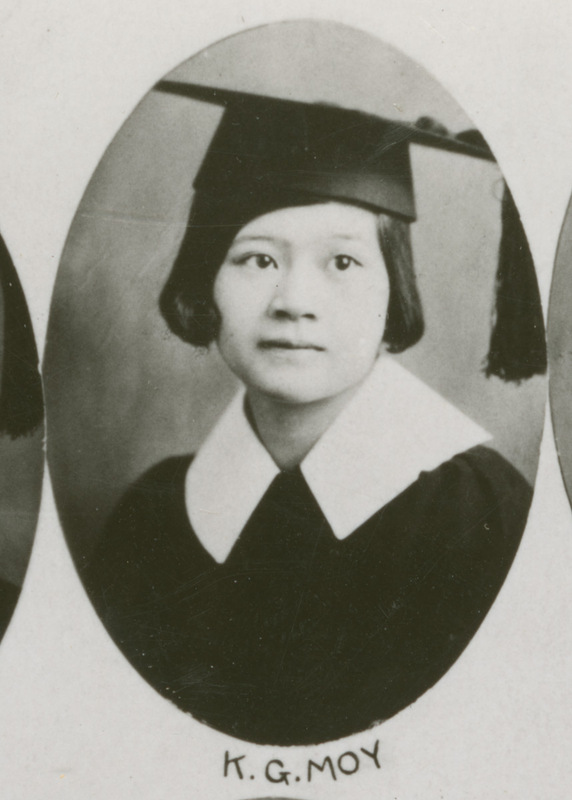 The College of Pharmacy graduates its first five pharmacists including Katie Moy Lim, the first female and first Chinese graduate of the college. 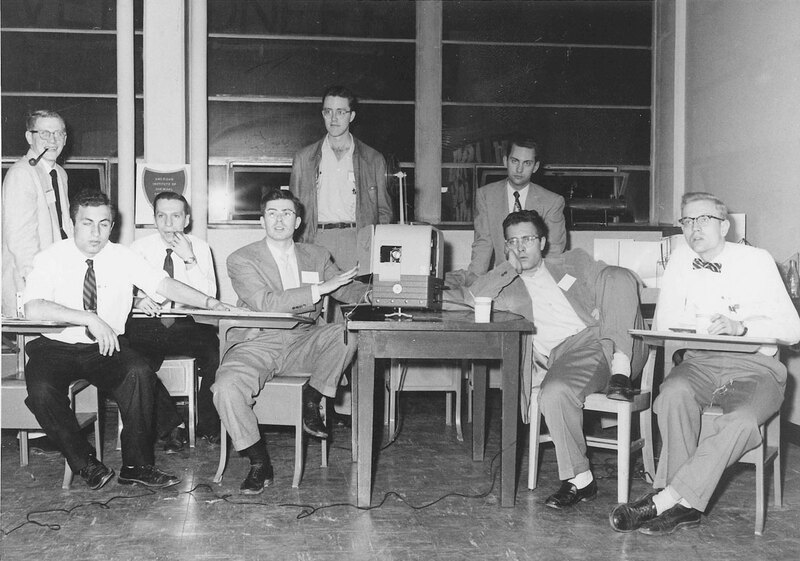 WSU faculty members Robert Harr and Paul Karchin are part of the research team awarded the Nobel Prize for discovering the Higgs boson, also known as "the God particle" — the most sought-after particle in the history of physics. 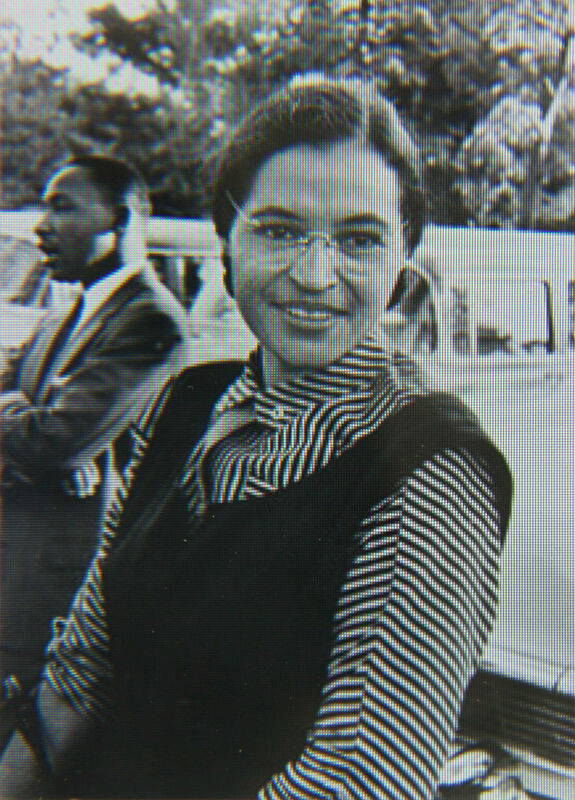 Wayne State University awards Rosa Parks an honorary degree. 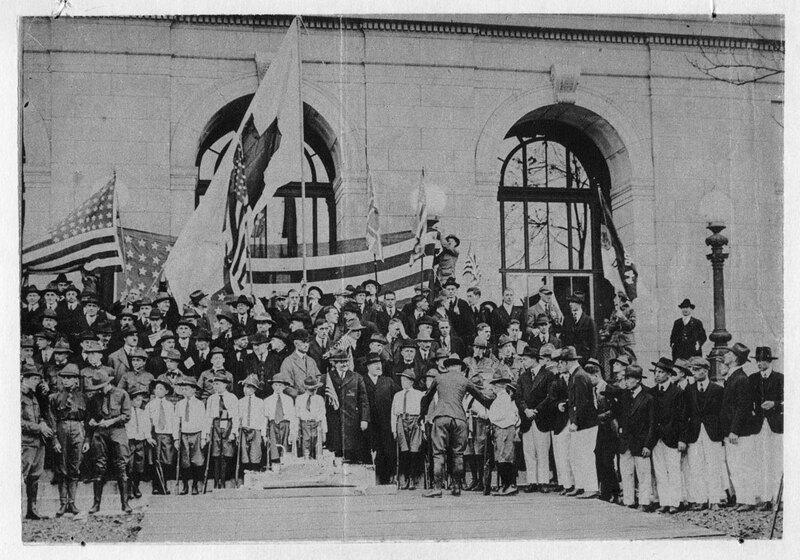 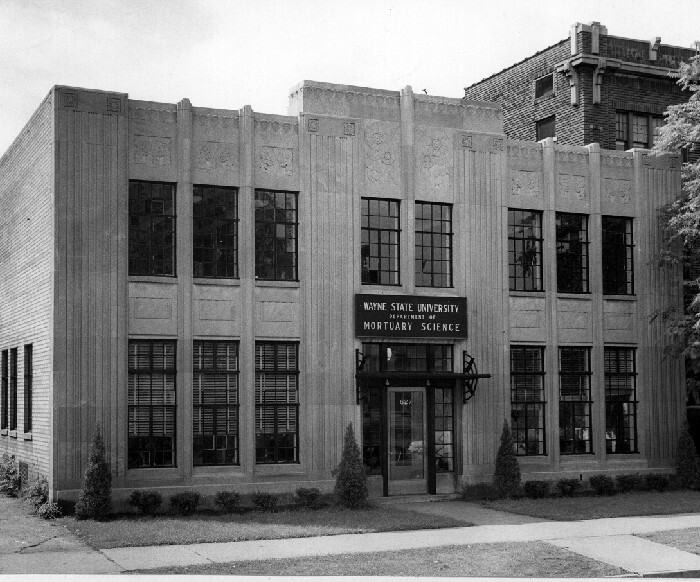 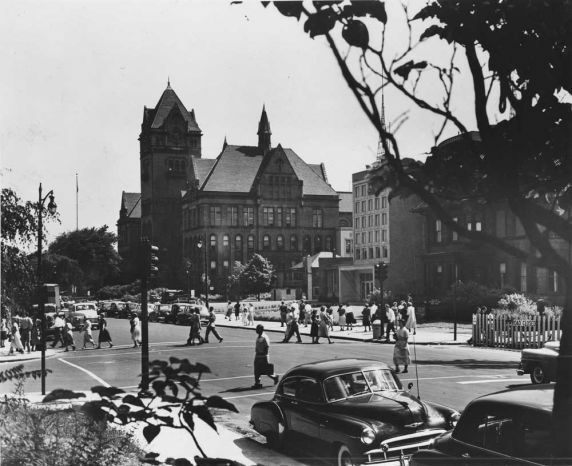 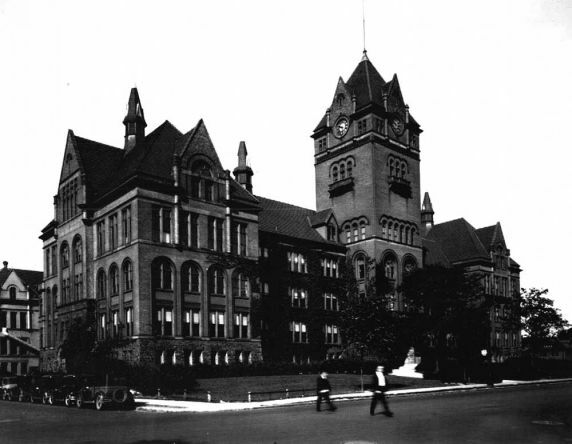 The Detroit Normal Training School, a predecessor of the College of Education, is founded. 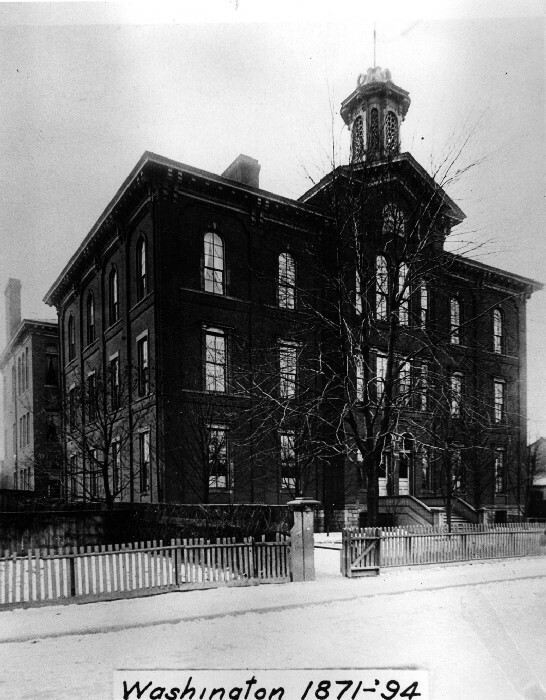 The Washington School building, pictured, would serve as its home from 1895 to 1914. 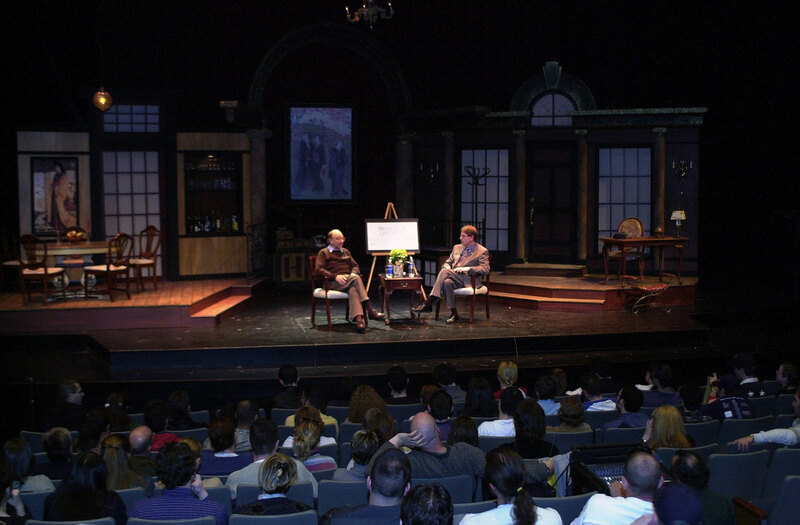 Playwright Neil Simon visits Wayne State University’s College of Fine, Performing and Communication Arts for a master class. 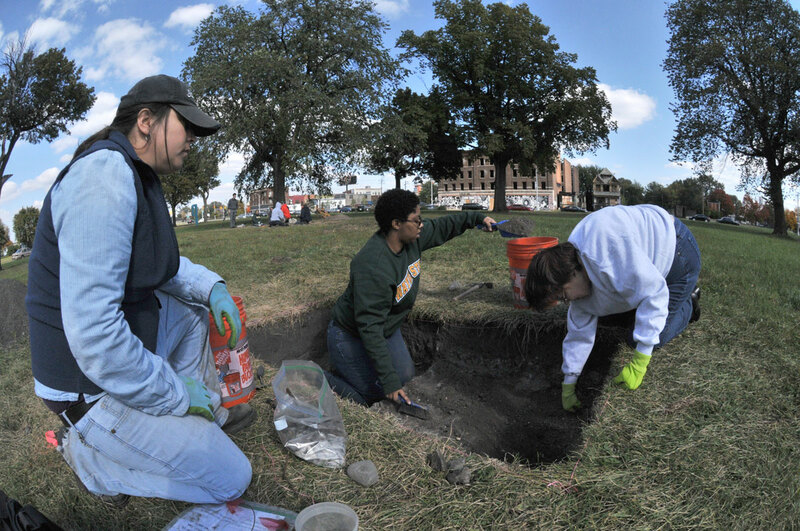 Wayne State students and faculty conduct an archaeological dig in Roosevelt Park. 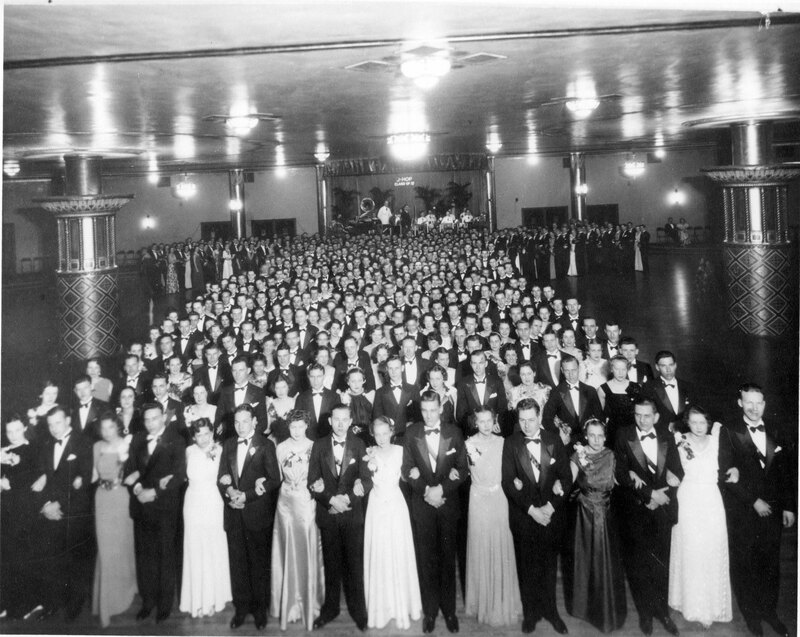 Students pose for a group photo during the J-Hop dance at the Fountain Ballroom in the Masonic Temple. 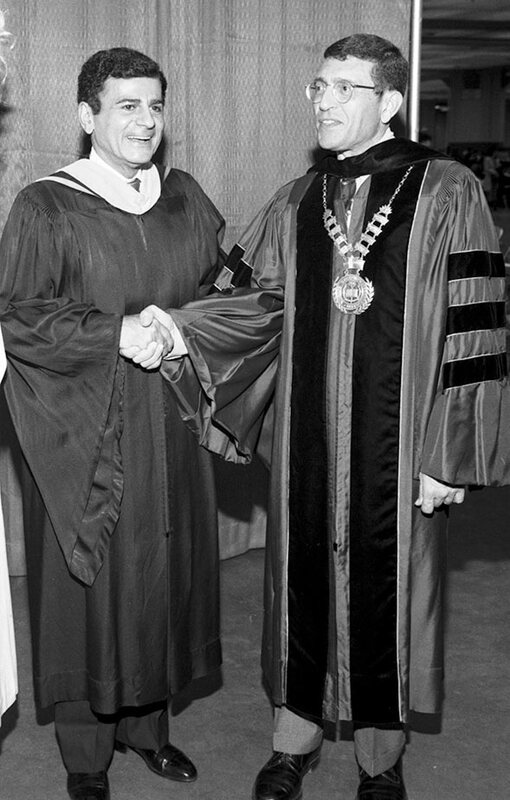 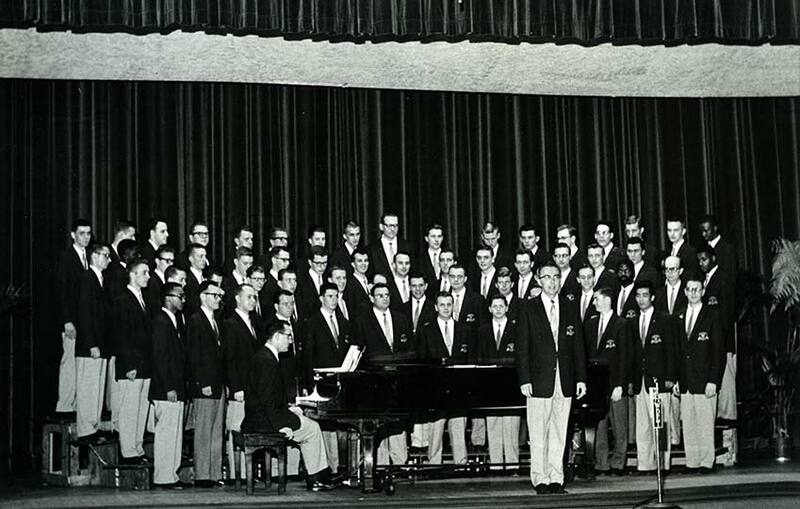 Alumnus Casey Kasem (B.S. 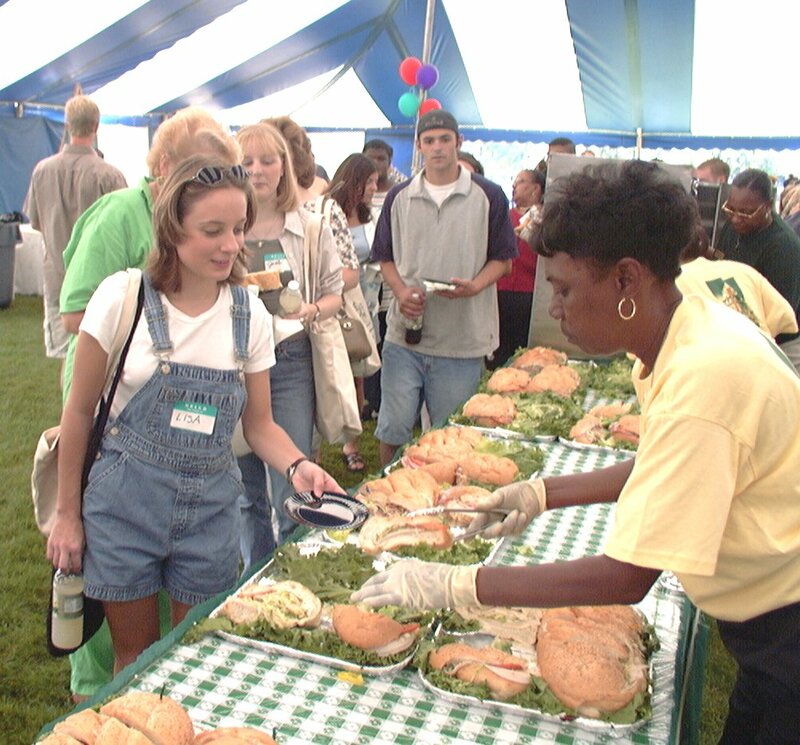 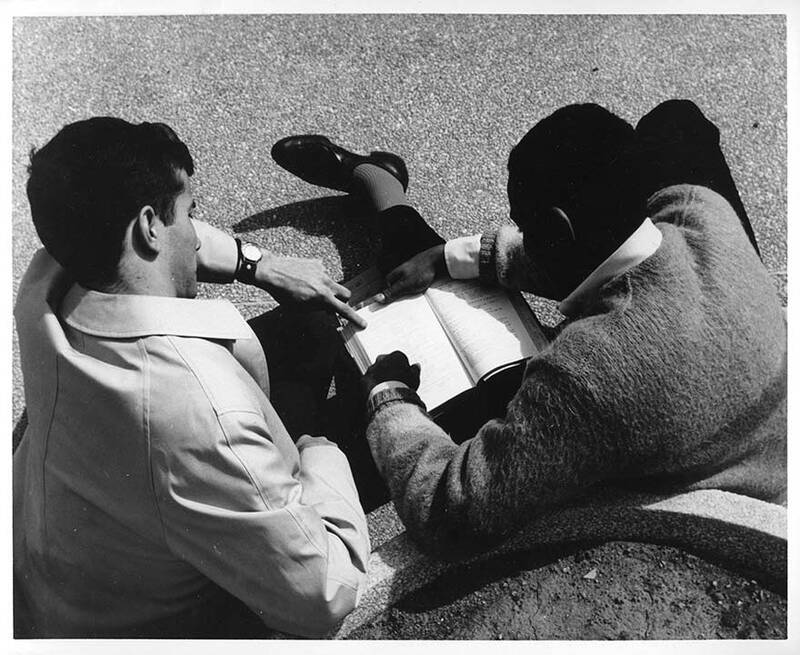 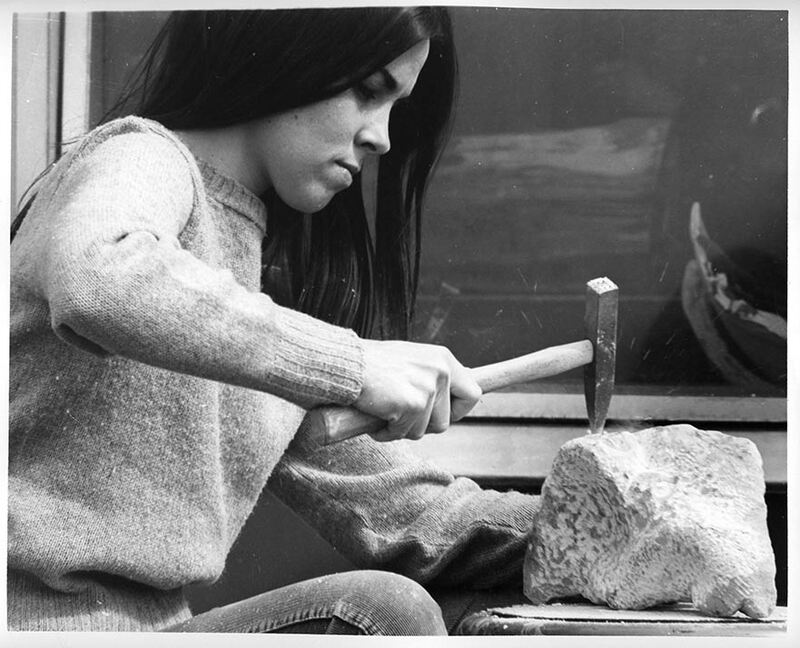 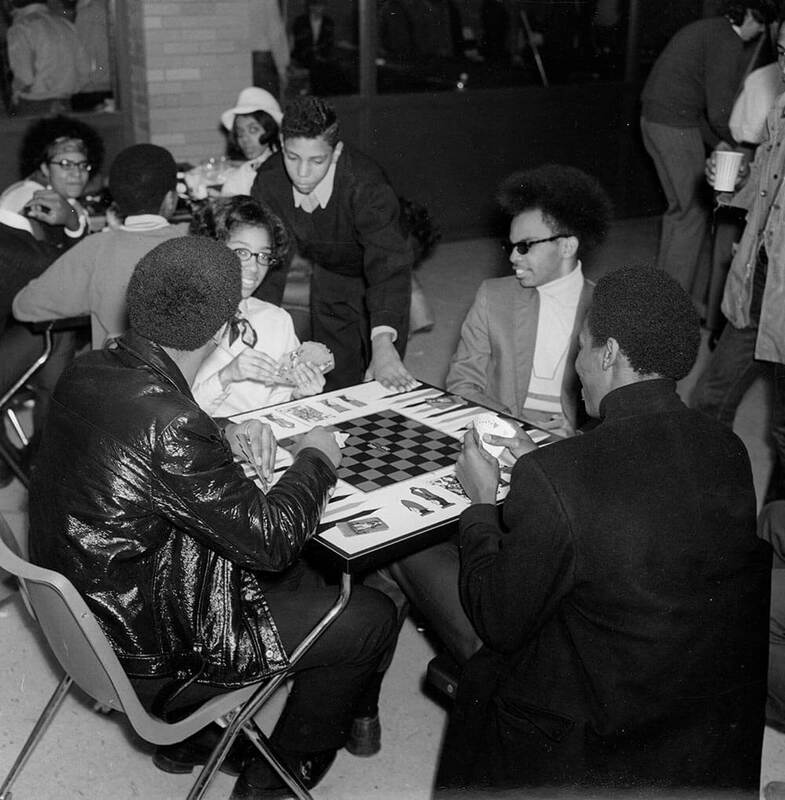 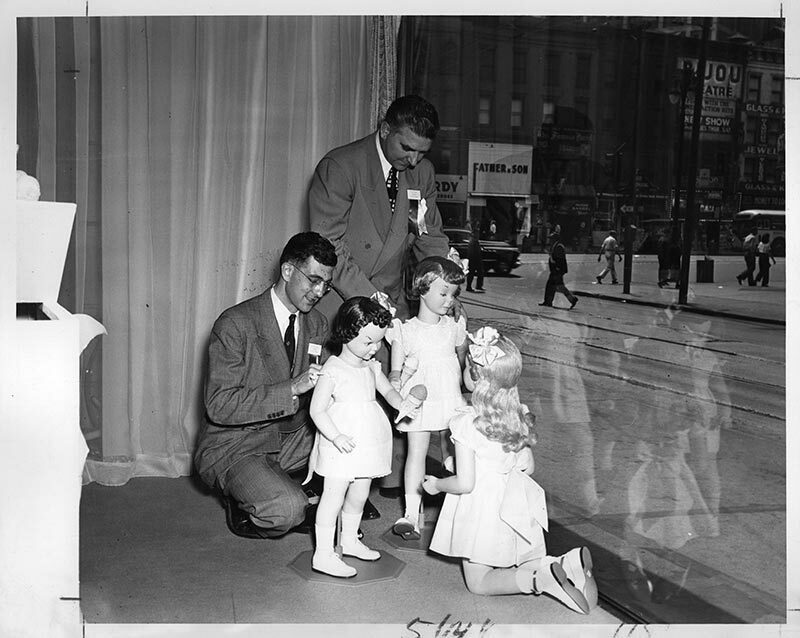 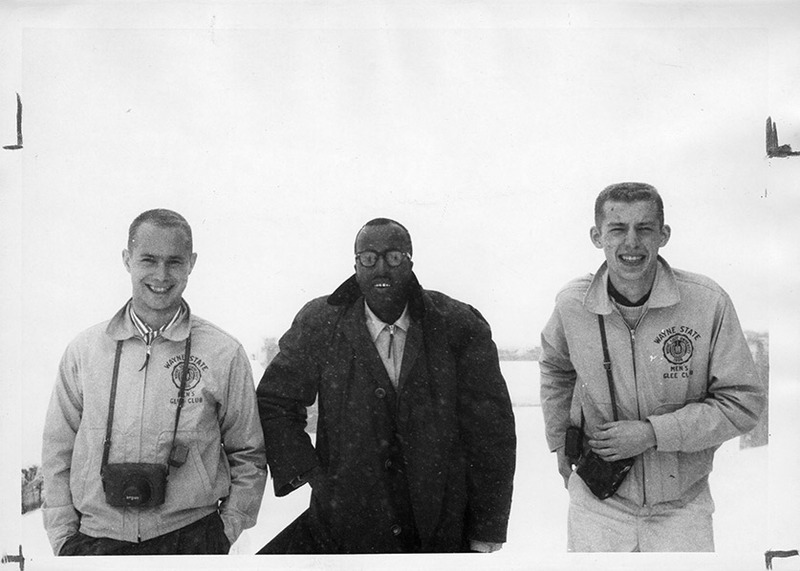 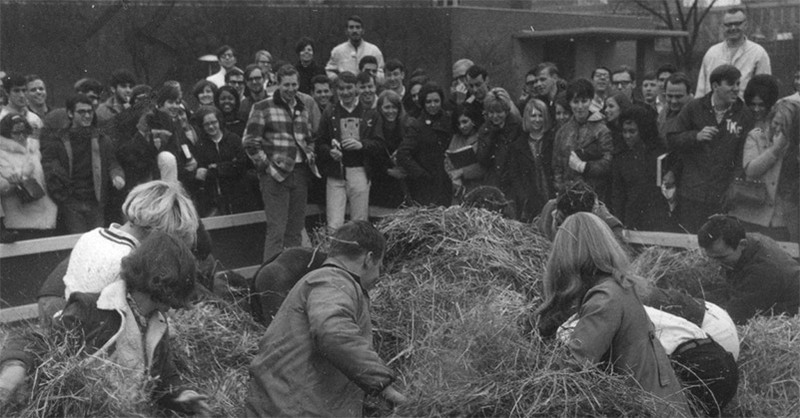 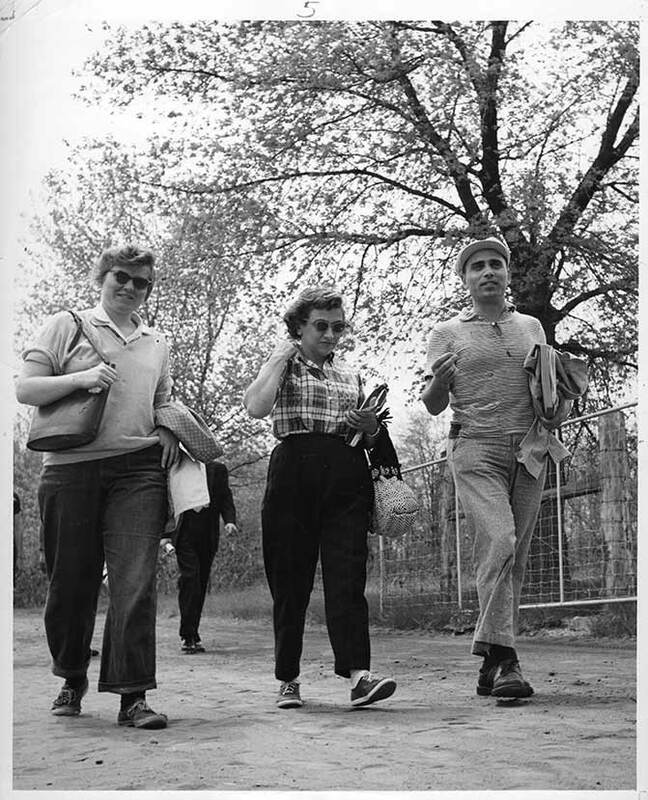 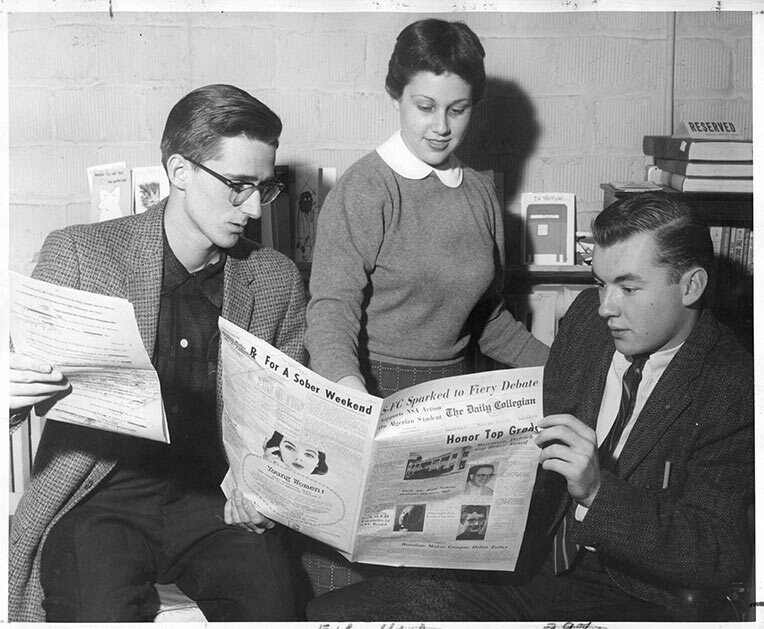 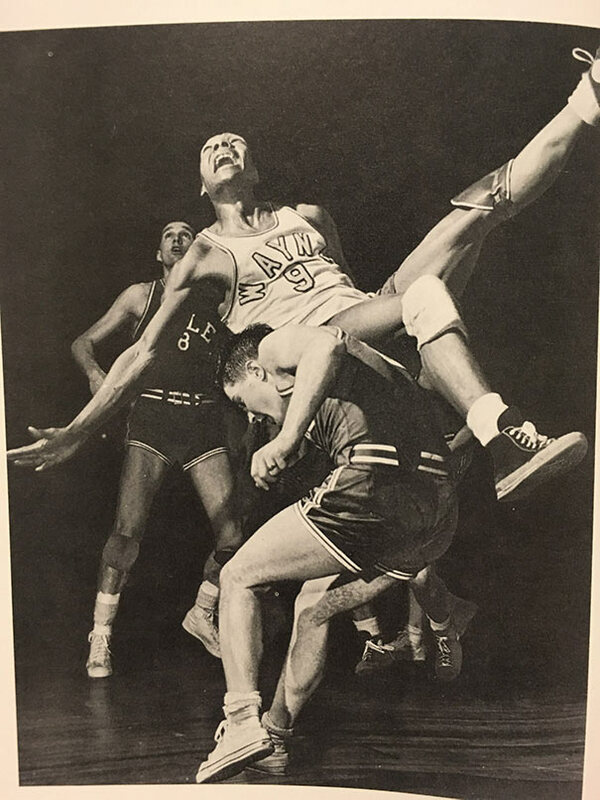 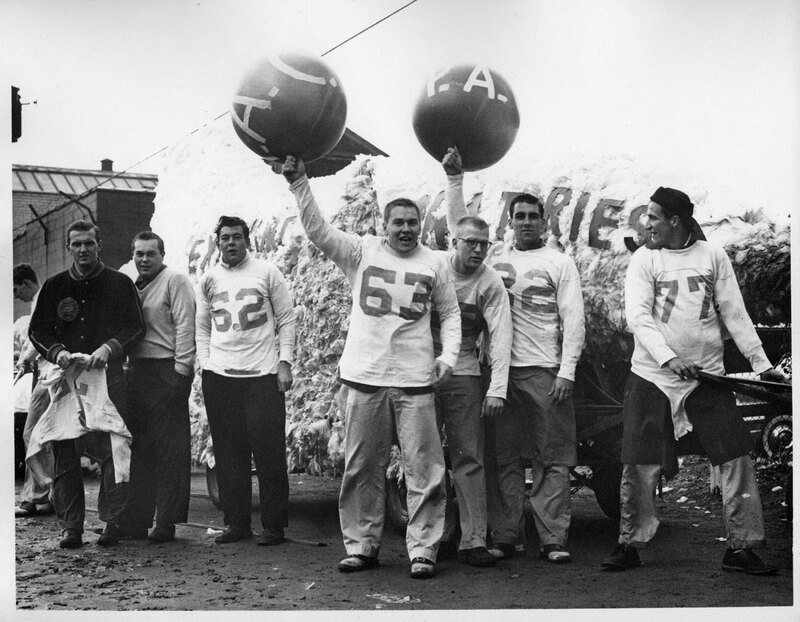 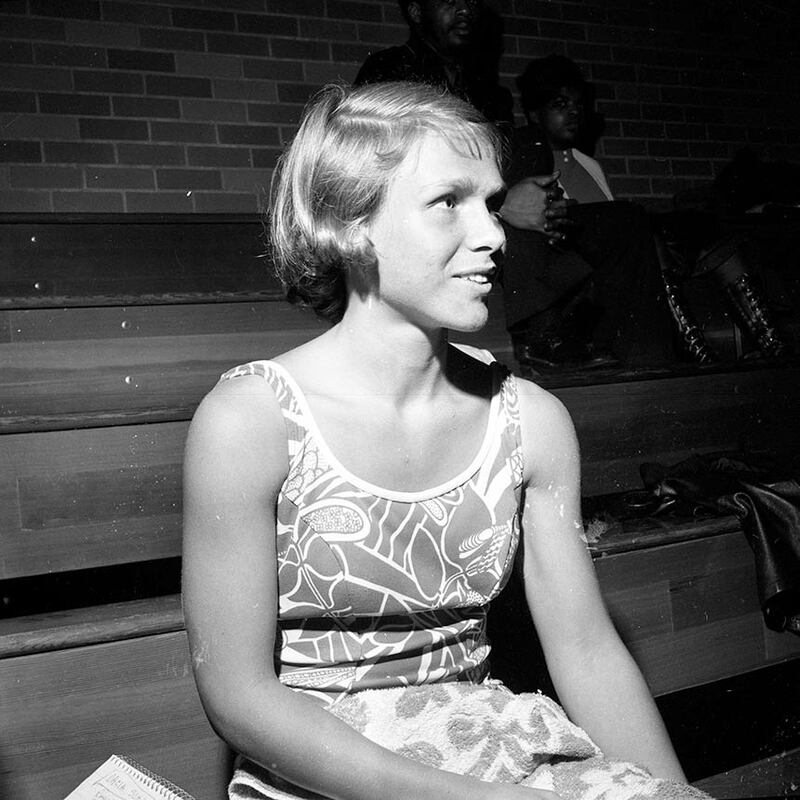 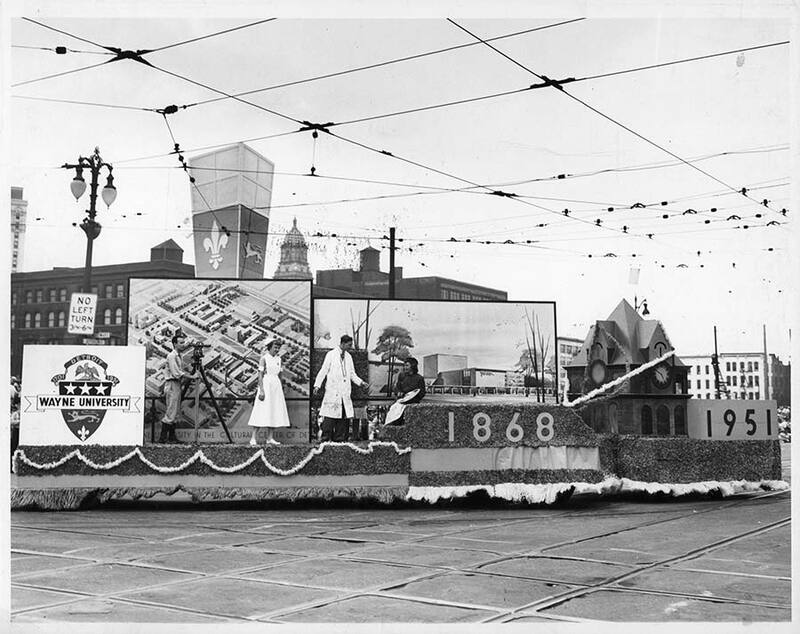 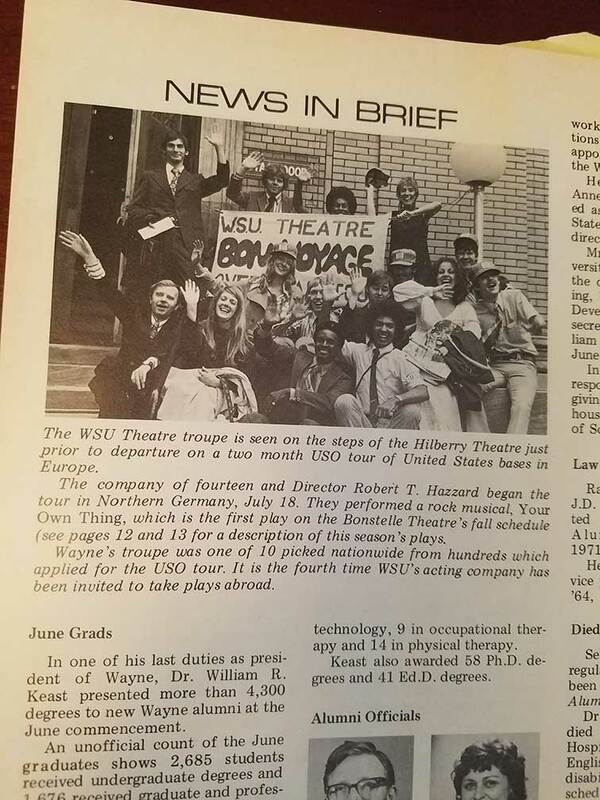 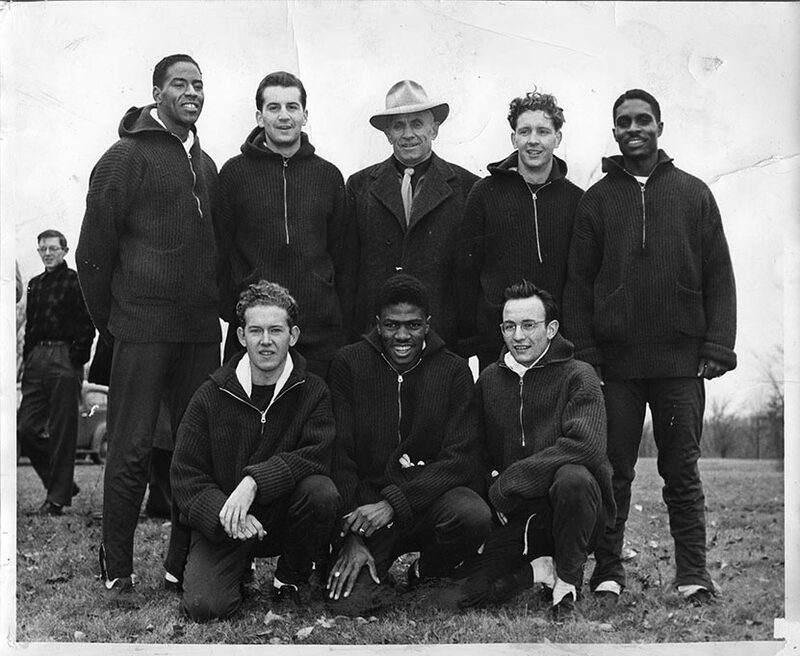 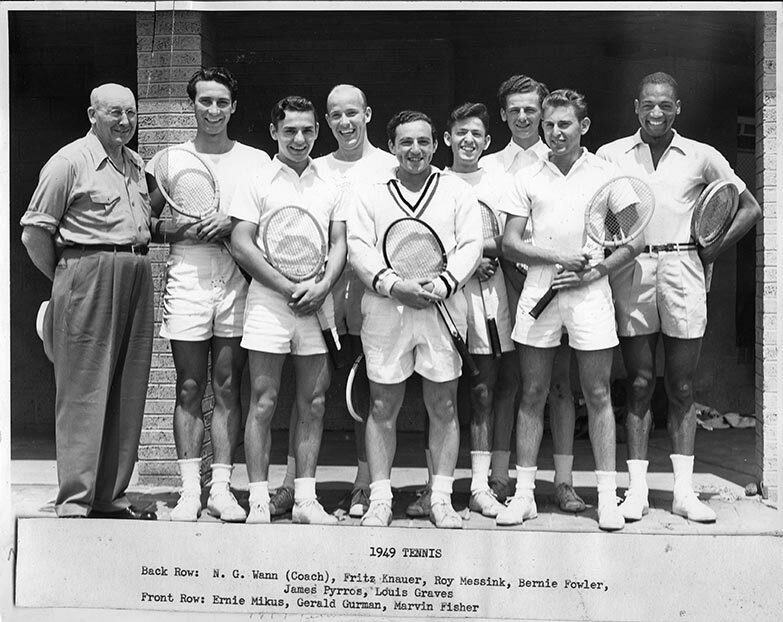 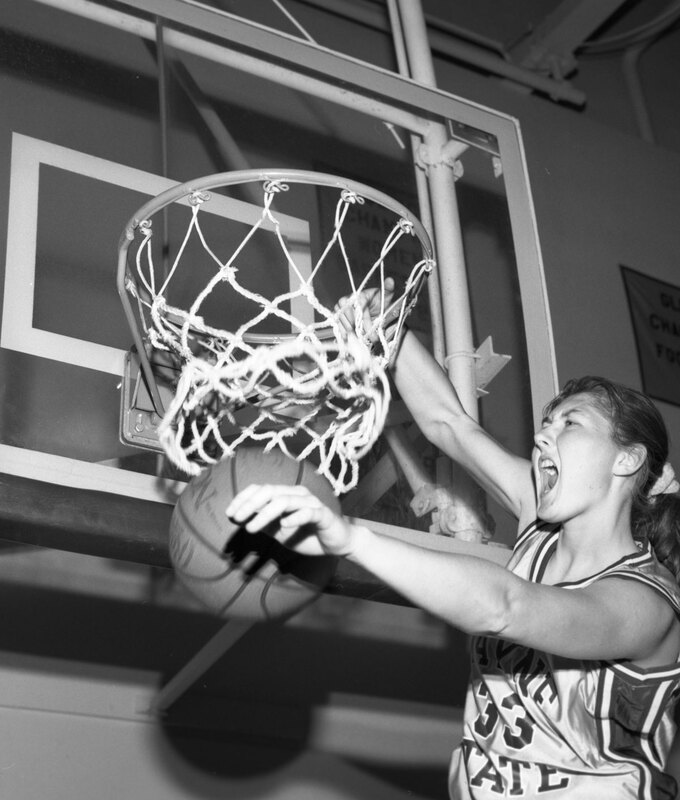 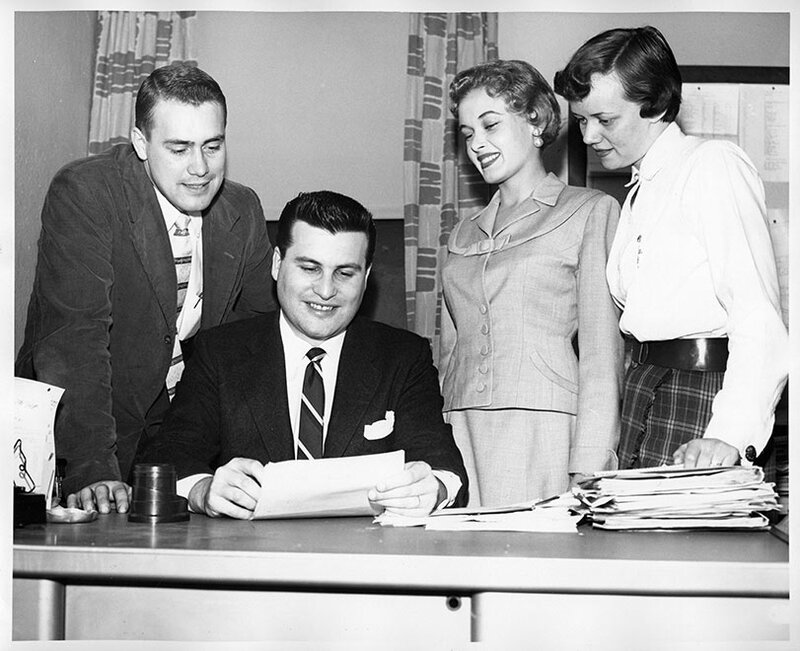 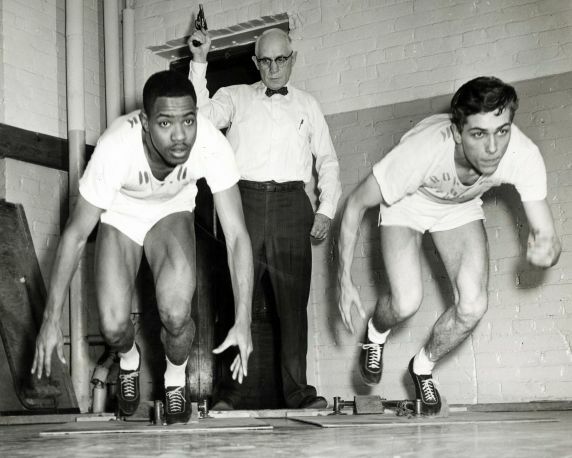 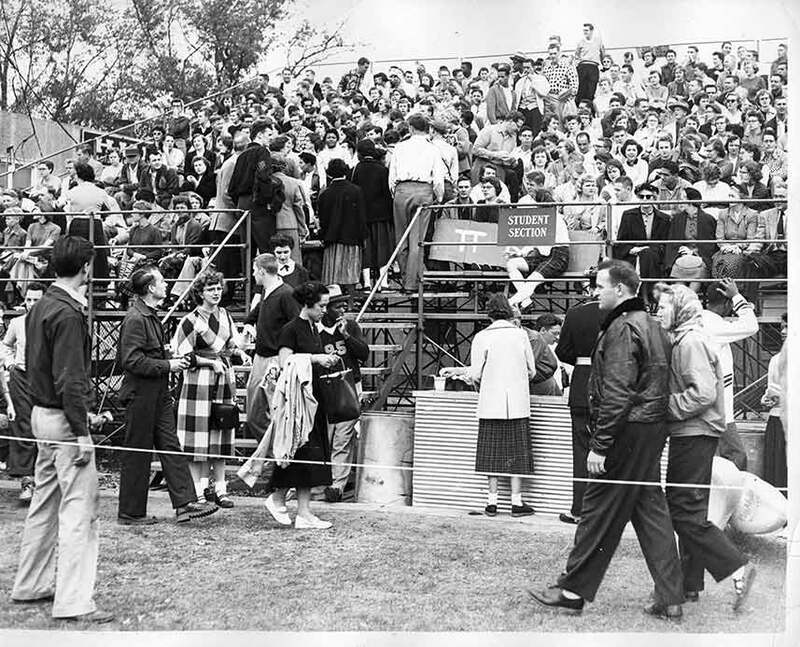 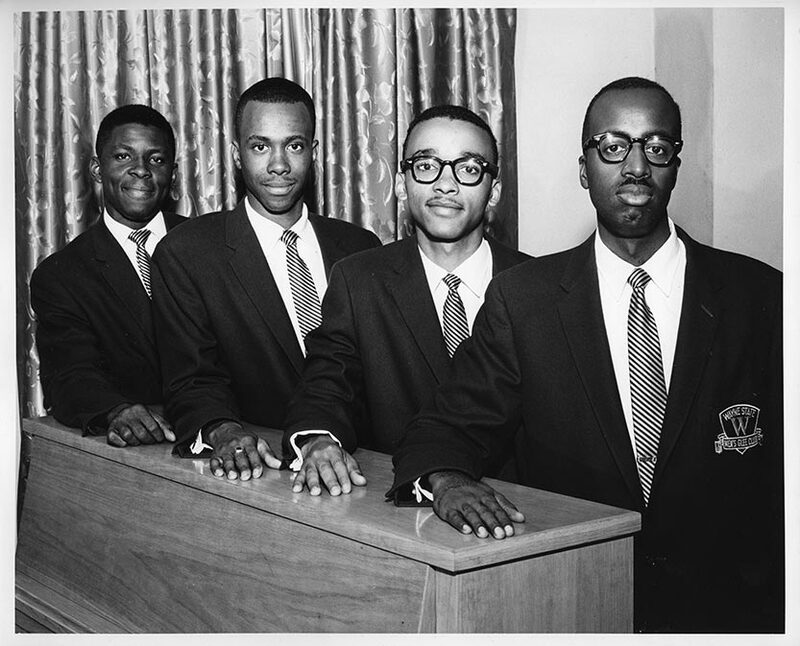 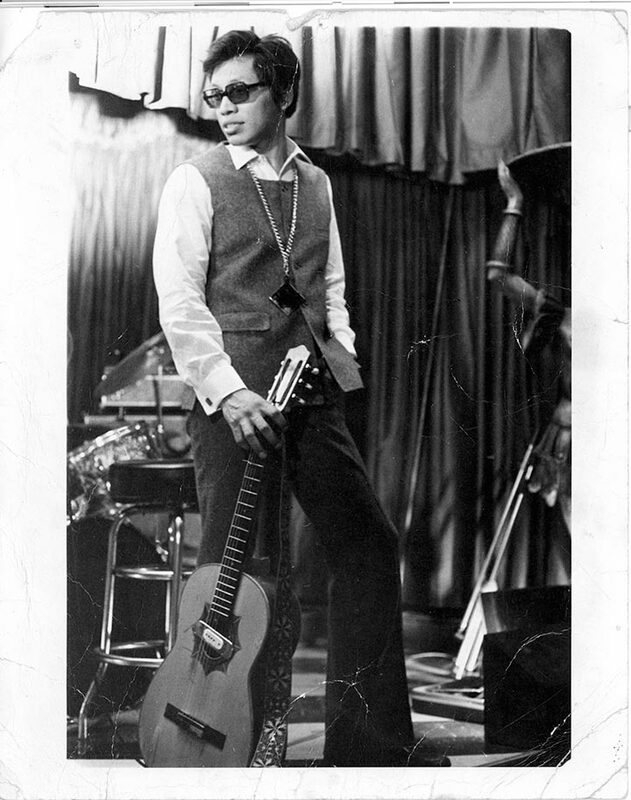 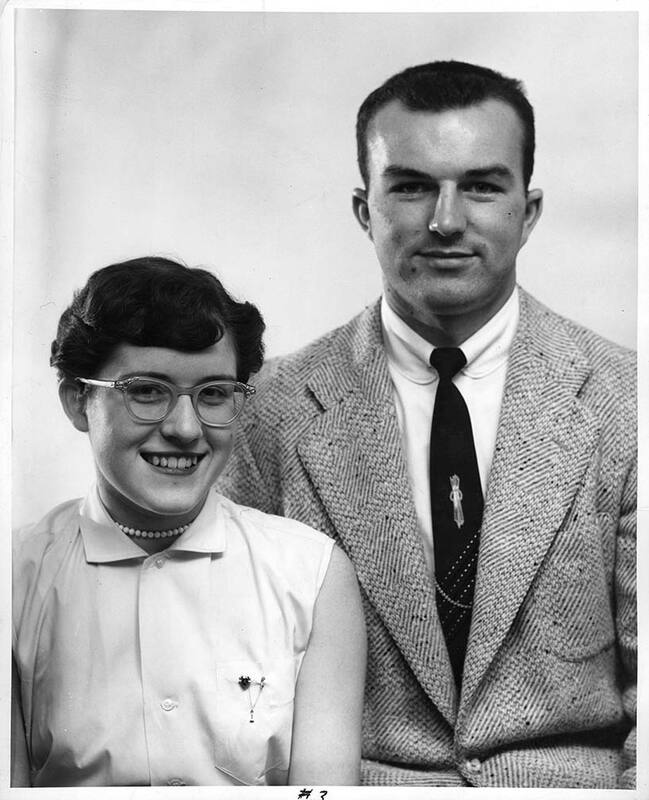 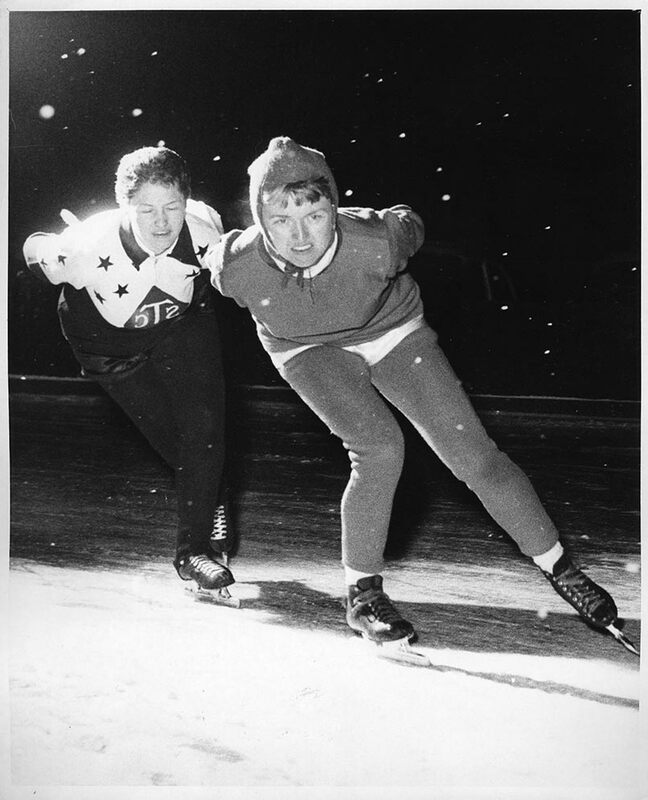 ’58) represents Wayne State in the university’s promotional materials. 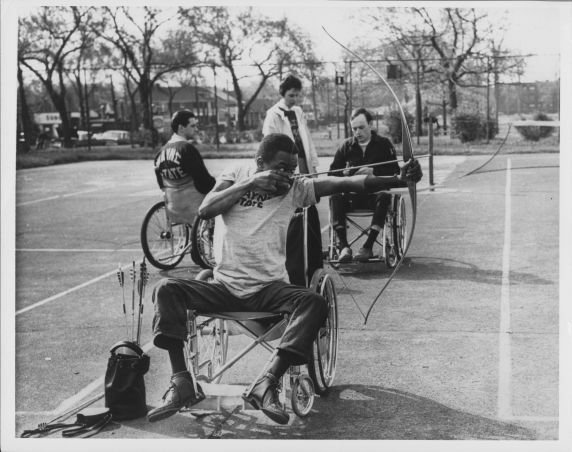 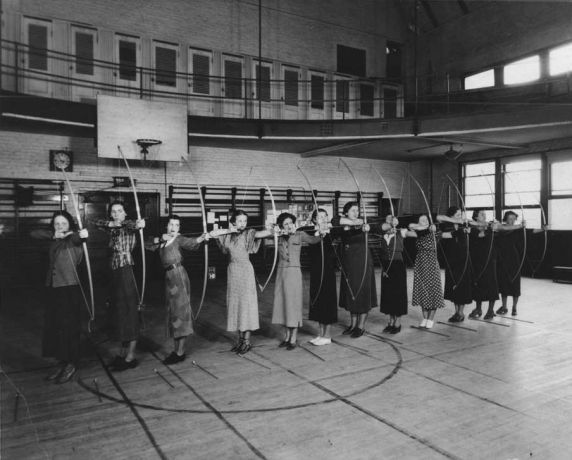 Women practice archery in a gymnasium once housed in Old Main. 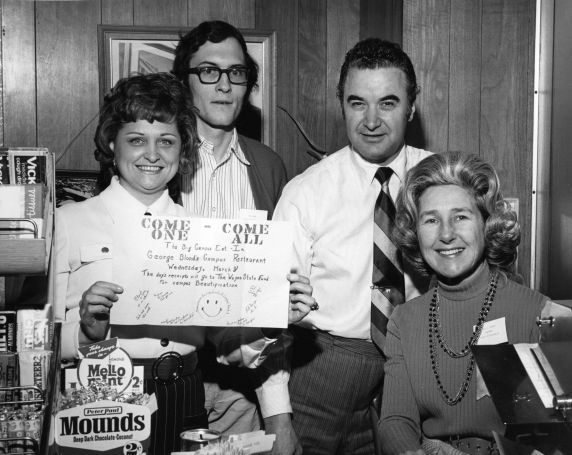 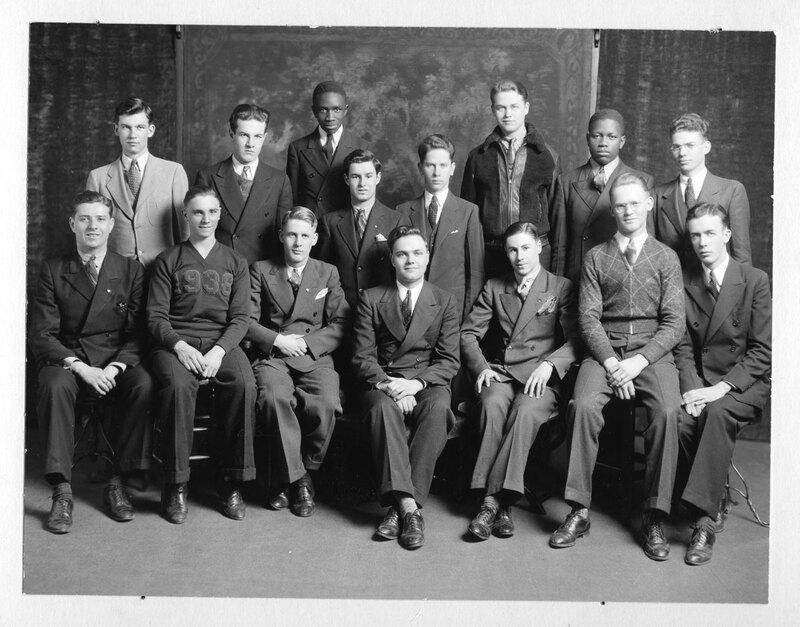 The Cheese Gang, a freshman disciplinary student organization, is founded. 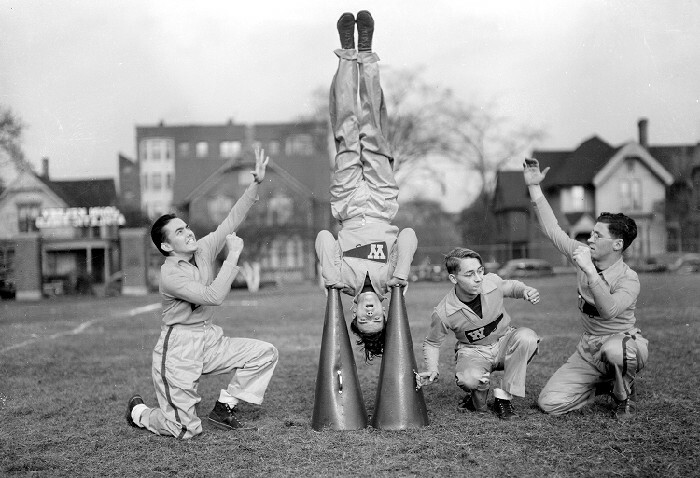 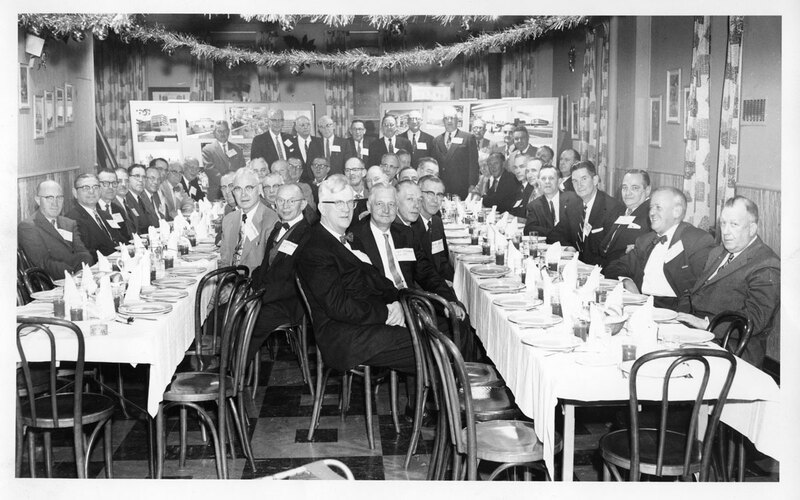 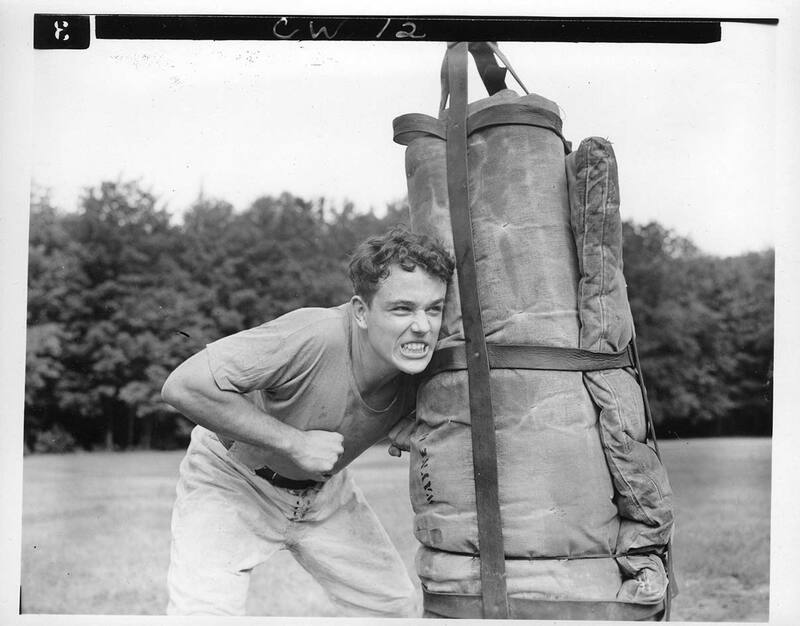 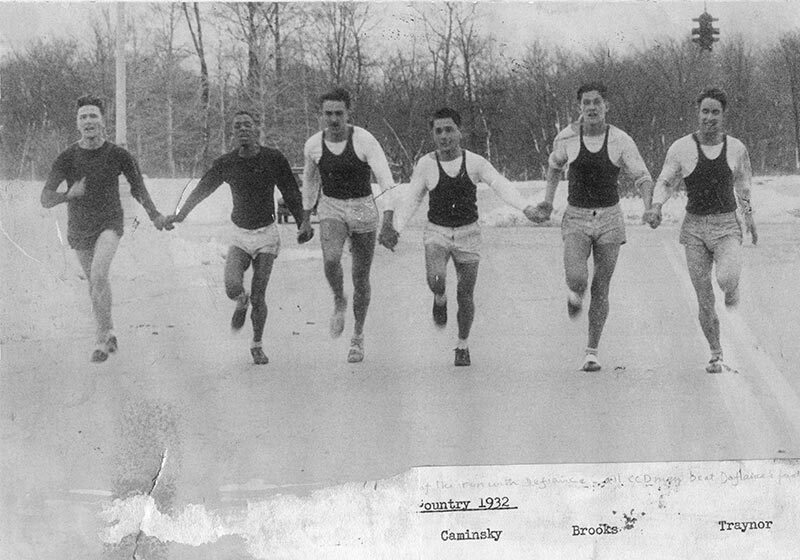 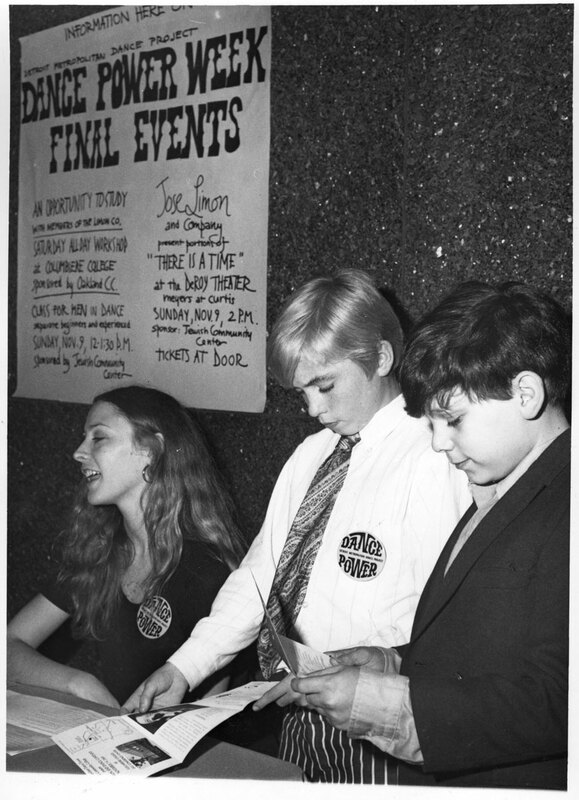 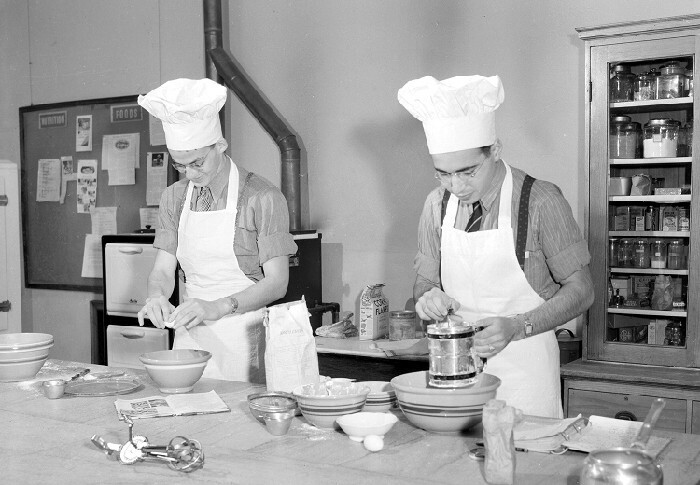 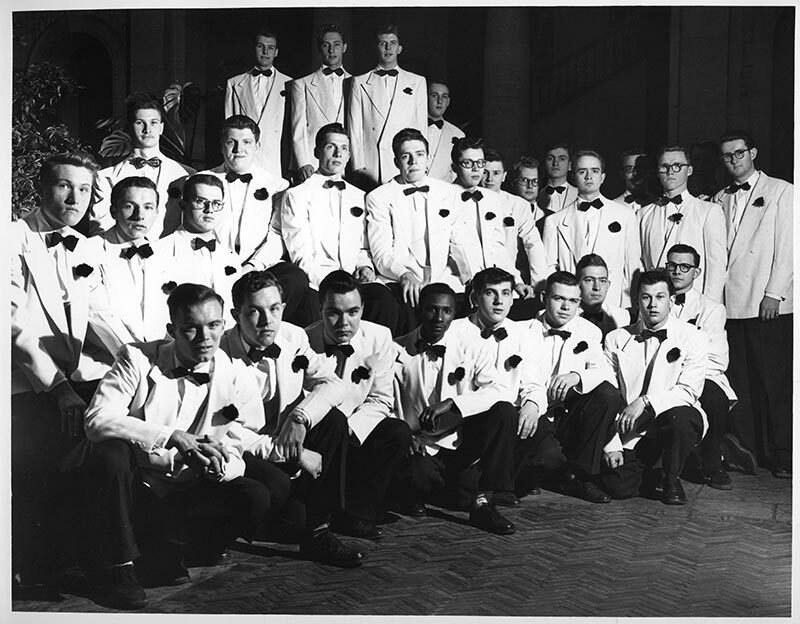 The Cheese Gang would later become the Chega fraternity, which affiliated with the national fraternity Phi Sigma Epsilon in 1942. 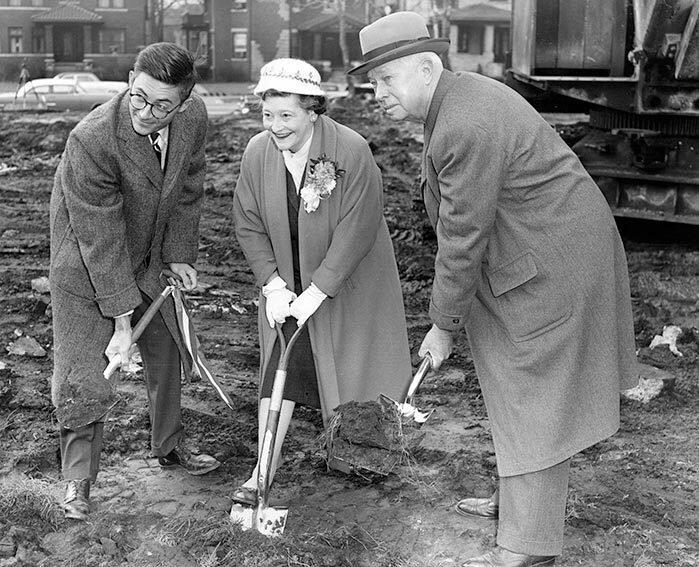 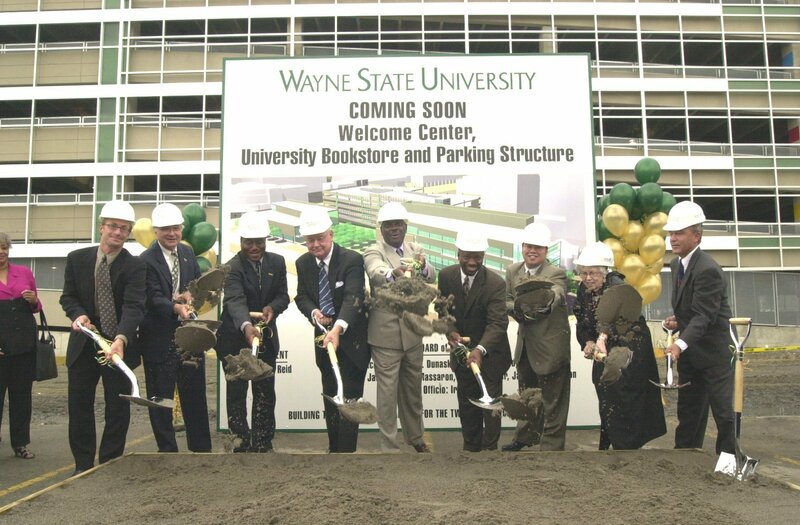 Wayne State breaks ground on the Welcome Center and bookstore. 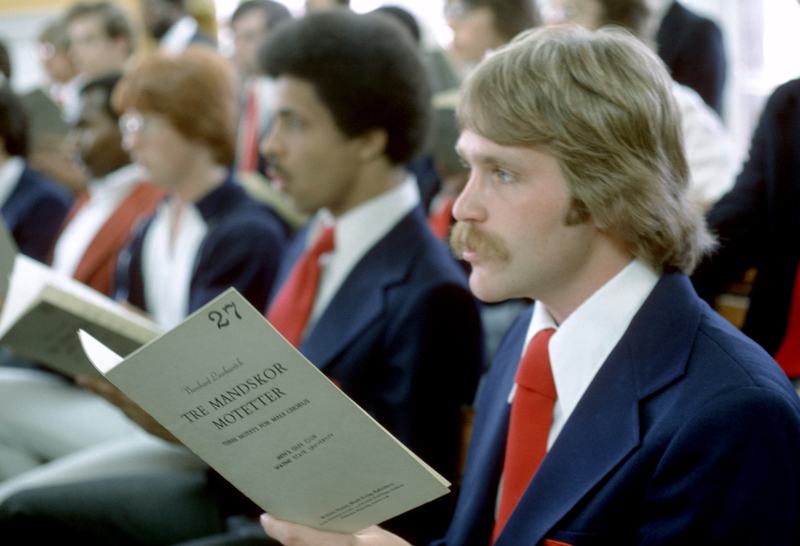 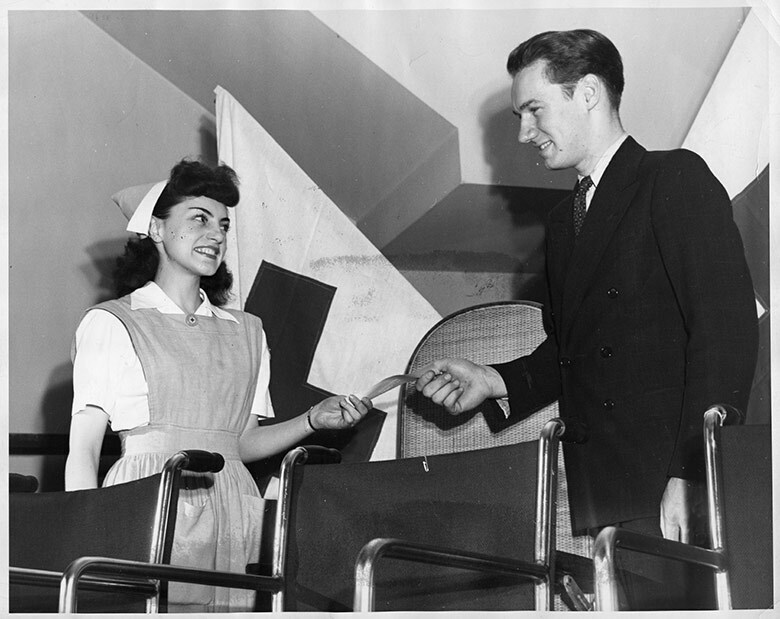 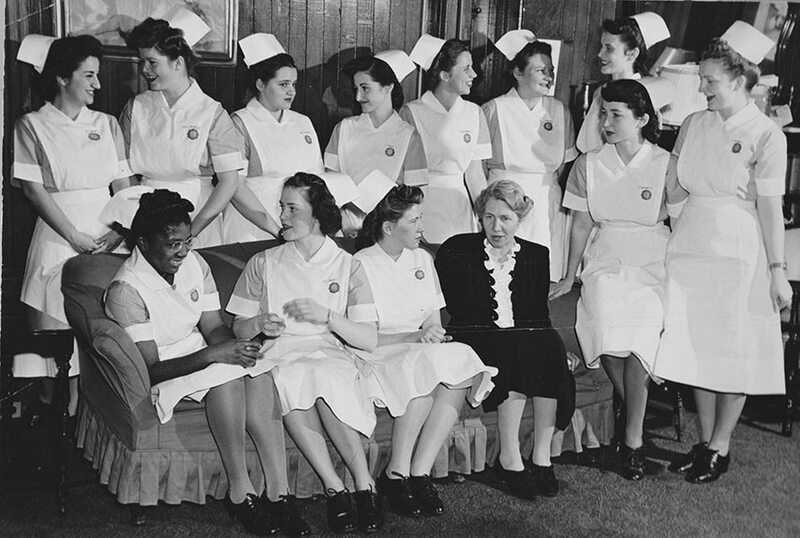 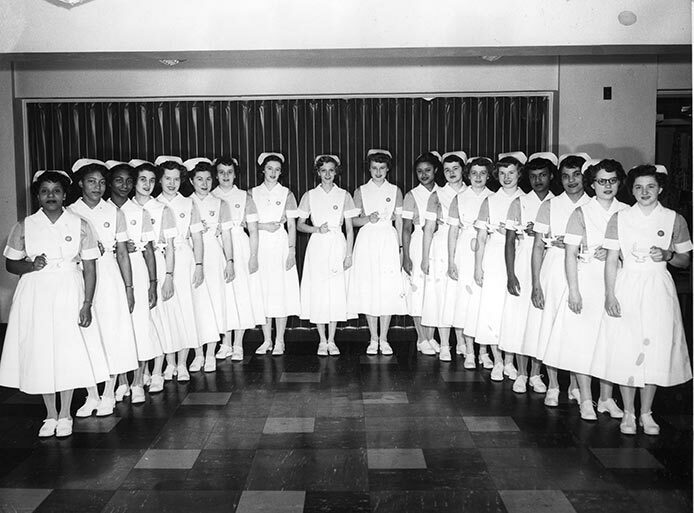 Our College of Nursing is founded. 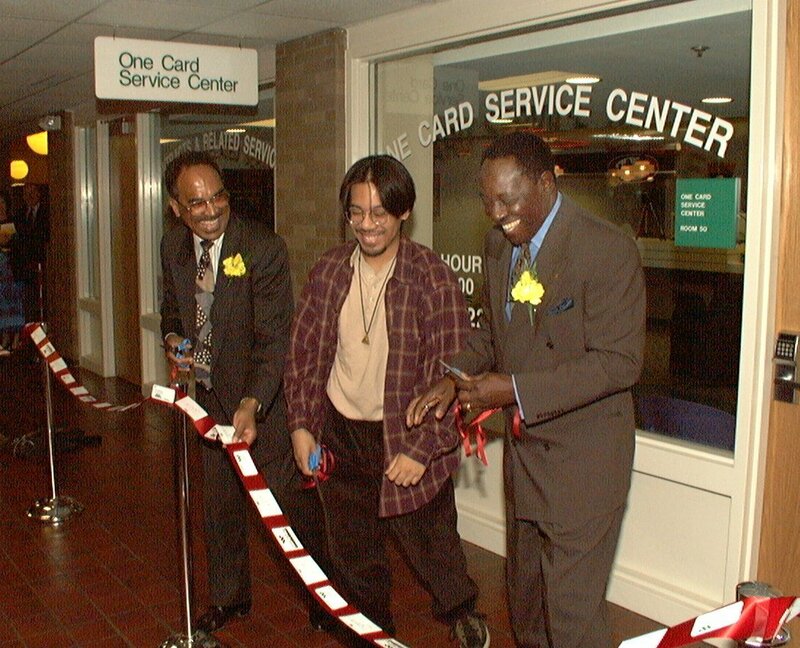 Wayne State launches the OneCard with a “card-cutting” ceremony in the Student Center. 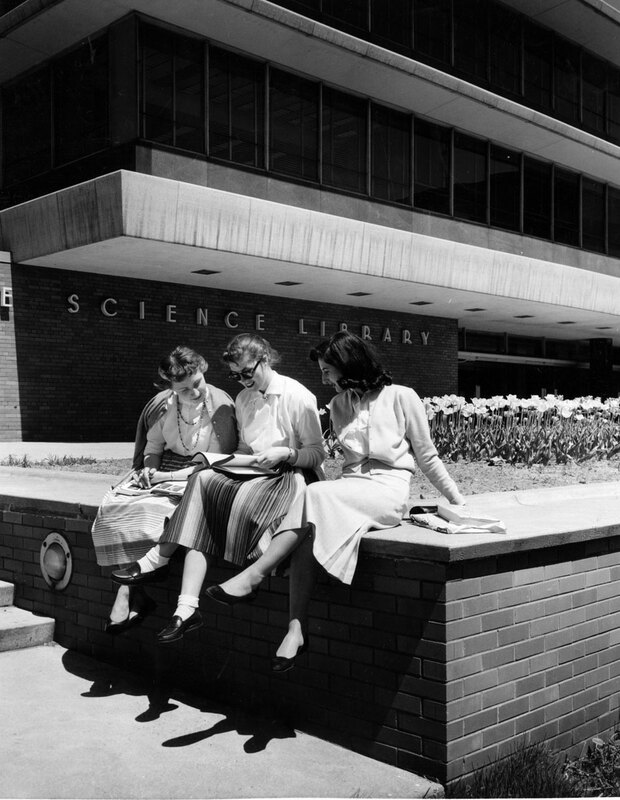 Science Library construction is completed on campus. 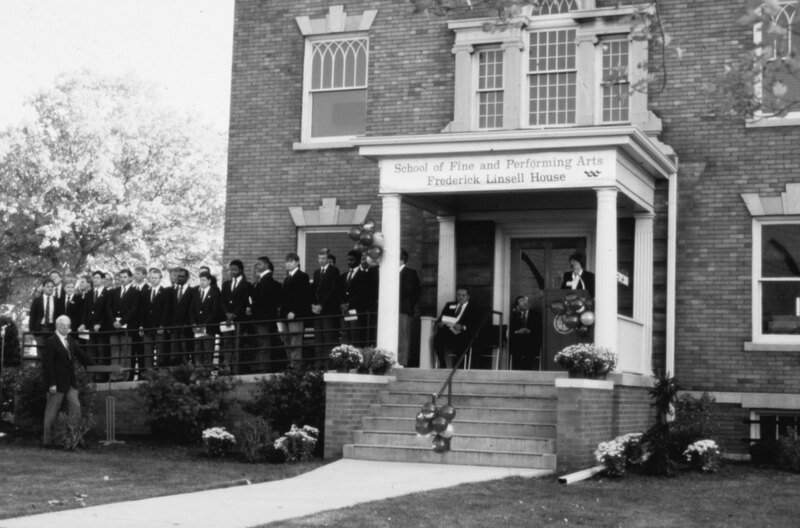 WSU dedicates the Frederick Linsell House as the Office of the Dean for the College of Fine and Performing Arts. 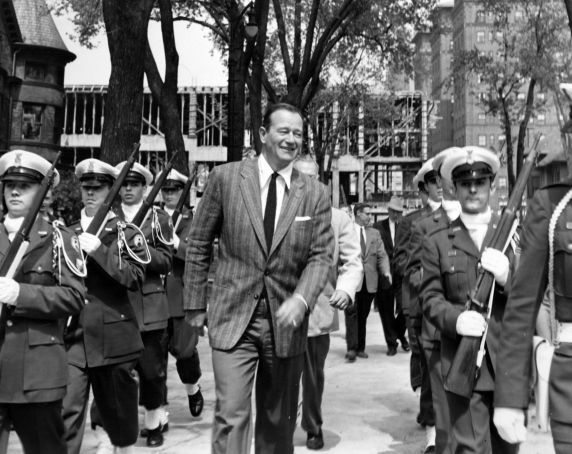 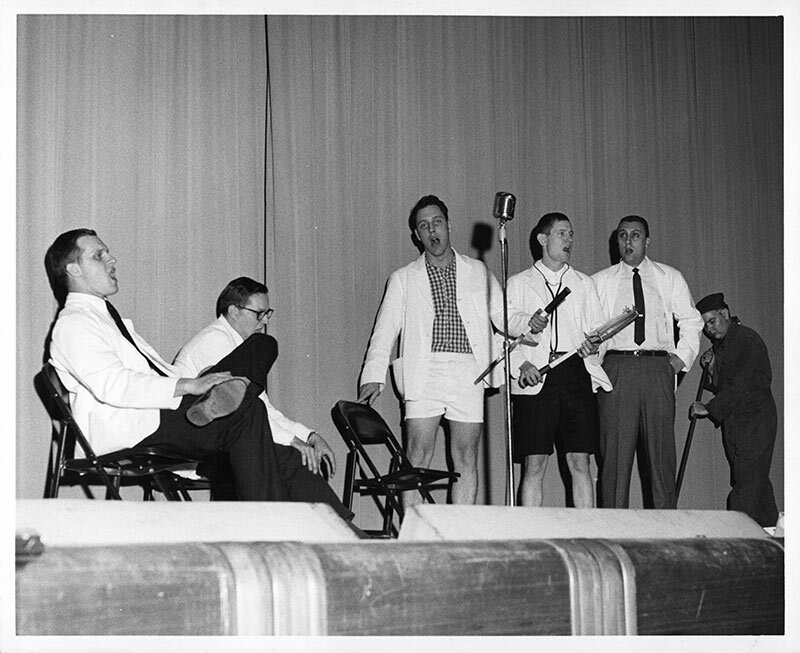 John Wayne hosts the "Miss Wayne University" pageant on campus as part of the promotional tour for his film, The Searchers. 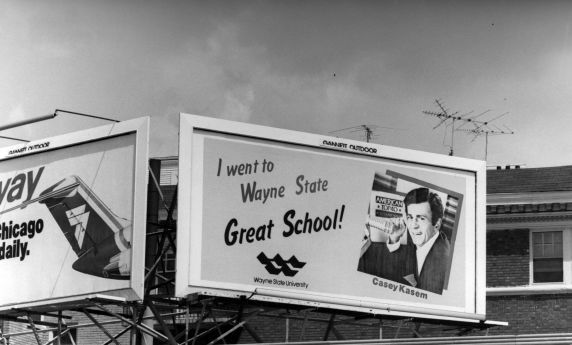 The Carnegie Foundation for the Advancement of Teaching recognizes Wayne State as a top-tier research university. 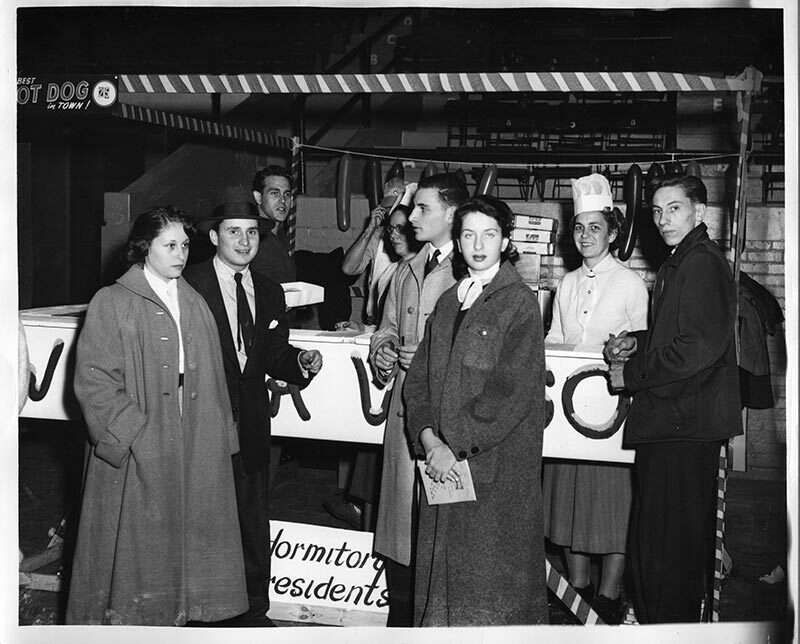 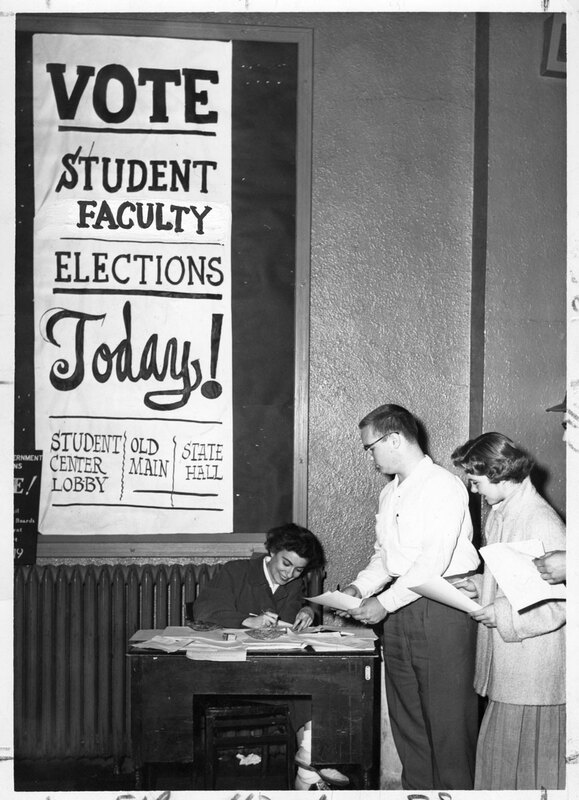 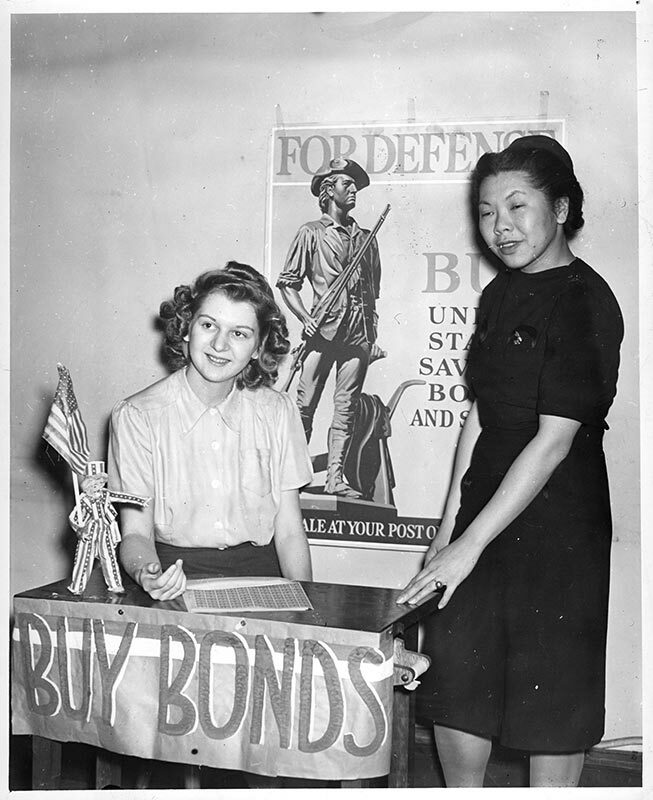 Since its formation in 1918, the university’s student council has held regular elections, such as this one (date unknown). 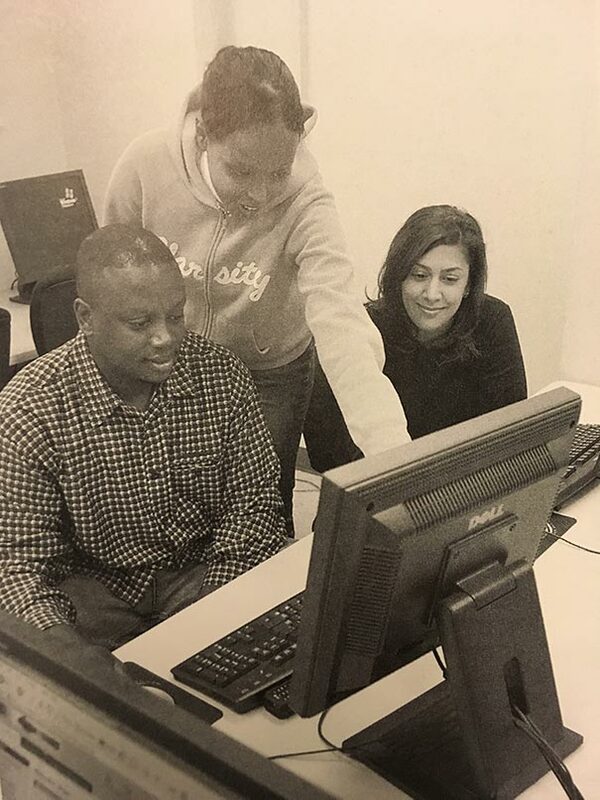 Wayne State students gain access to Gopher, a pre-HTML form of internet linking academic institutions across the country. 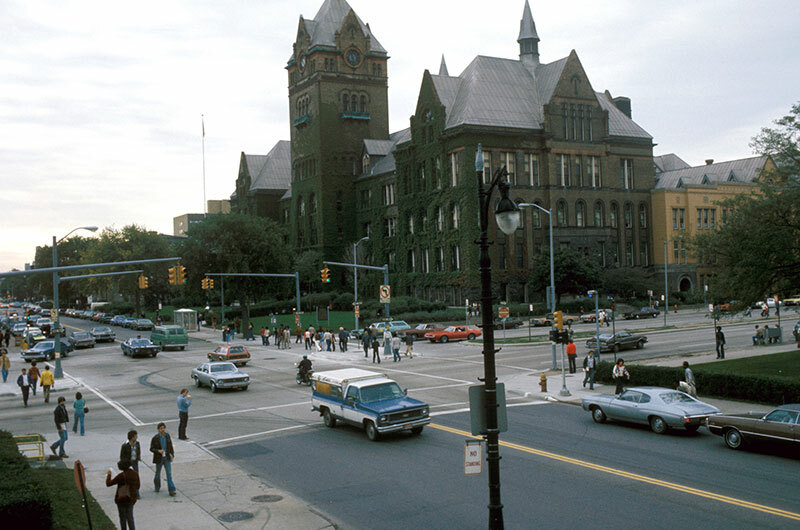 The Main Building (now Old Main) houses individual schools and colleges including the Detroit City Law School, Detroit Teachers College and the College of Pharmacy. 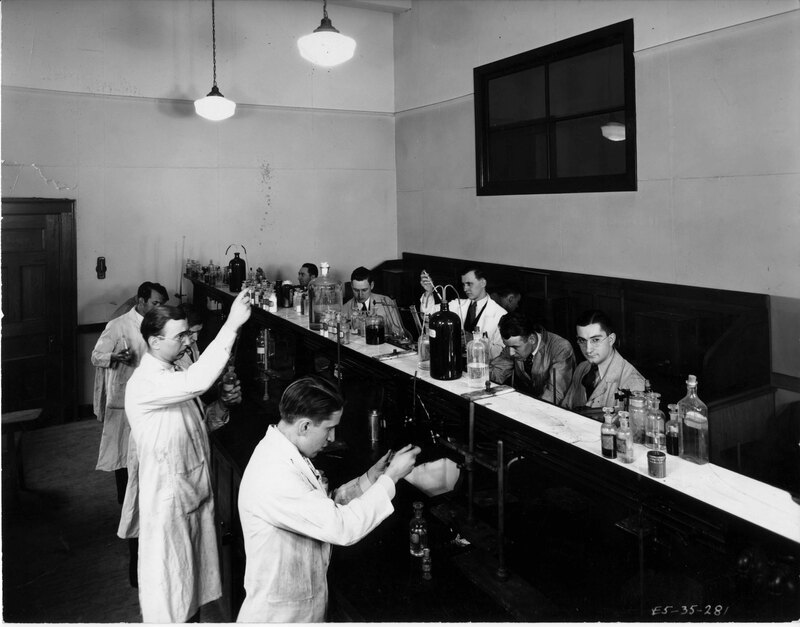 Here, College of Pharmacy students are pictured working in a laboratory. 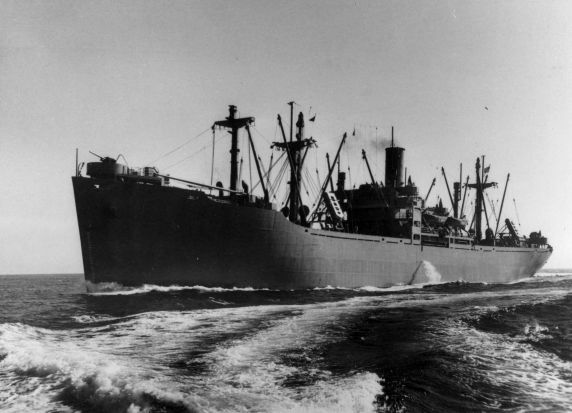 The SS Wayne Victory, a World War II cargo ship named after Wayne University, is launched. 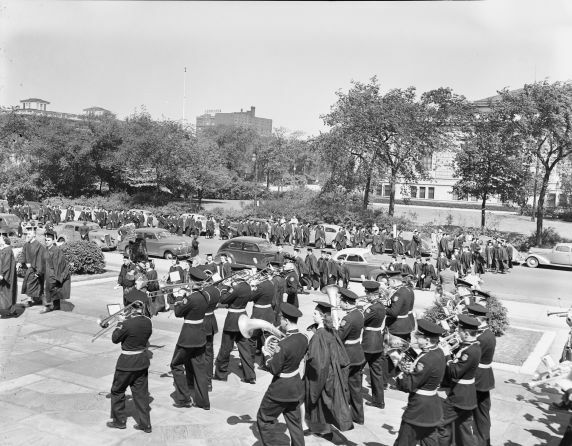 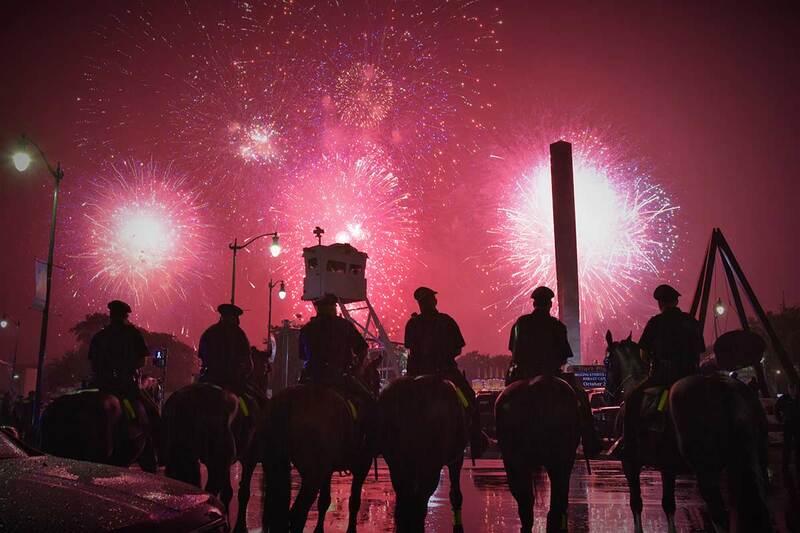 The ship served the military throughout the remainder of World War II, the Korean War and the Vietnam War. 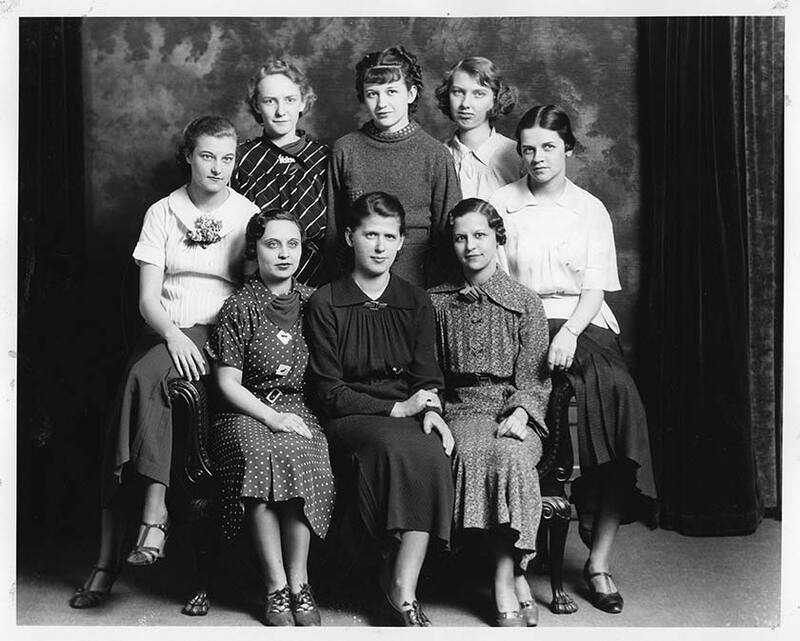 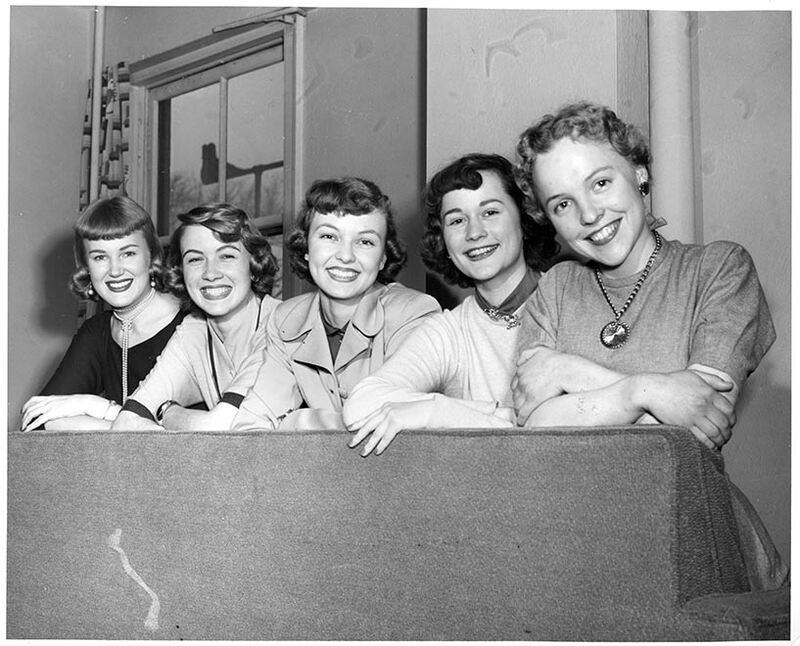 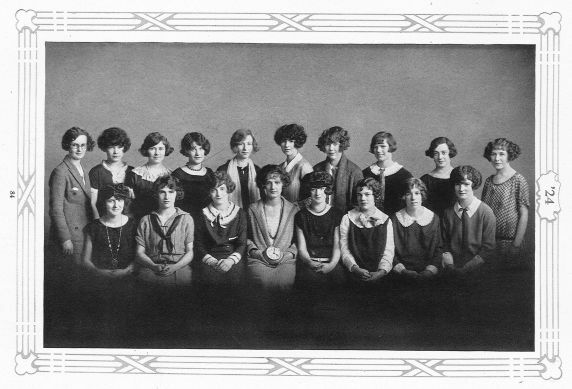 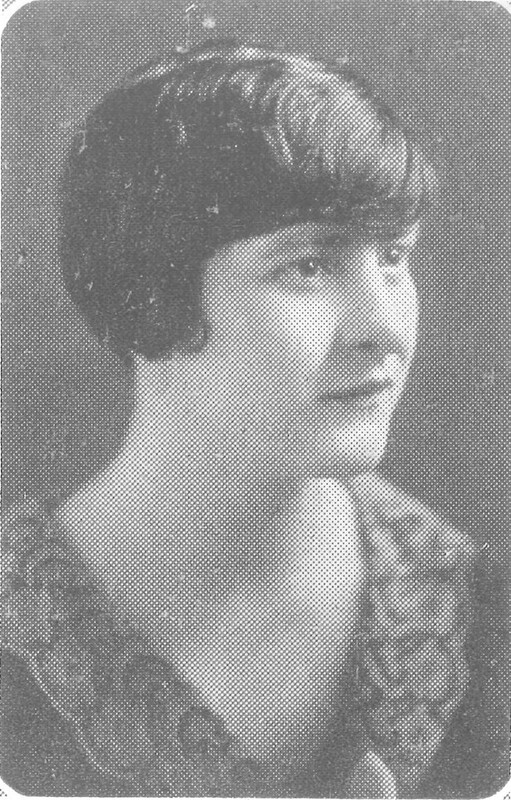 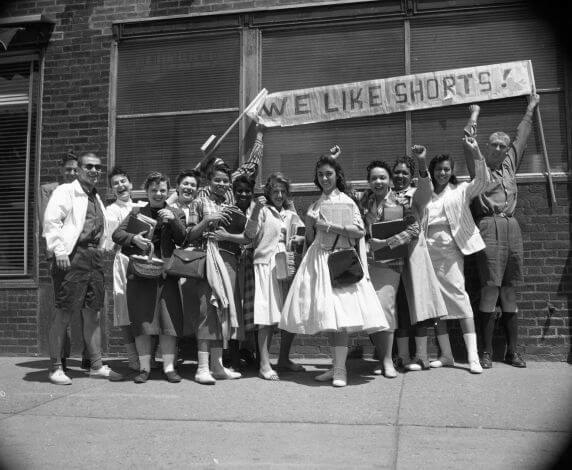 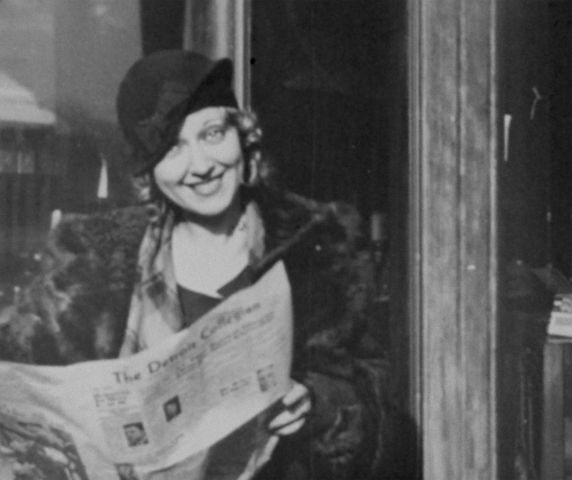 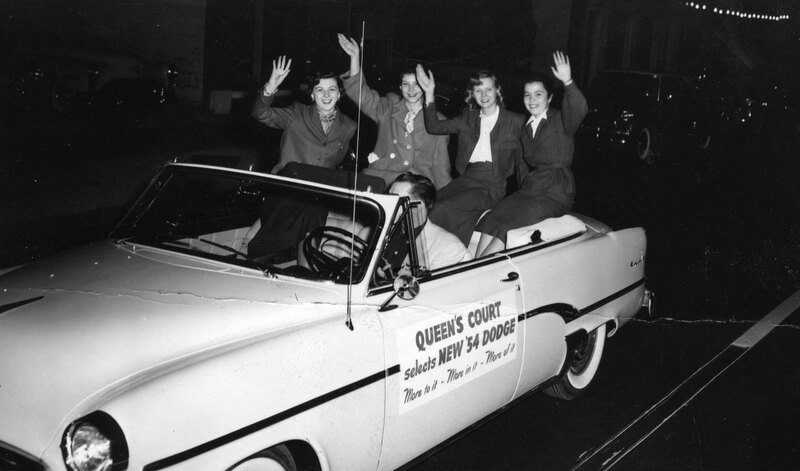 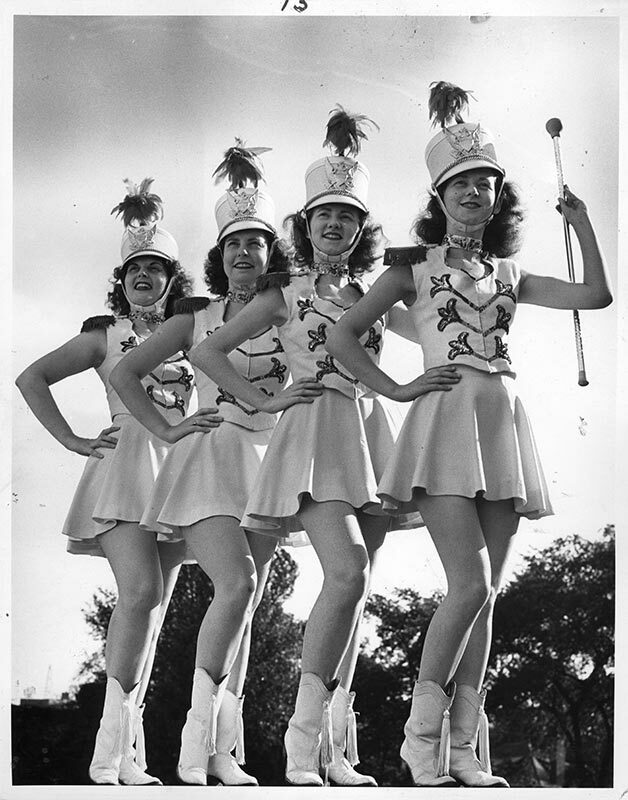 The first sorority on campus, An-Tik-Lik (later known as Alpha Theta Sigma), is established. 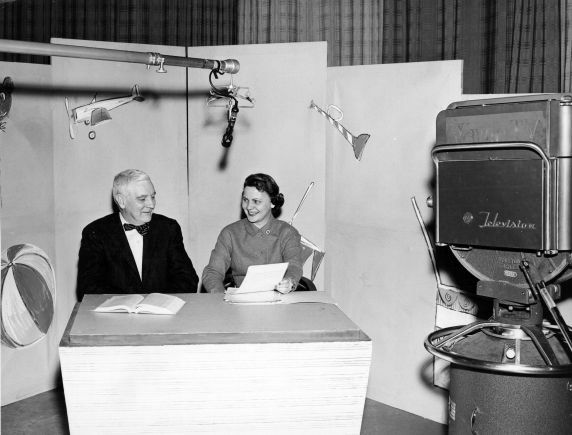 Wayne University’s WTVS-TV broadcasts an educational program, Preschooler, as part of the College of Education’s community outreach. 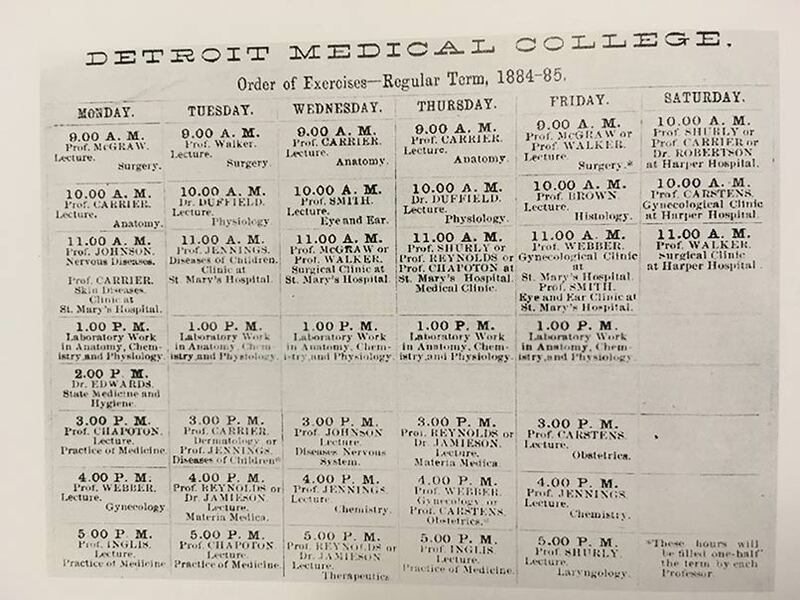 The Detroit Medical College, a predecessor of Wayne State University, is founded by five Civil War physicians.